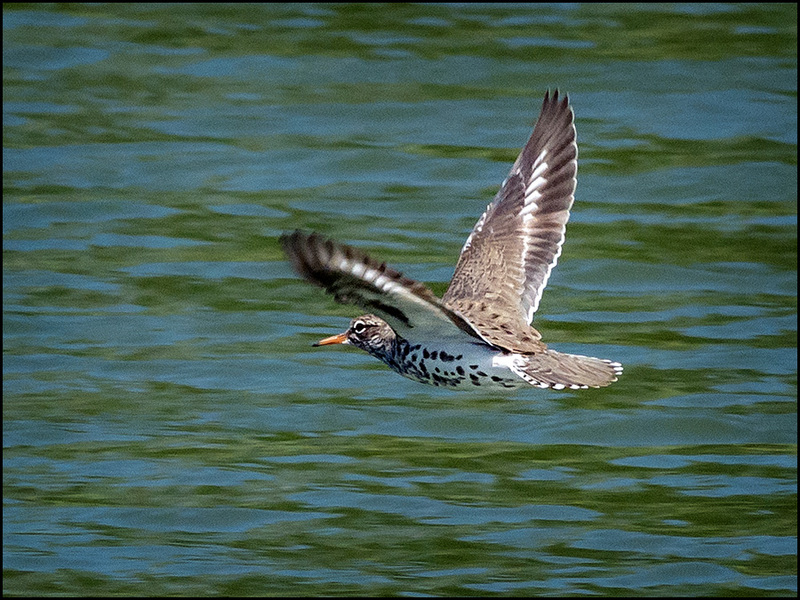 As we exit the month of June, I had a unique experience for the 2nd time regarding odd birds at odd times, sharing the same odd location! 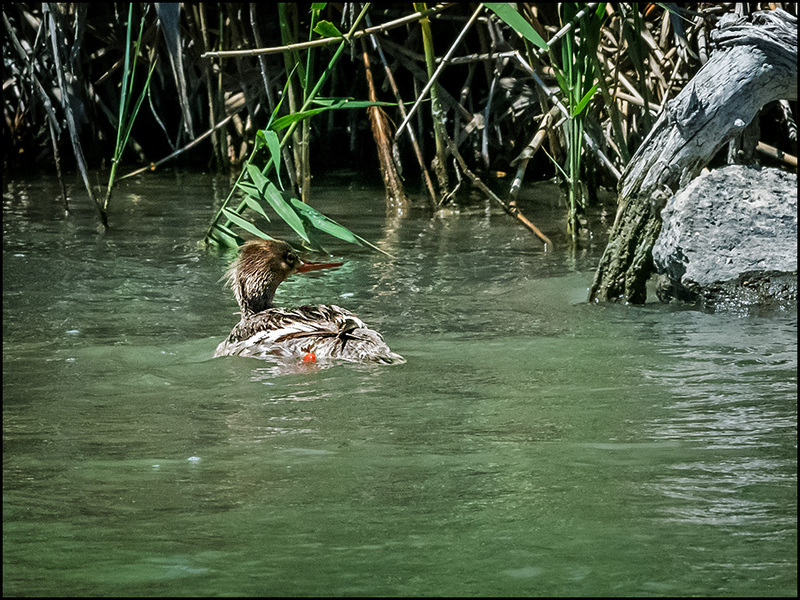 Last year, during the 3rd week of June along the Murray/Jordan River corridor, I discovered an out of place (season-wise) duck! 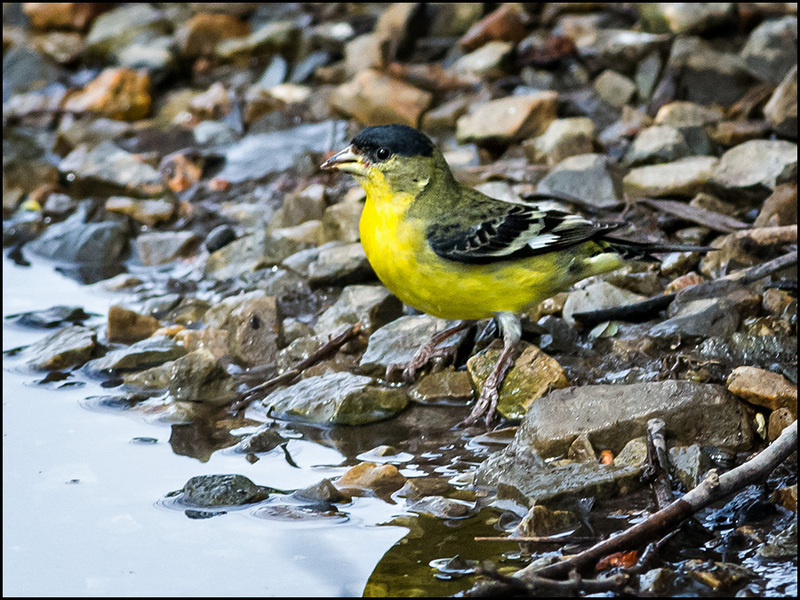 Then it located itself on a chunk of discarded concrete, streamside! 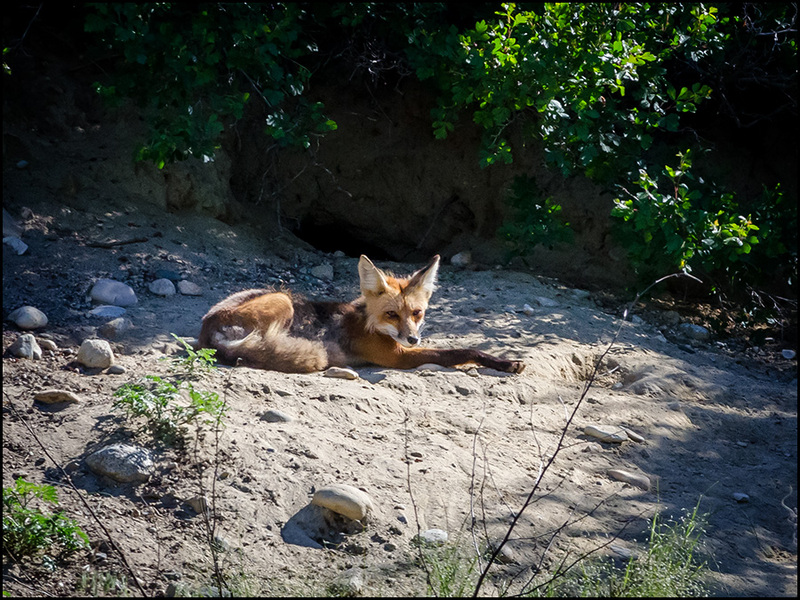 It settled in for a long siesta... 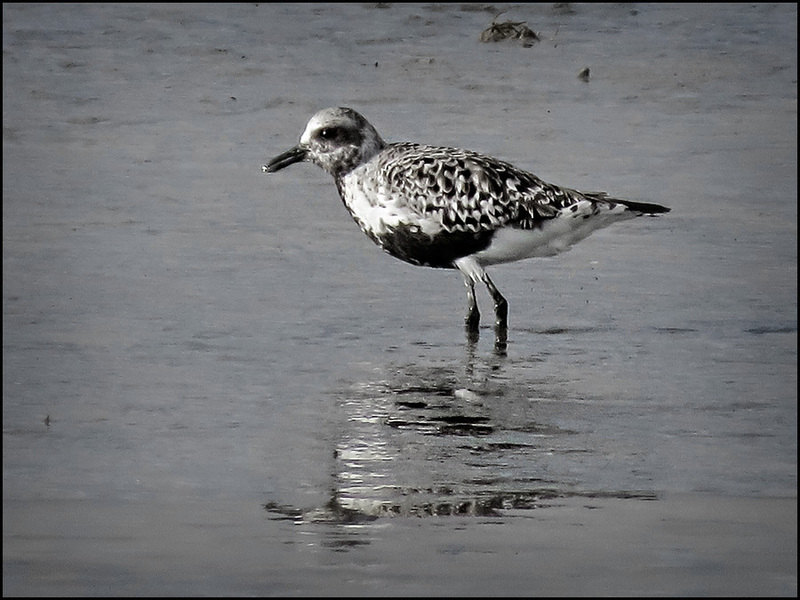 I checked again an hour or two later! 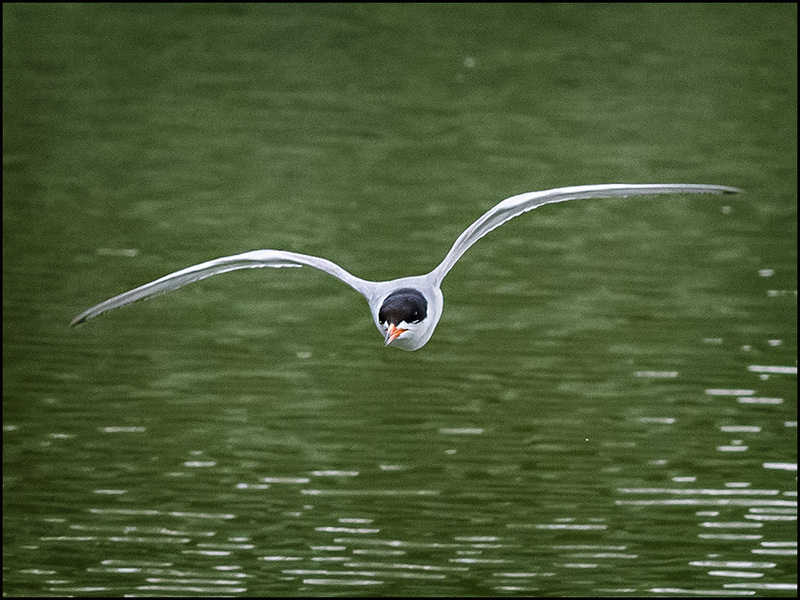 Fast-forward to yesterday, along the same river location...! 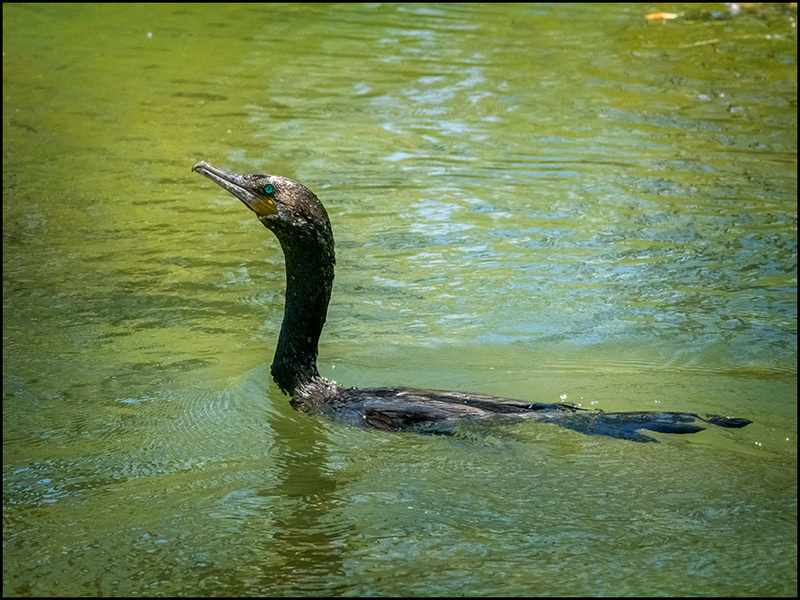 I noticed a familiar but out-of-place (season-wise) profile of a swimming duck! 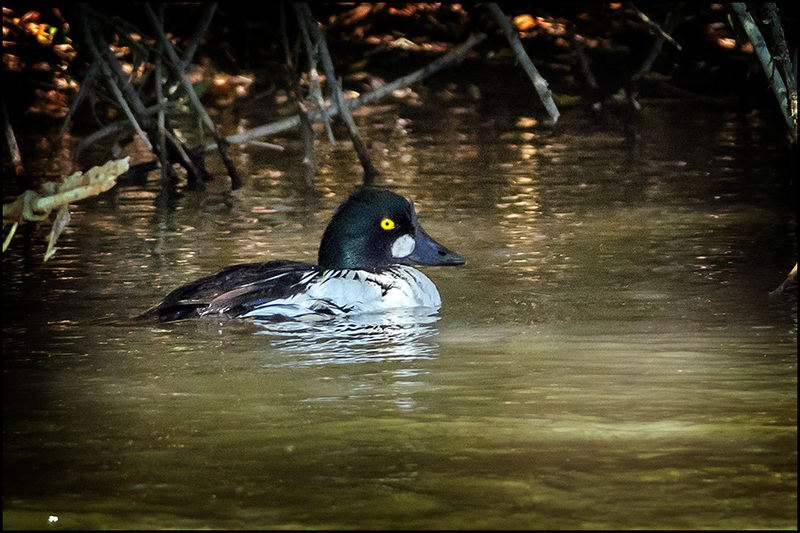 The bird exited the water by climbing onto the same chunk of concrete the Common Goldeneye occupied exactly a year earlier! 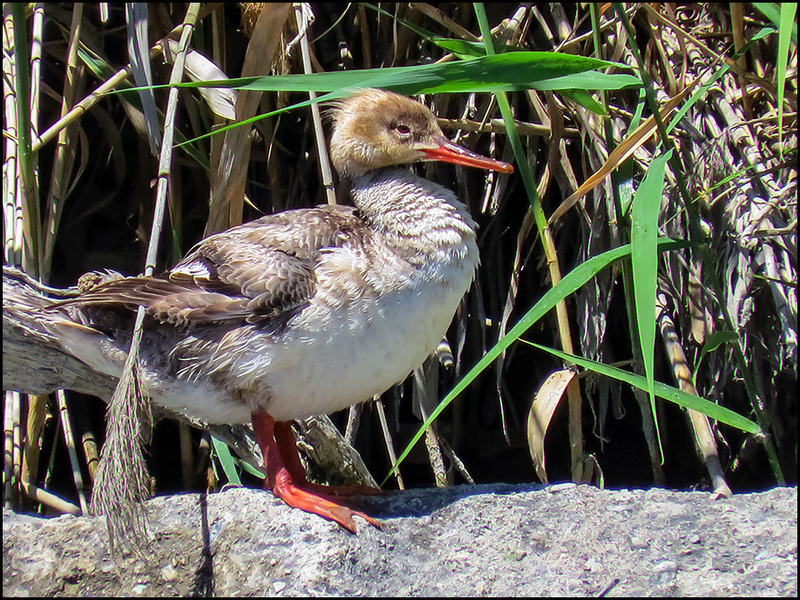 Correct me if I'm wrong; but I believe this odd bird (season-wise) is a female Red-breasted Merganser, duplicating my experience from a year earlier! 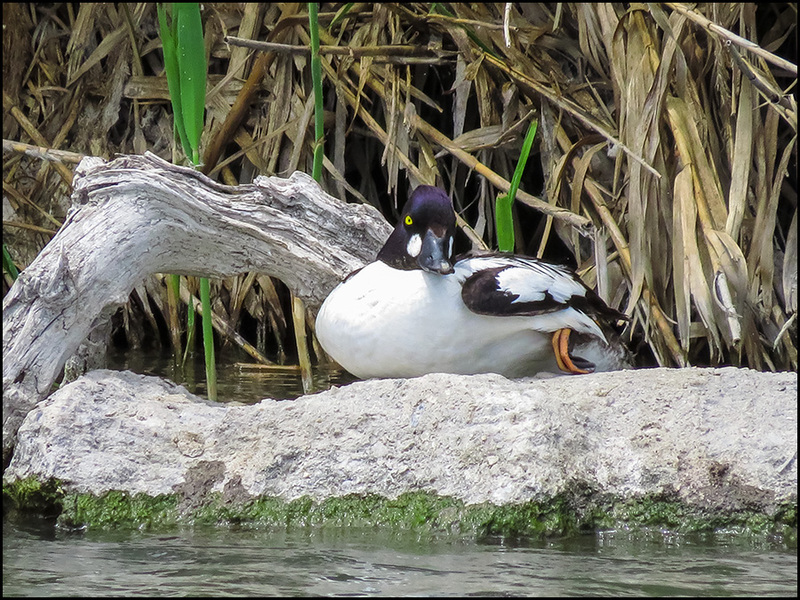 What are the odds for 2 out-of-season ducks showing up at the exact same odd location at the exact same time, a year apart?! 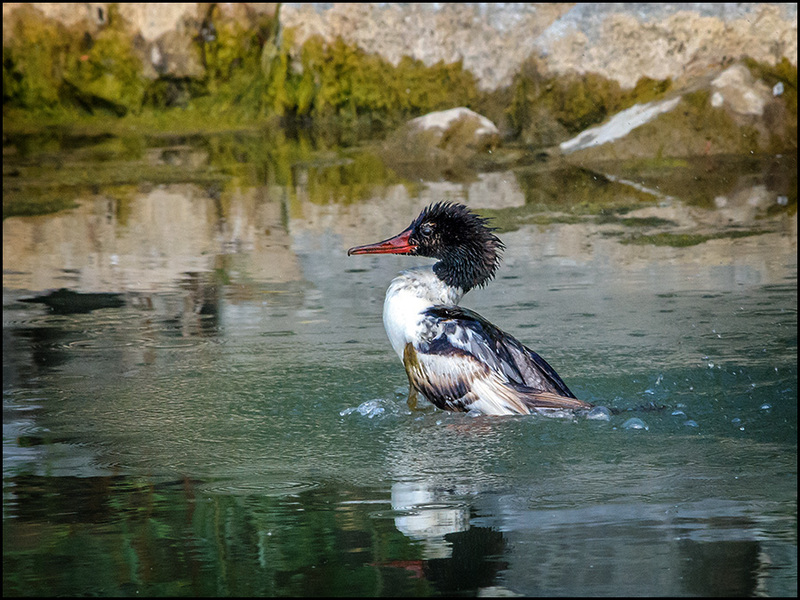 All this reminds me of a 3rd 'odd duck' I discovered near the same location (Mill Race Pond) in July, 2010... a stray Common Merganser!! 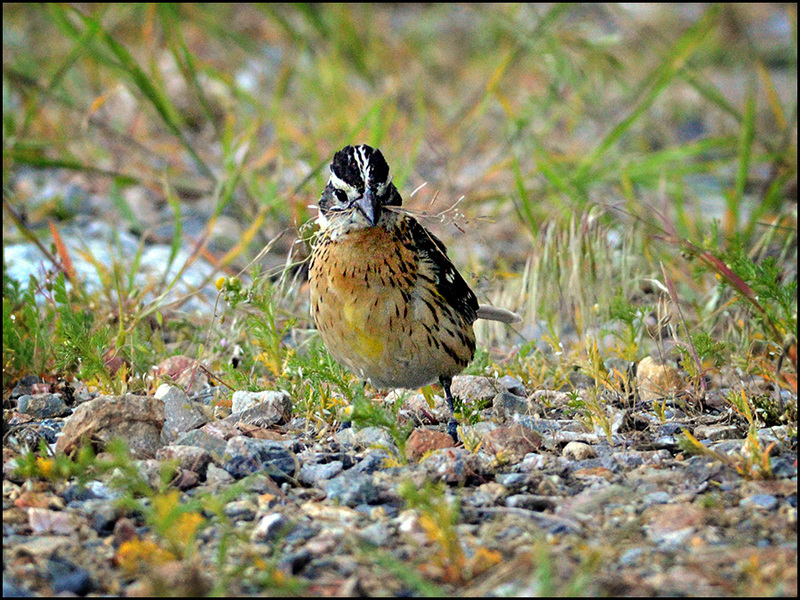 More about this bird later!! 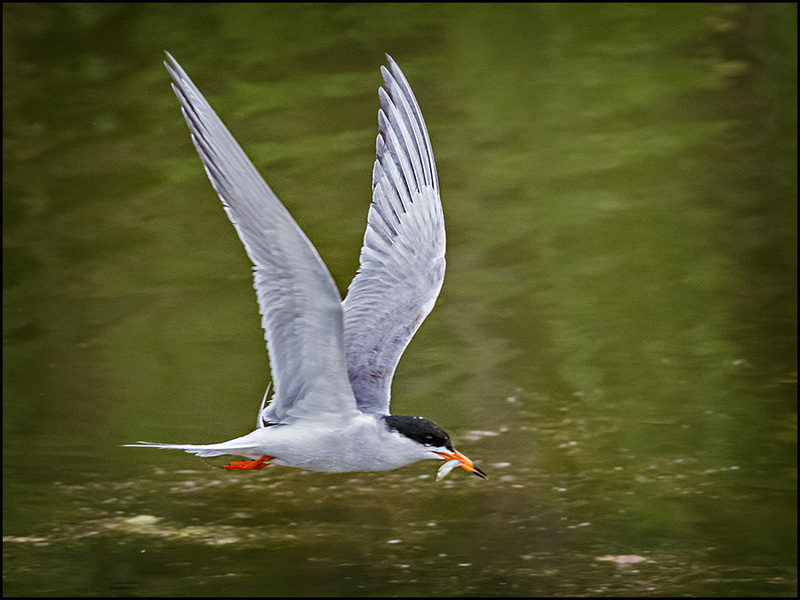 The Forster's Tern that repeatedly turned my days at Mill Race Pond into pleasant ones failed to re-turn this week! 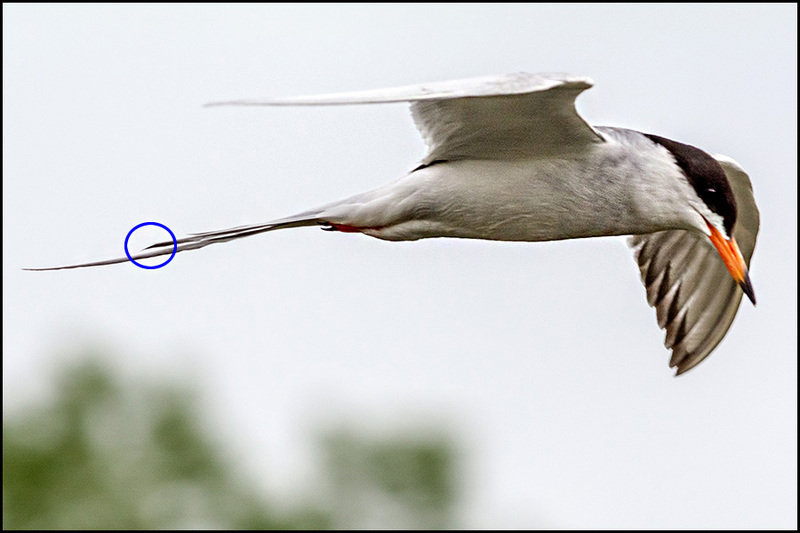 He was distinguished by having a shortened right "fork" (tailfeather) as seen below. 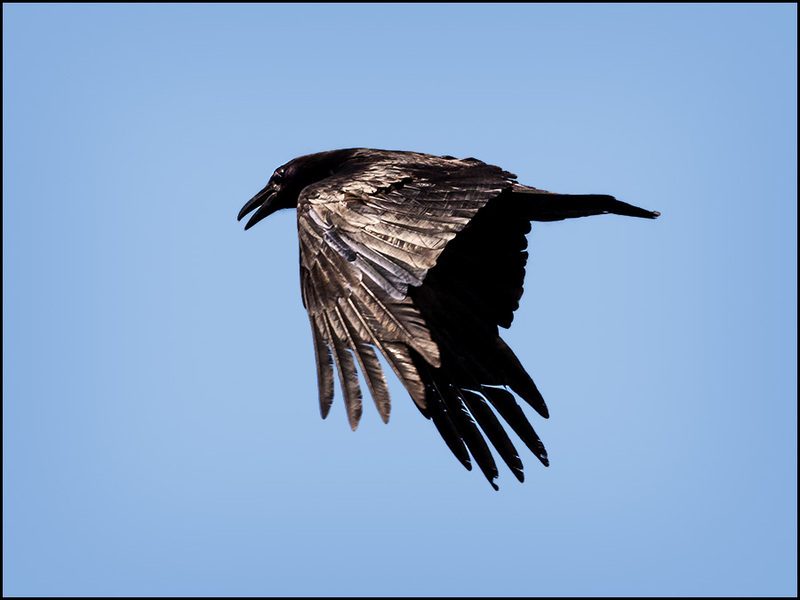 Another view of the abbreviated right tailfeather. 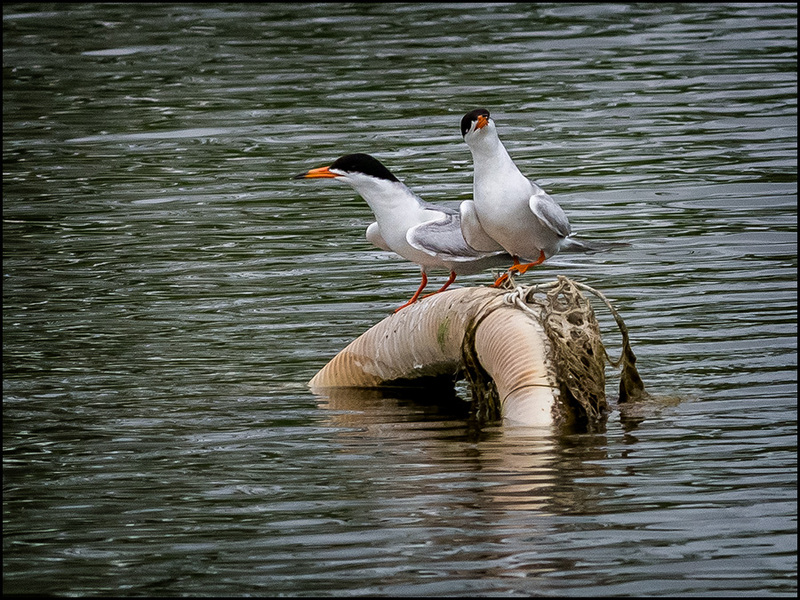 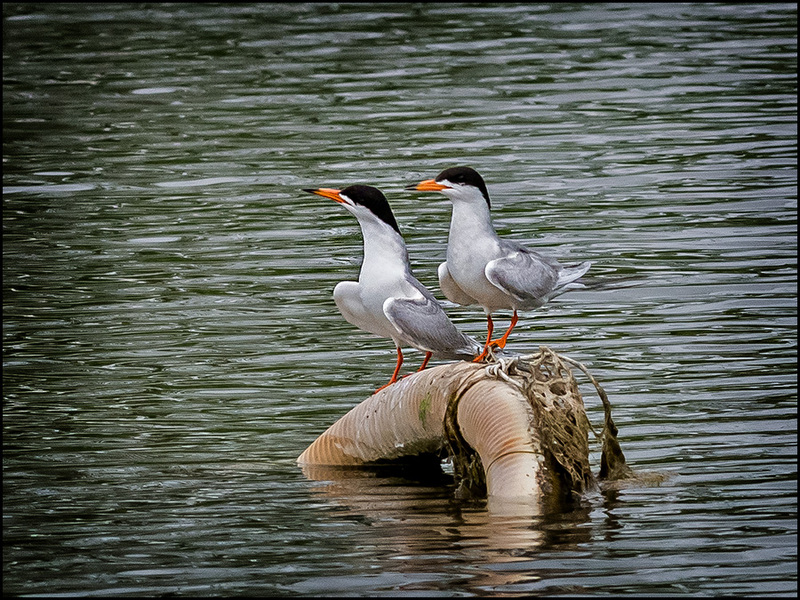 2 other Forster's Terns (apparently paired) showed up, but never foraged there. 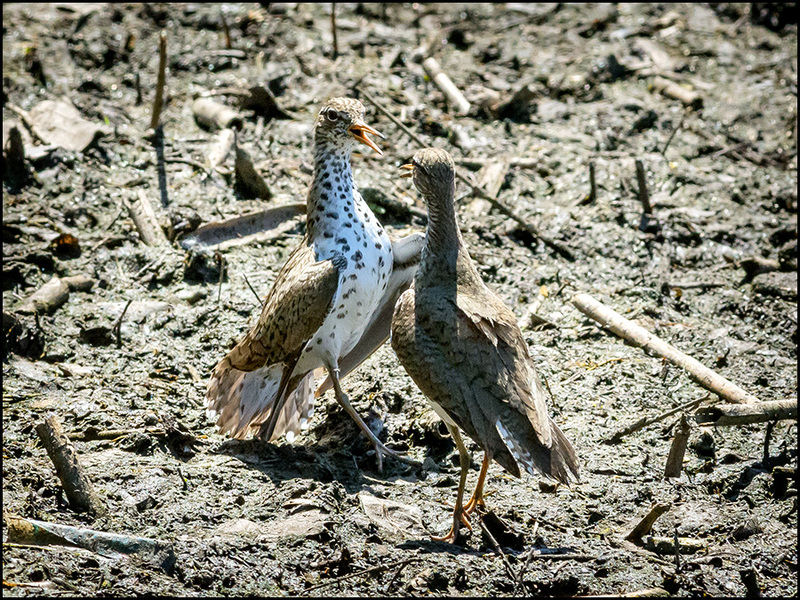 Rather, they hung out, and harassed the single bird! 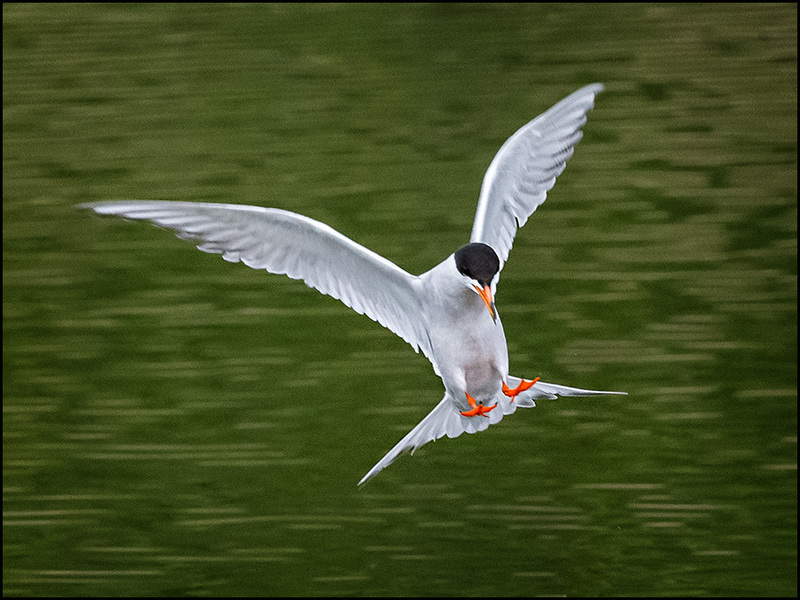 One of the pair flew in from behind and surprised my Forster's tern by grabbing him at the back of the head! 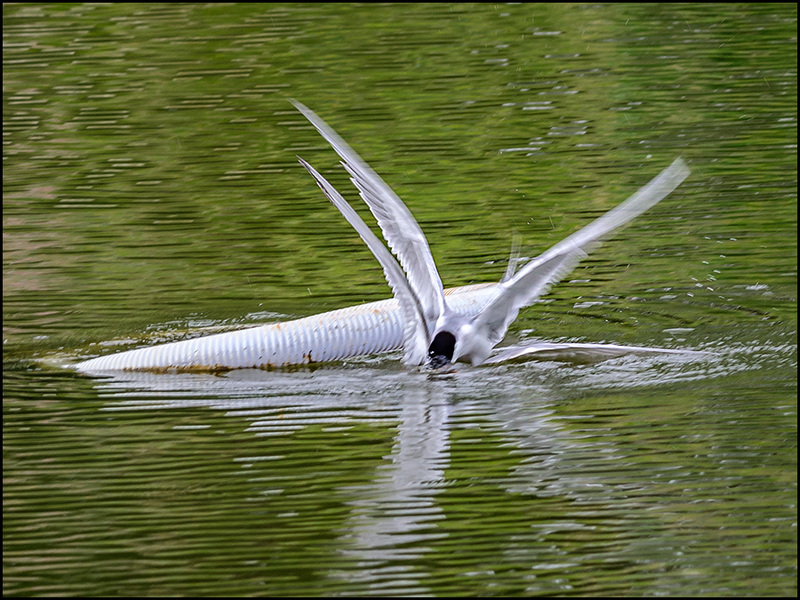 And holding its head underwater! 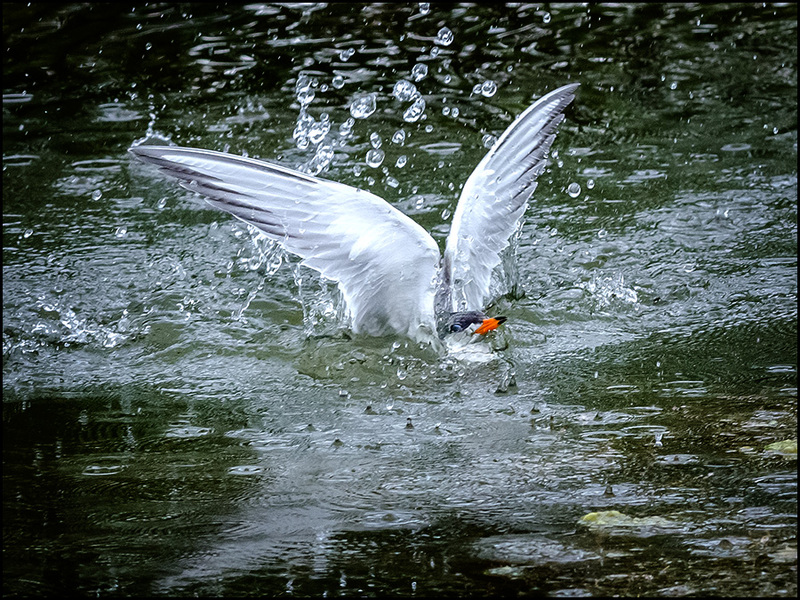 Plunged into the water to take a small fish (with my focus being slightly behind the bird as he emerged). 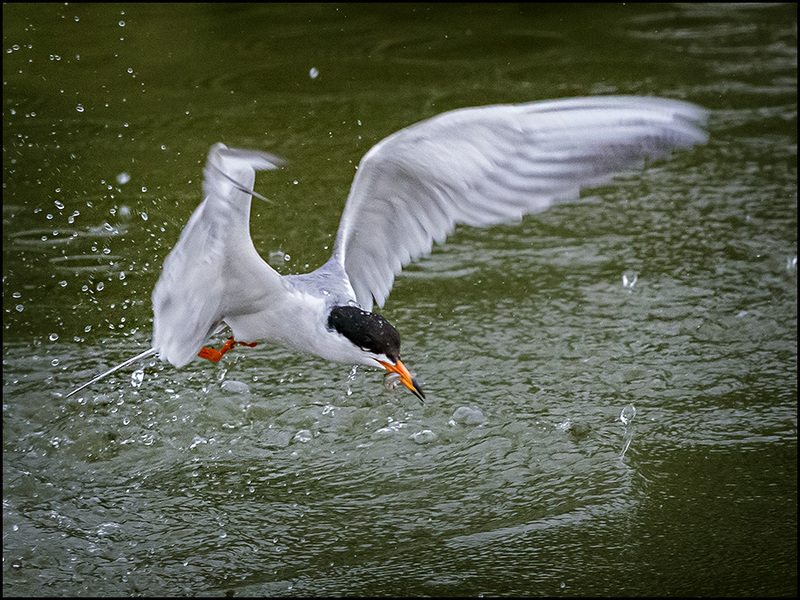 Photographing under overcast skies (a favorite of mine)!! 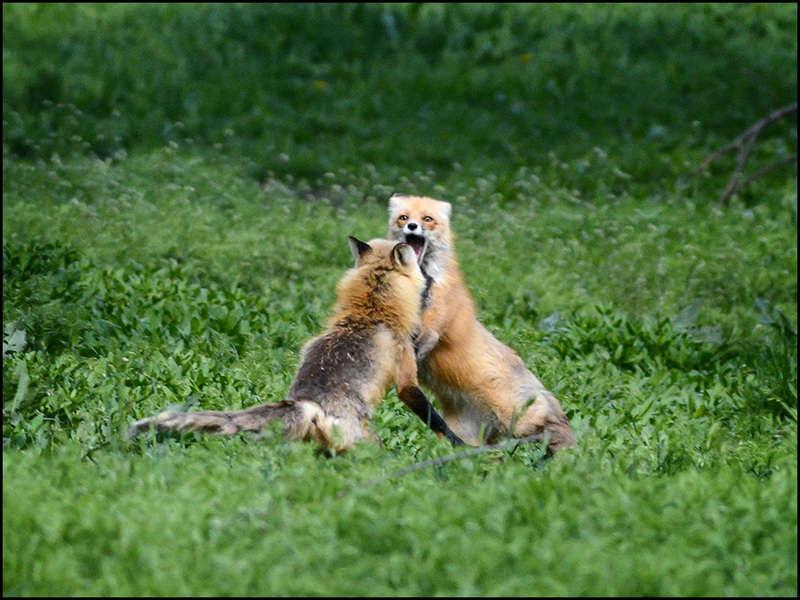 He was gone for good! 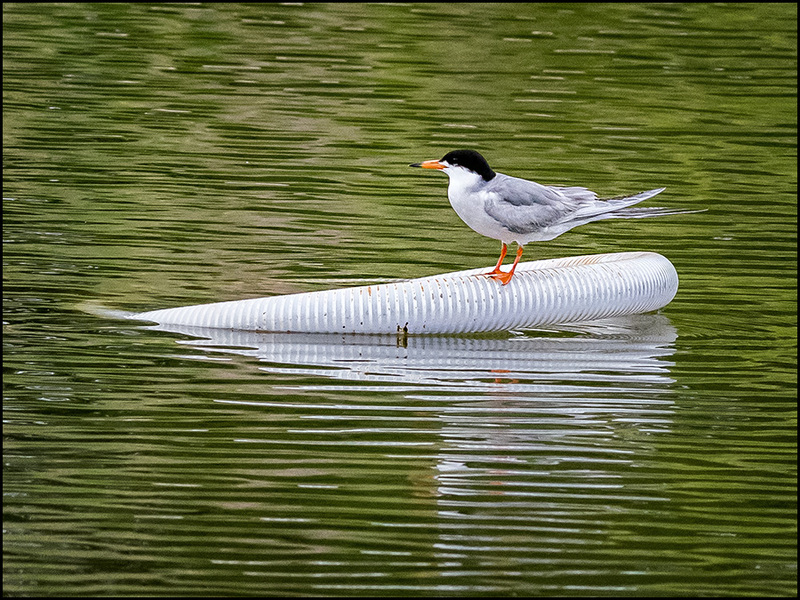 The lone youngster struggles to position itself. 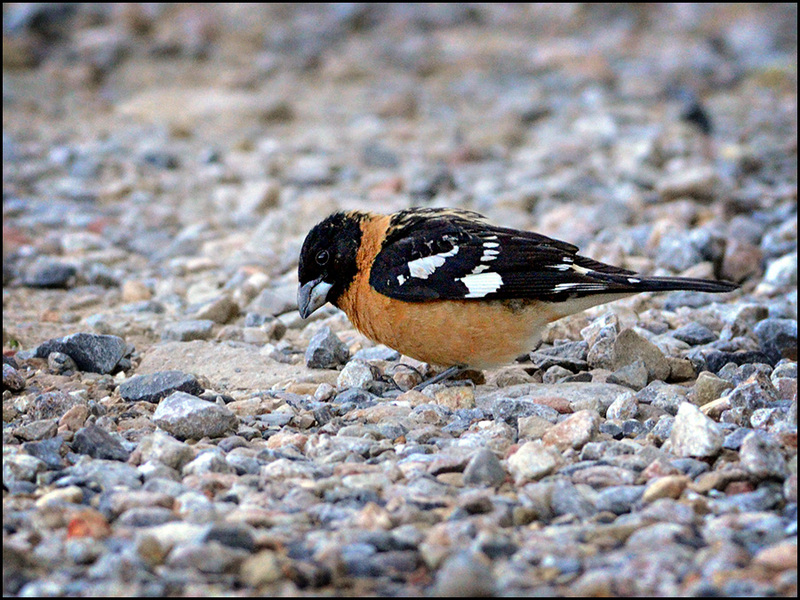 The adult female appears with a morsel of food. 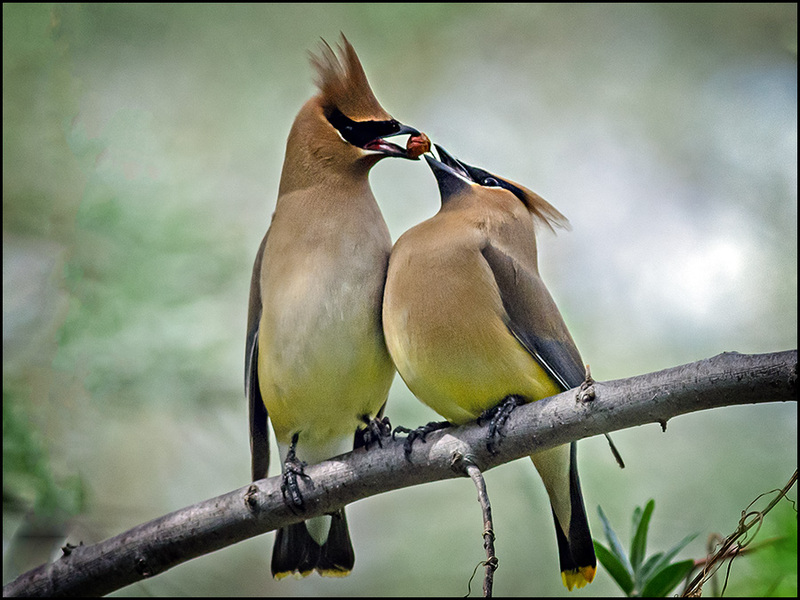 Although the action is obscured by foliage, the parent is thrusting food into the baby's gullet. 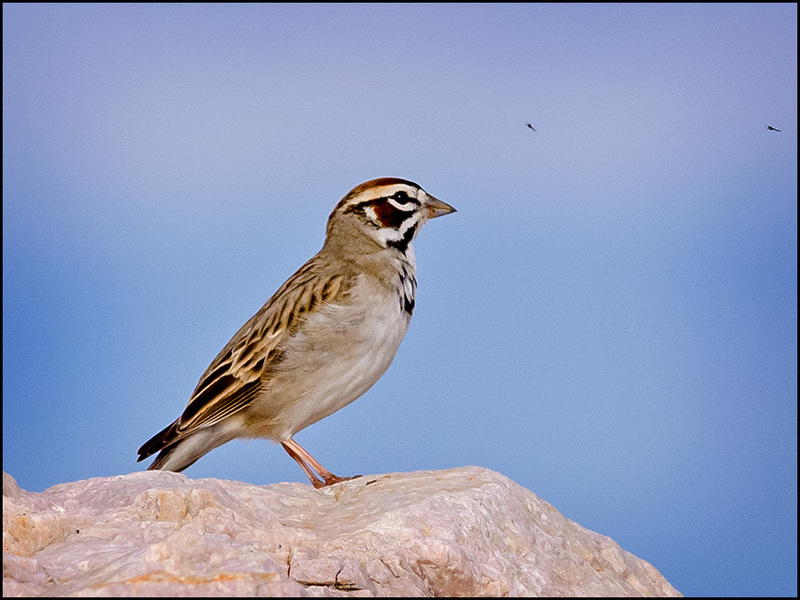 Afterward, the female begins to seek out more insects close by. 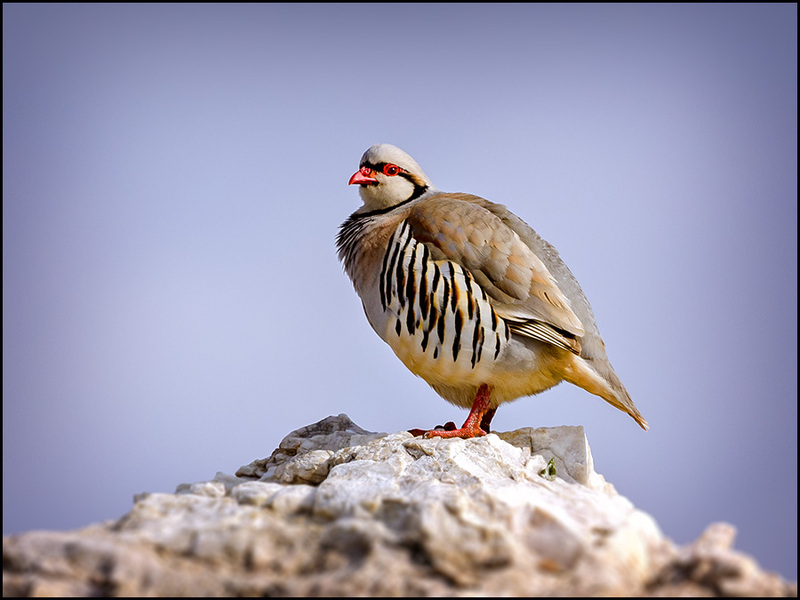 A lovely bird in her own right! 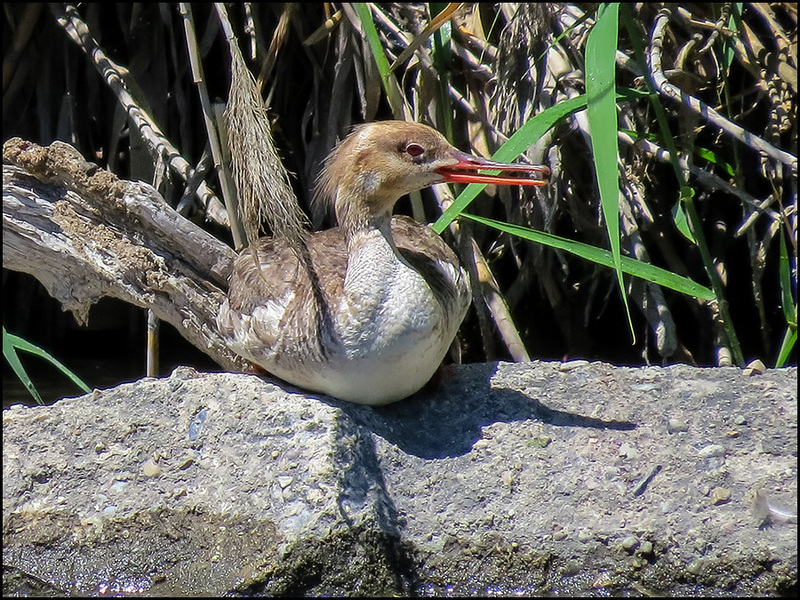 Meanwhile, the youngster is actively waiting outside the nest for more food. 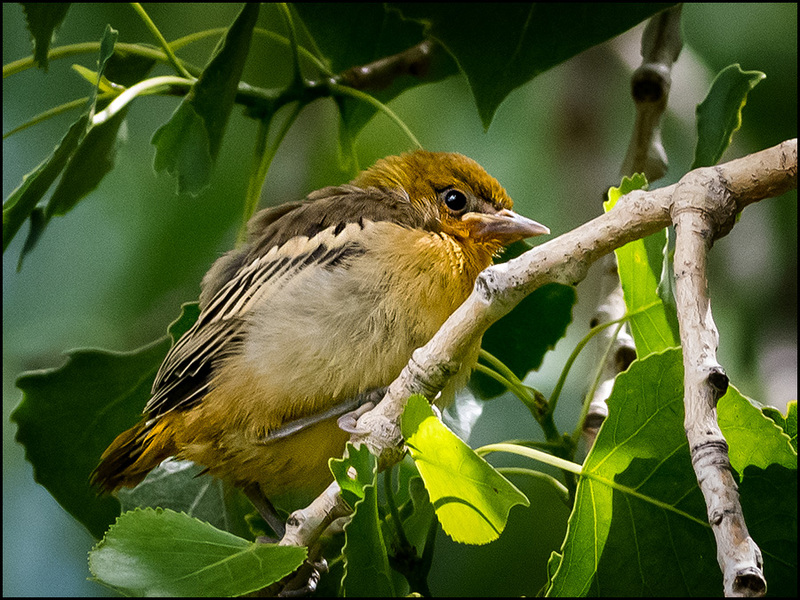 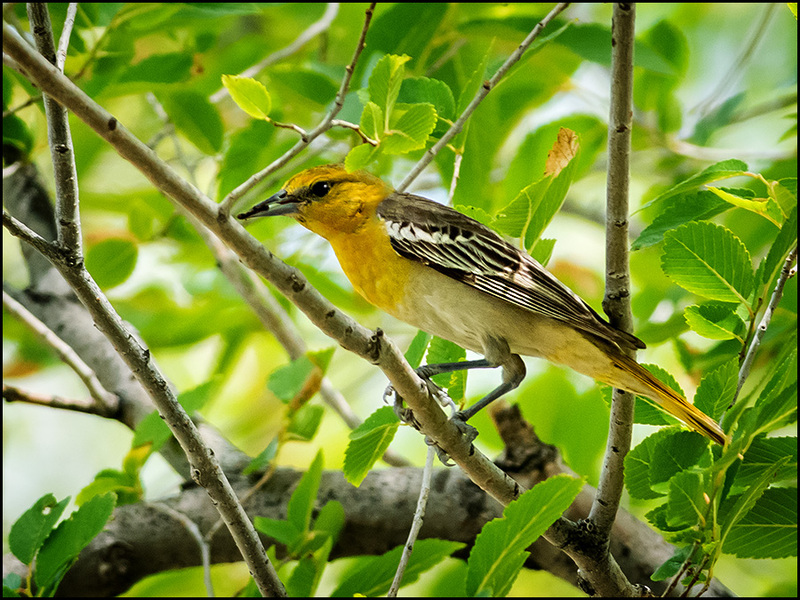 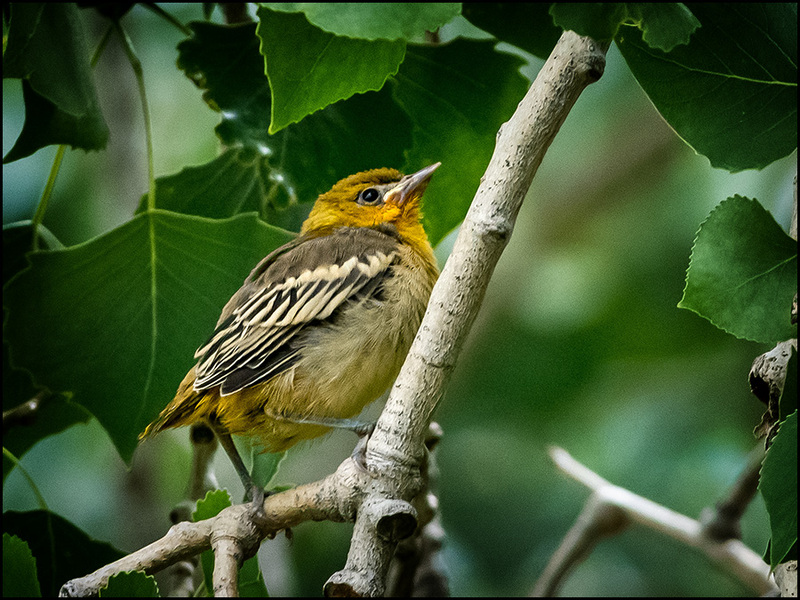 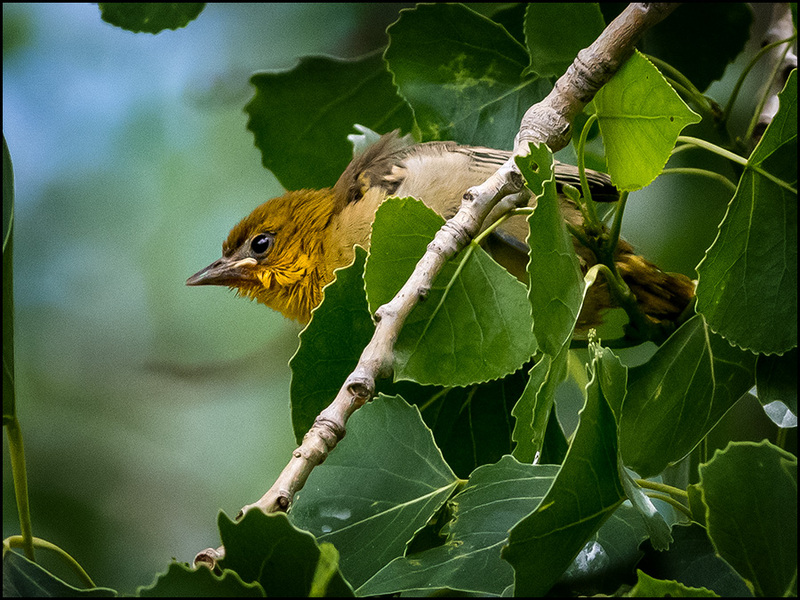 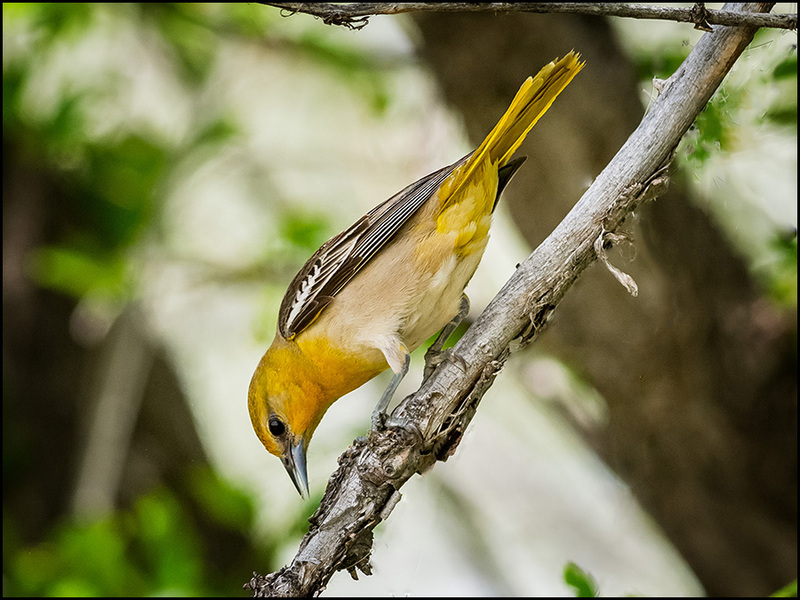 And being a typical Bullock's Oriole fledgling, it begins to wander a bit. 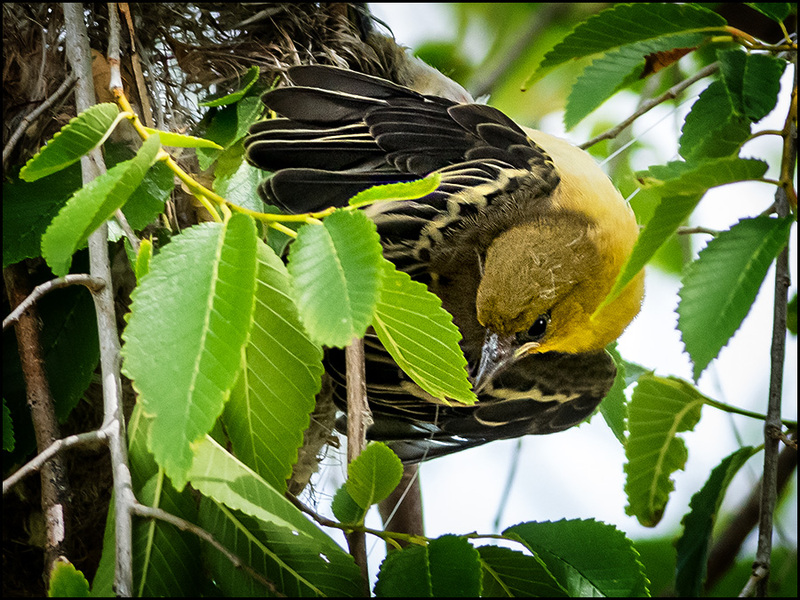 Tenaciously hanging on, it stretches downward to see what "mom's" doing below. 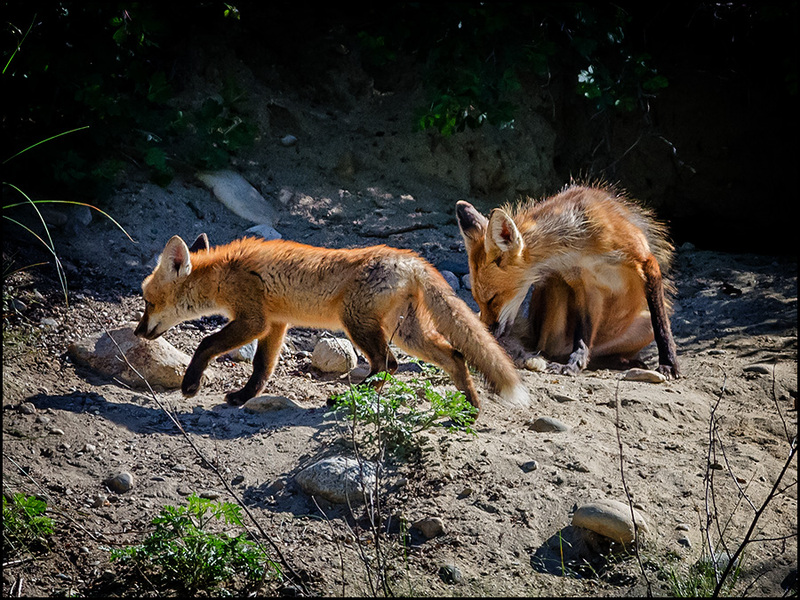 Moments later 'mom' appears with more food... and the process repeats itself again... and again... and again! 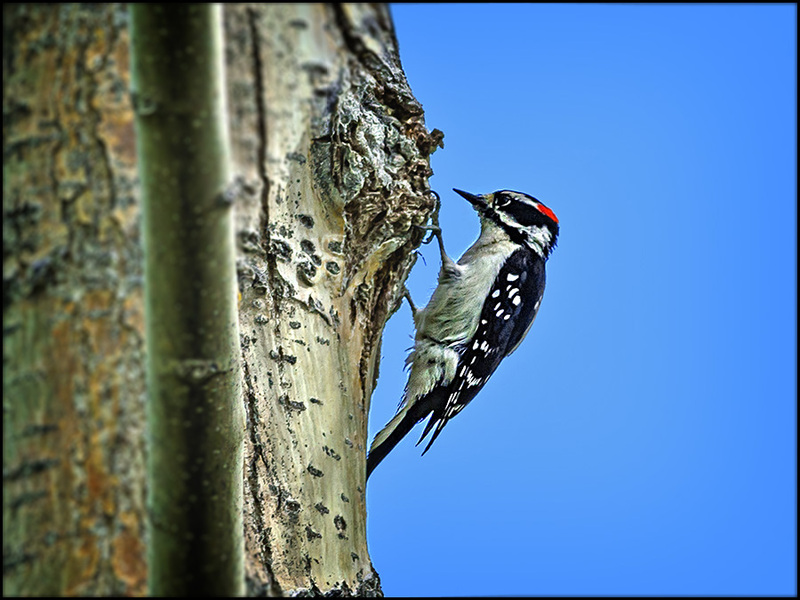 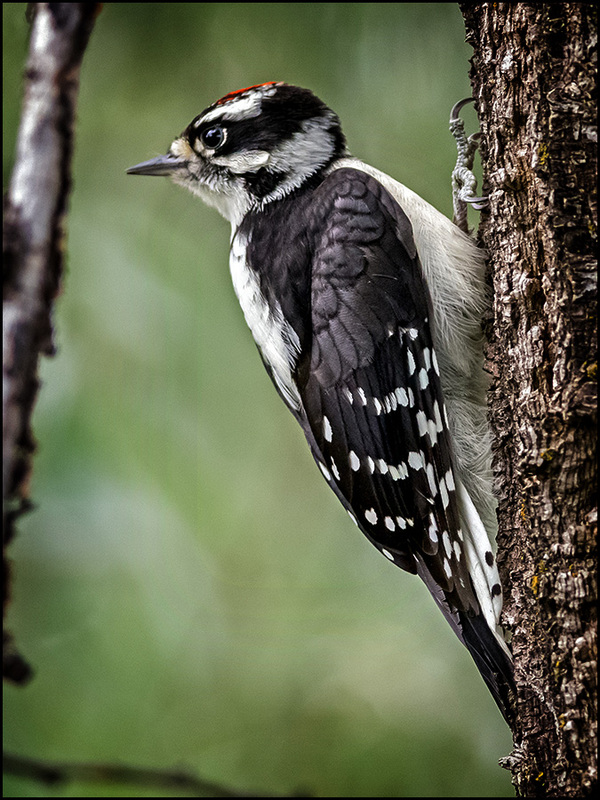 An up-close series of a cooperative Male Downy Woodpecker! 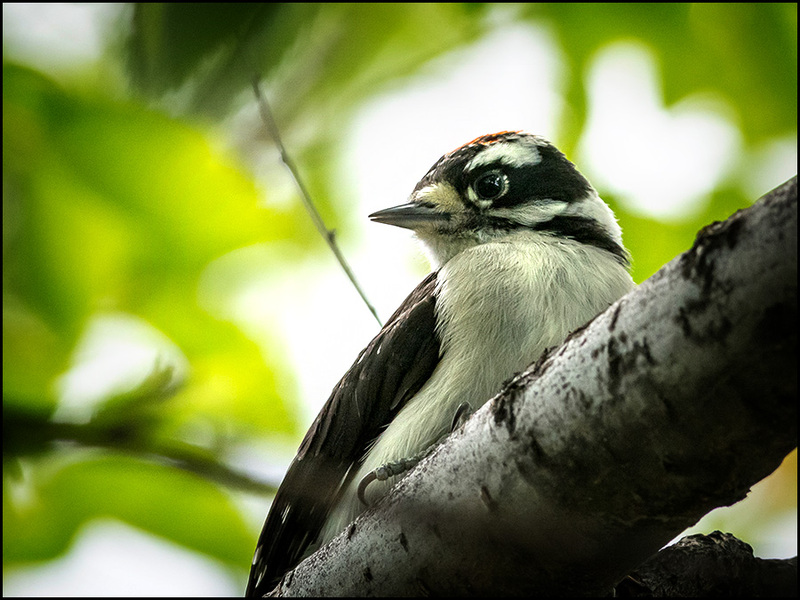 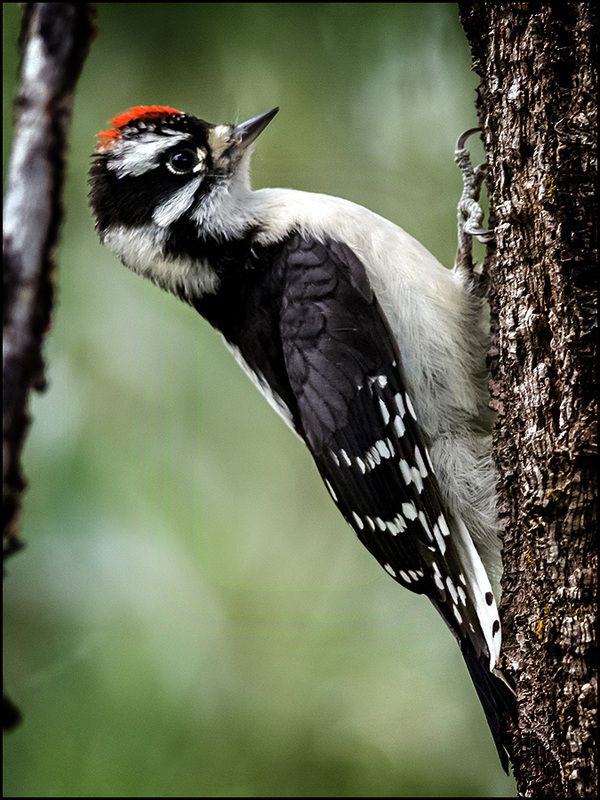 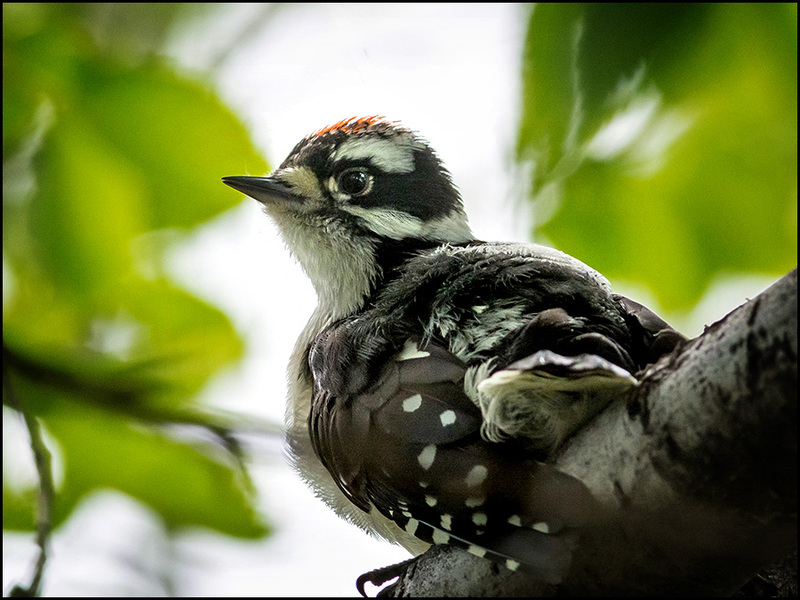 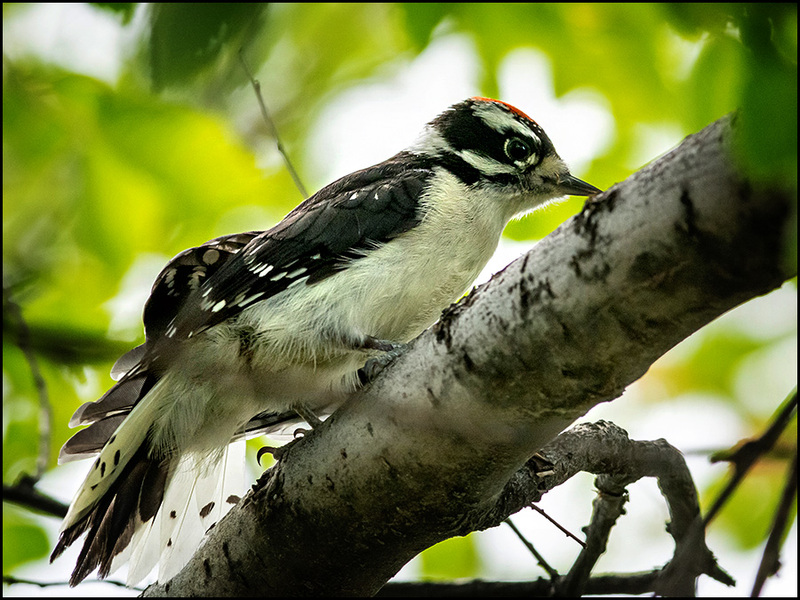 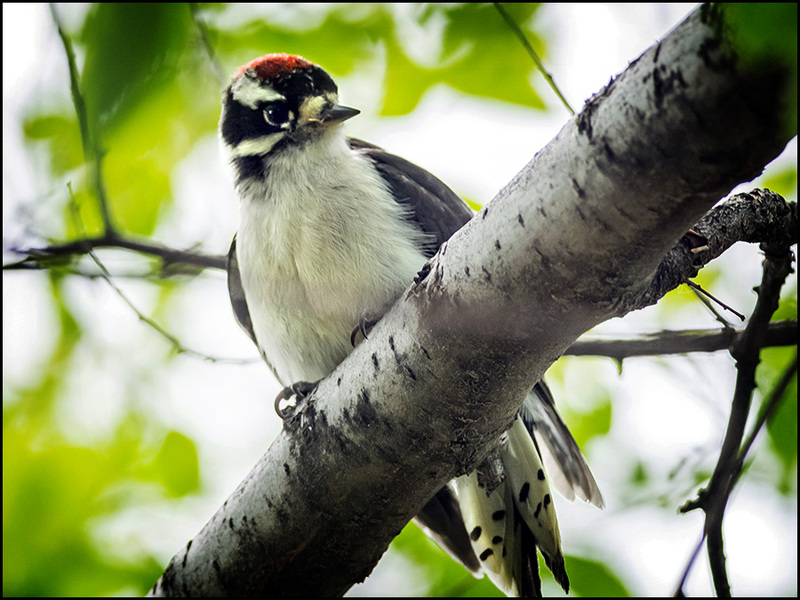 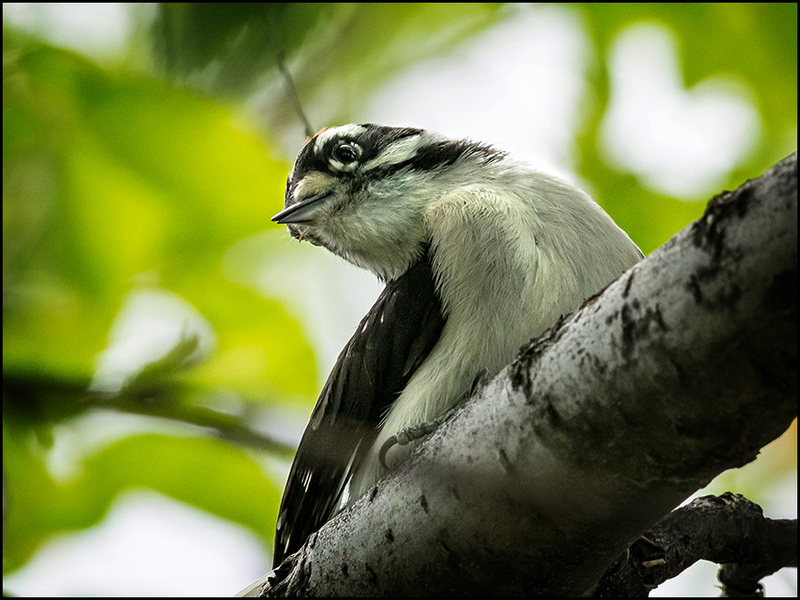 While studying Bullock's Orioles fledging along the Jordan river, I discovered this accommodating male Downy woodpecker. 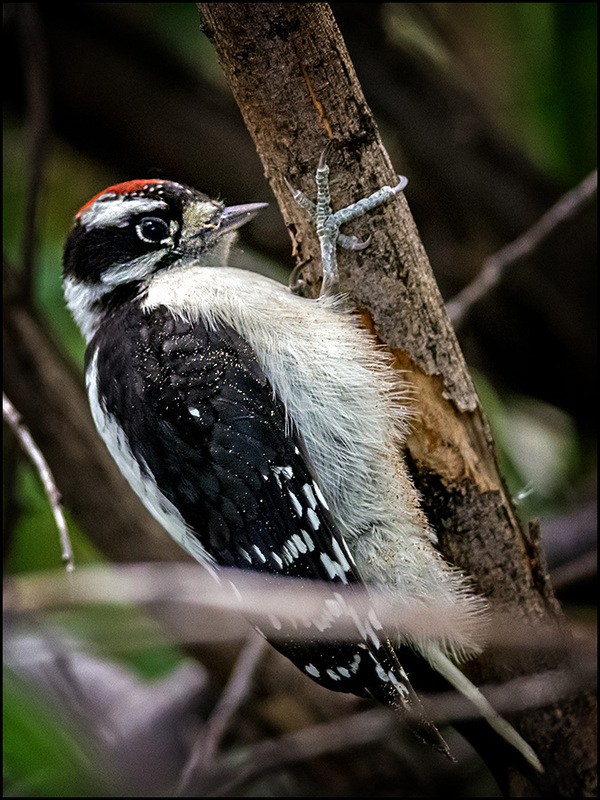 This guy appeared to be a "Tree Hugger"! 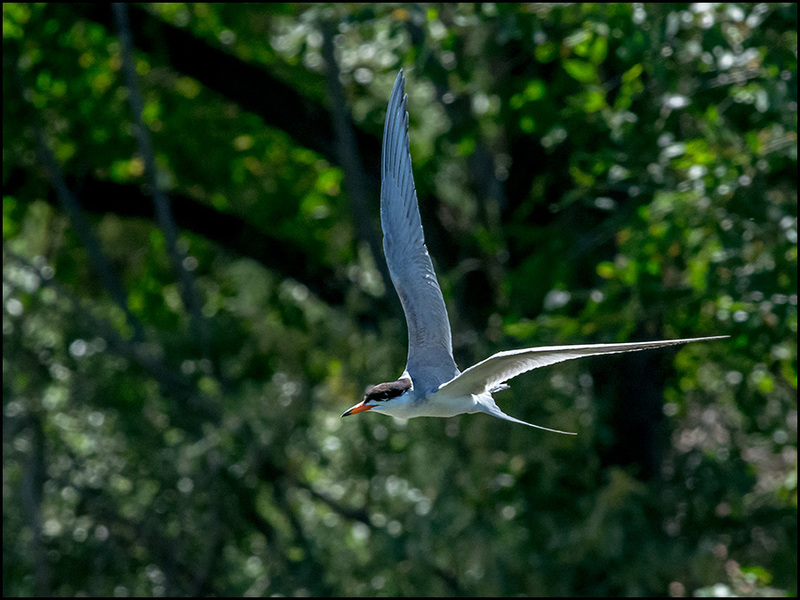 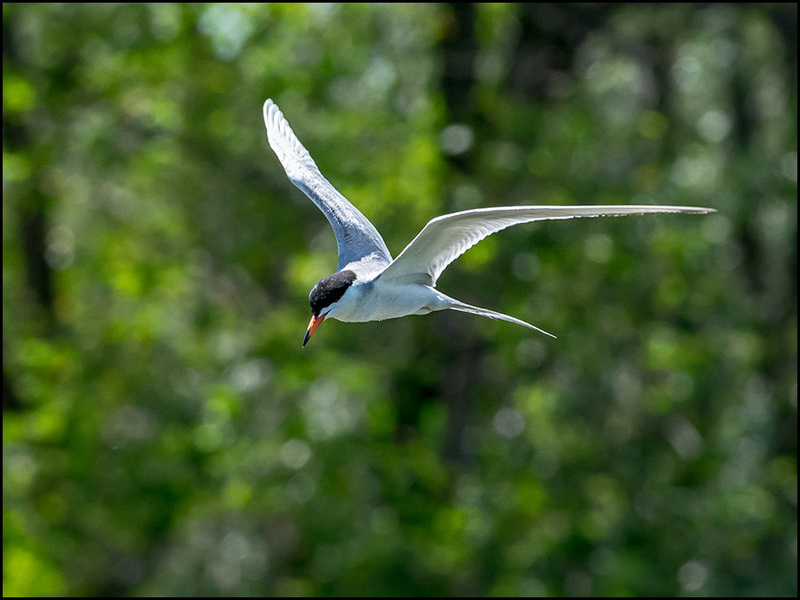 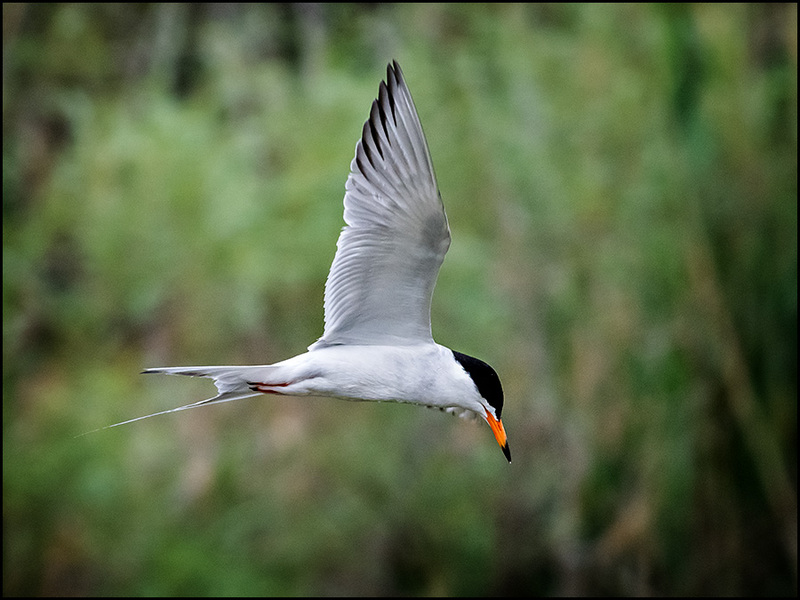 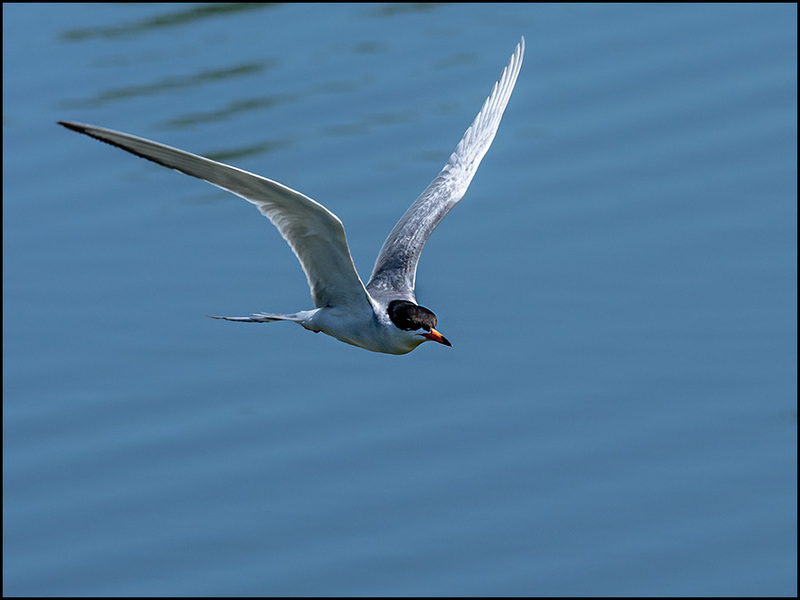 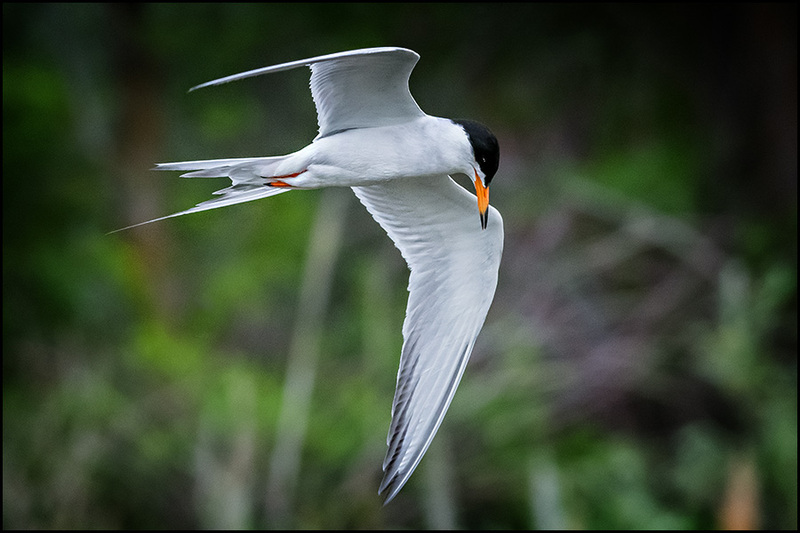 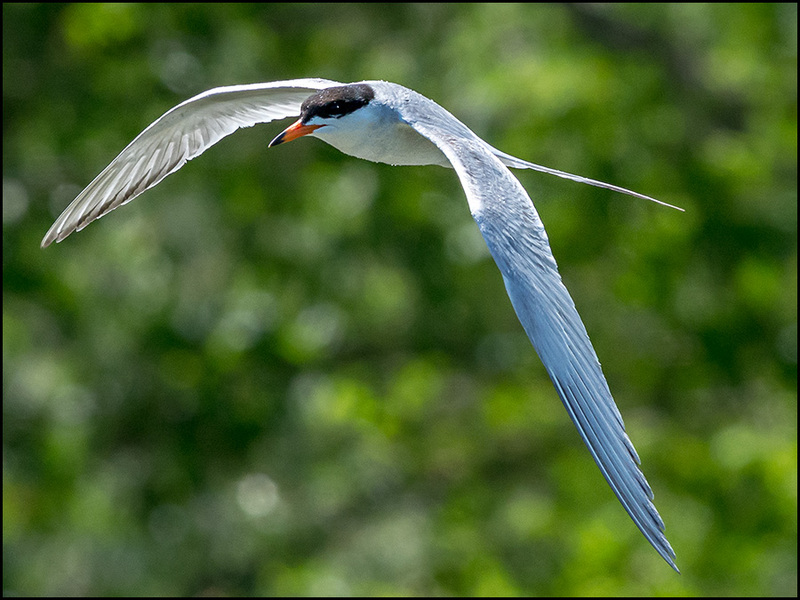 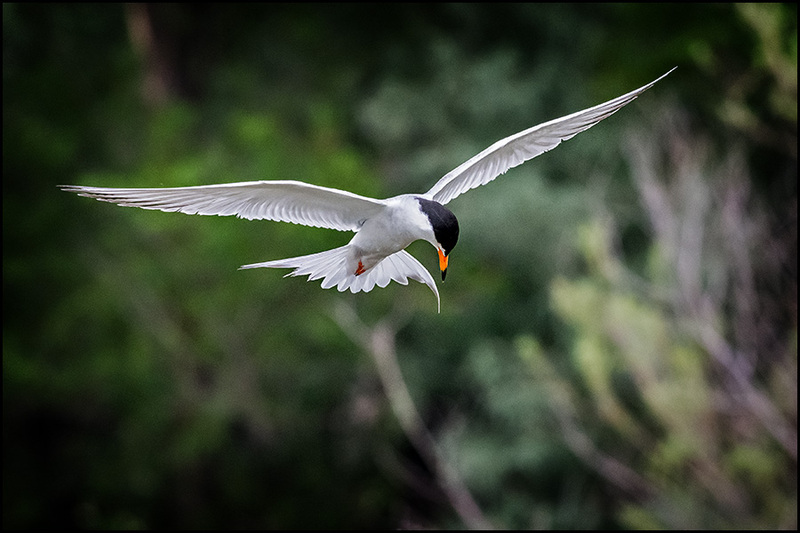 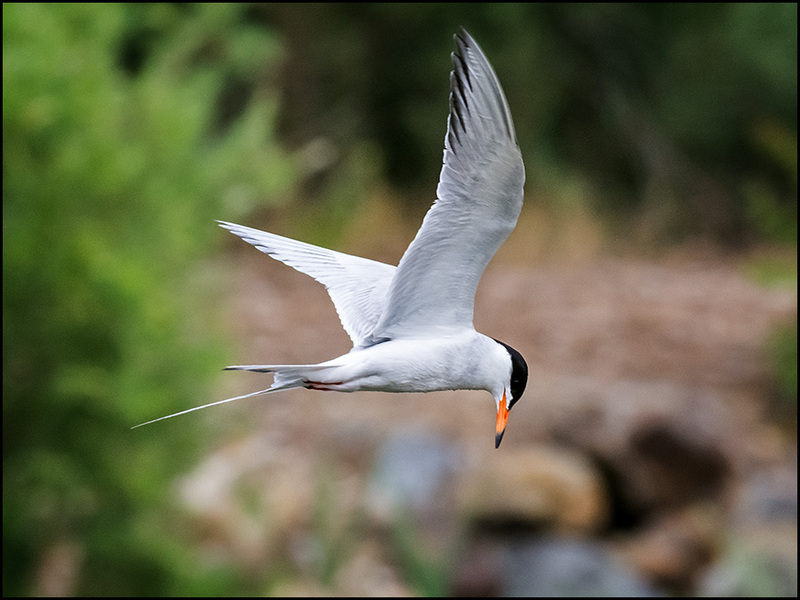 This post is an "emerging" story about 1) a special Forster's Tern, 2) my quest for excellence using modest photographic equipment along with 3) my preference for lighting birds in flight! 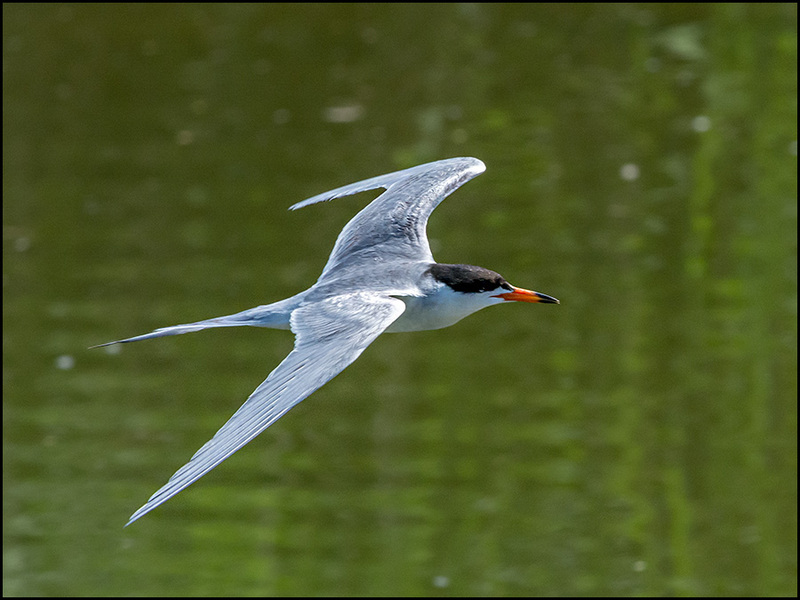 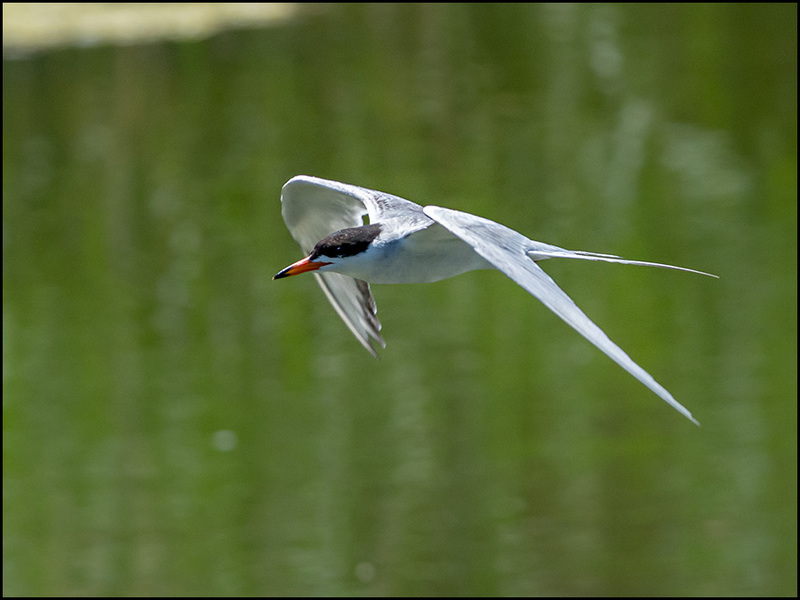 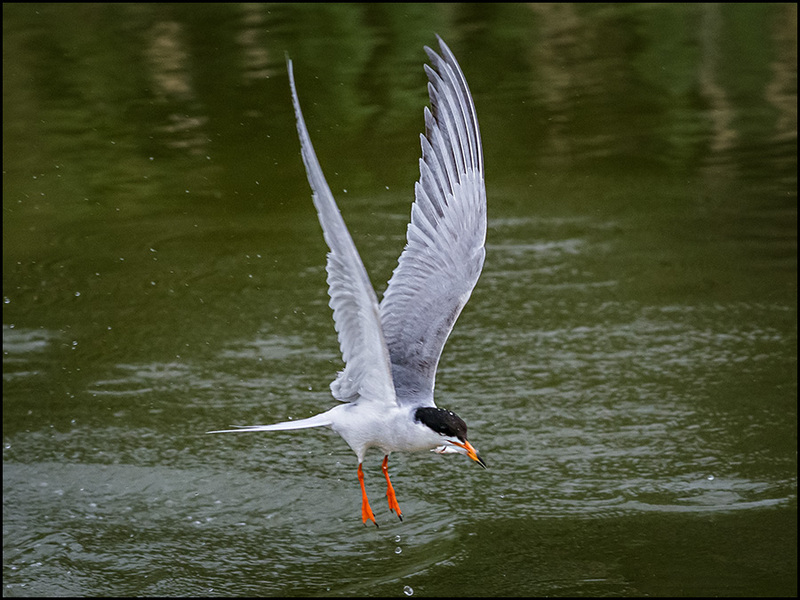 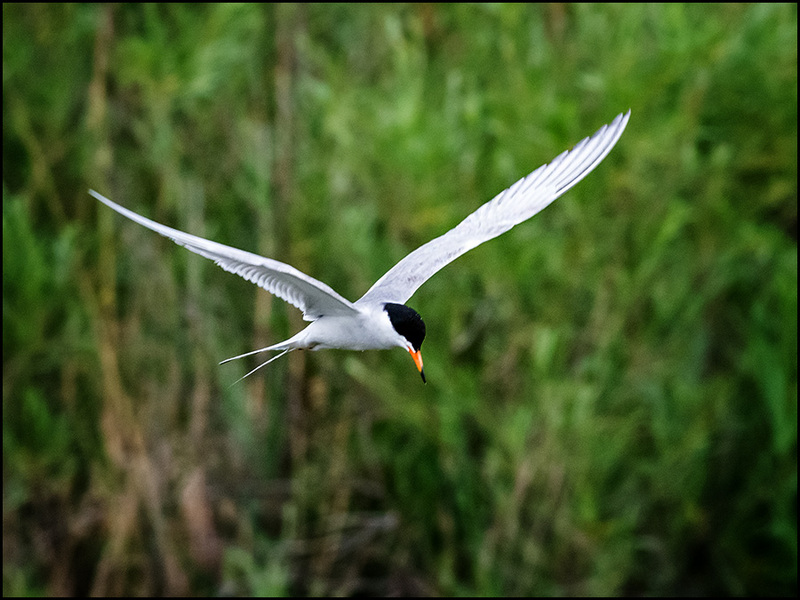 Today's post takes advantage of cloudy skies, and features a newfound friend, a Forster's Tern at Mill Race Pond in Taylorsville, distinguished by its shortened right tail feather! 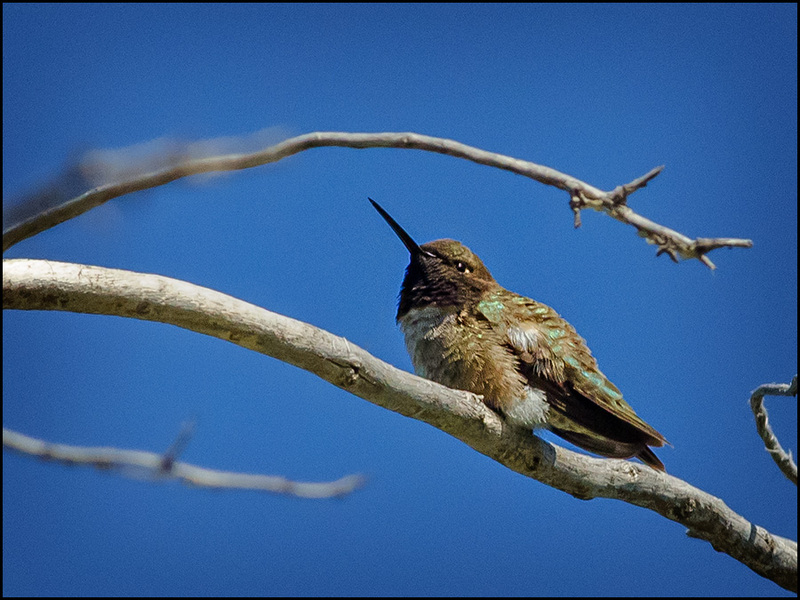 Notice the detail and subtle shading of its coloration normally lost when photographed in direct sunlight! 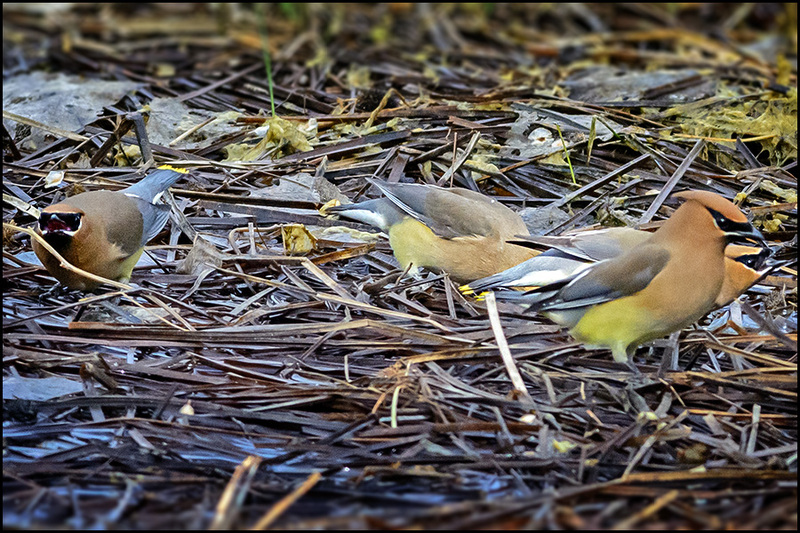 What you don't see is the modest camera equipment I'm using to capture this series of images! 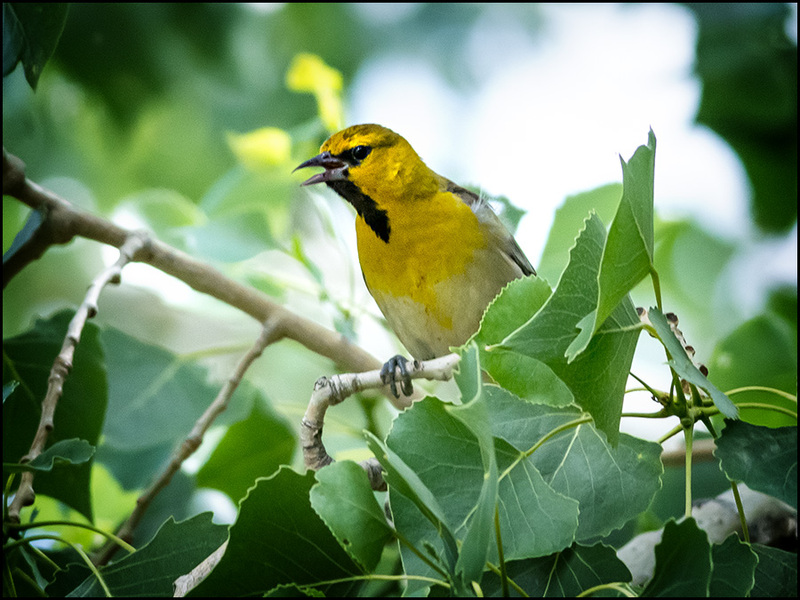 I'm alluding to a "consumer level" Nikon D5200 camera body, affixed with a used Nikon F4 AFS 300mm lens + 1.4 teleconverter. 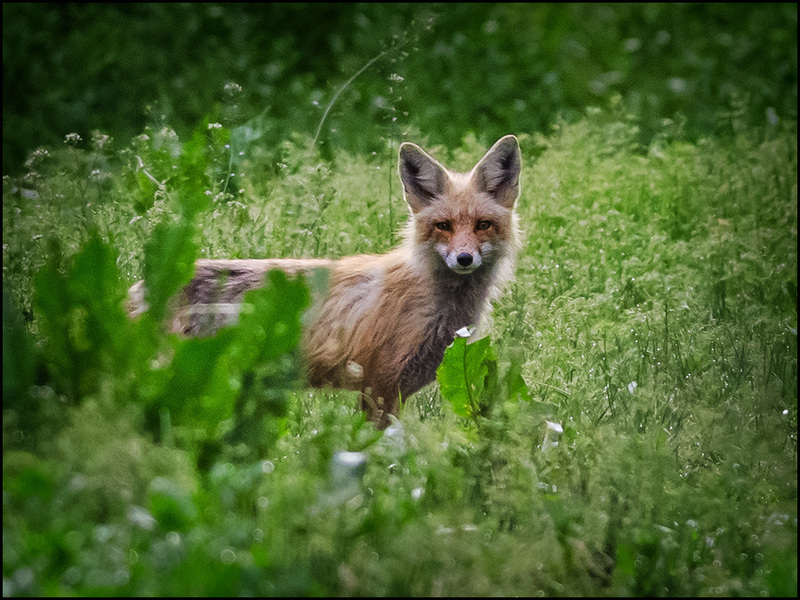 This camera body has recently been replaced with a D5300 iteration, creating a fire sale price (body only) of less than $600 for the D5200. 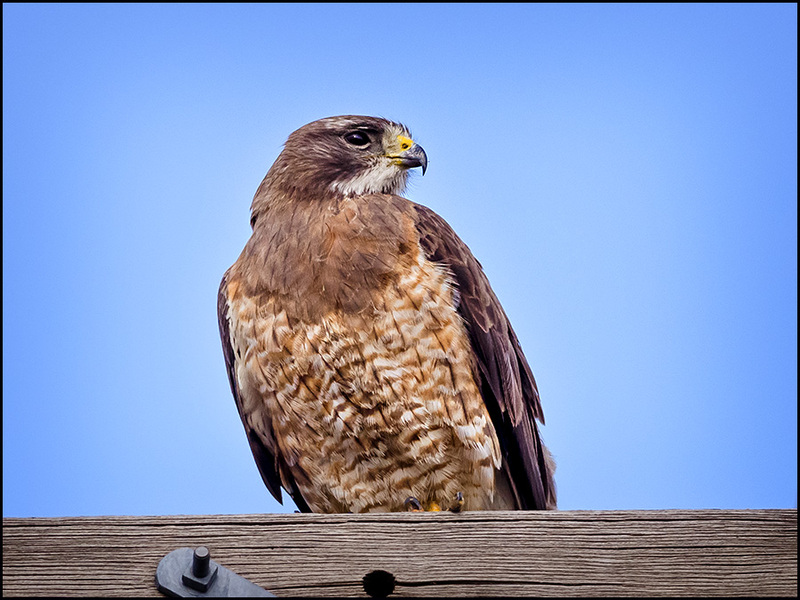 NOTE: My camera has the exact same sensor and pixel count as the highly esteemed Nikon D7100, for less than 1/2 the price!!! 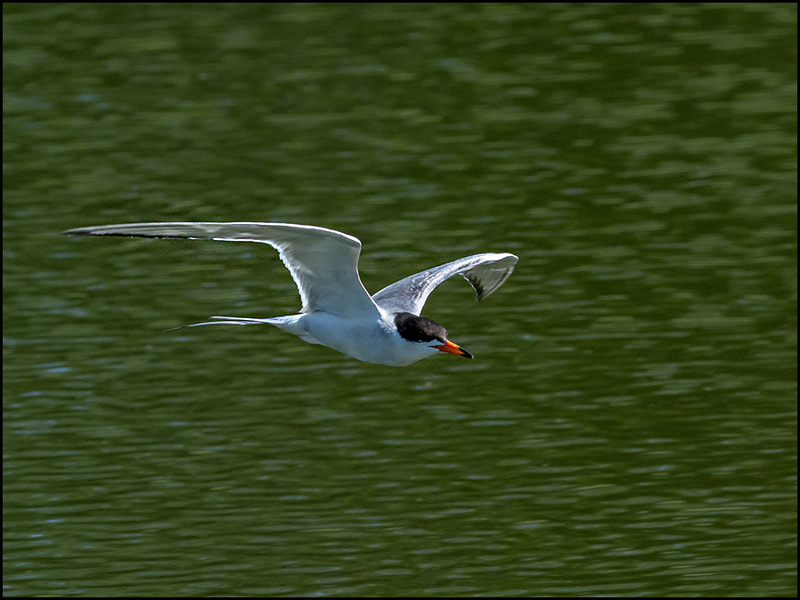 It also has an upgraded autofocus system on board! 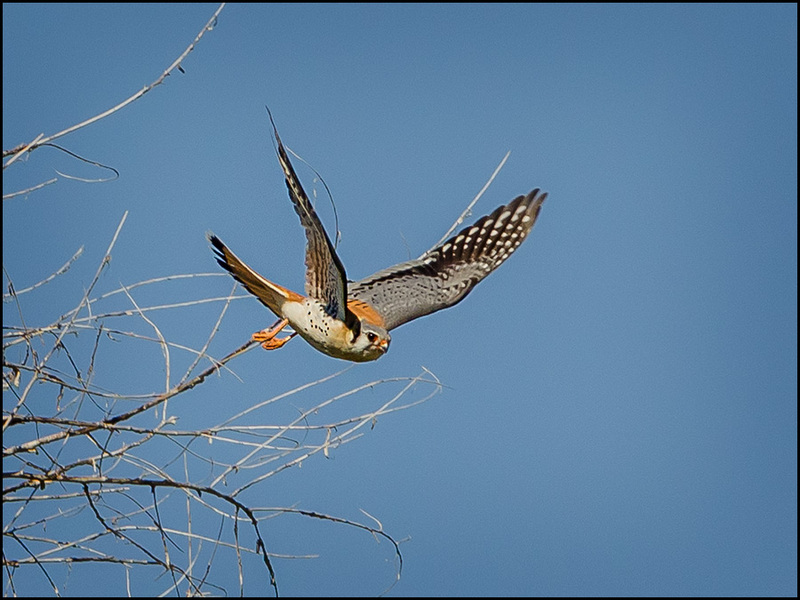 Notice the shortened tail that assures me each day that I've photographed the same little aerial acrobat... 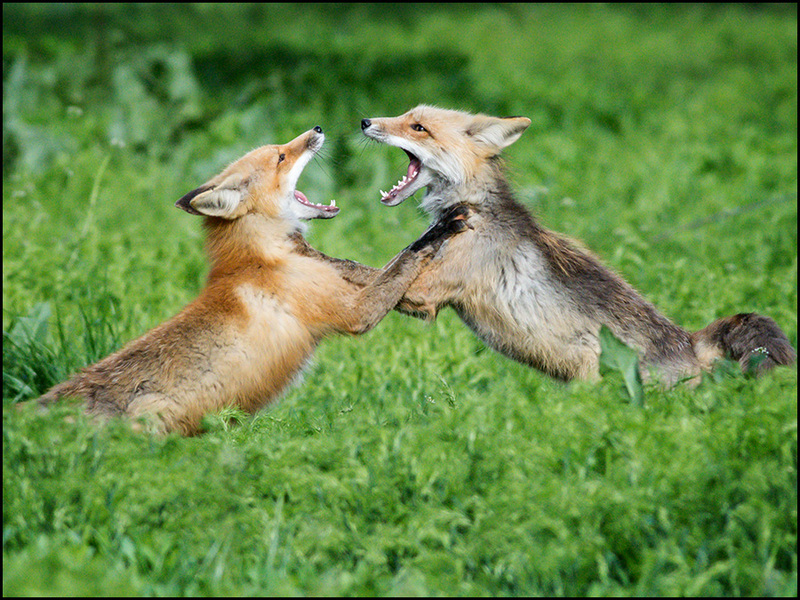 Such fun!!! 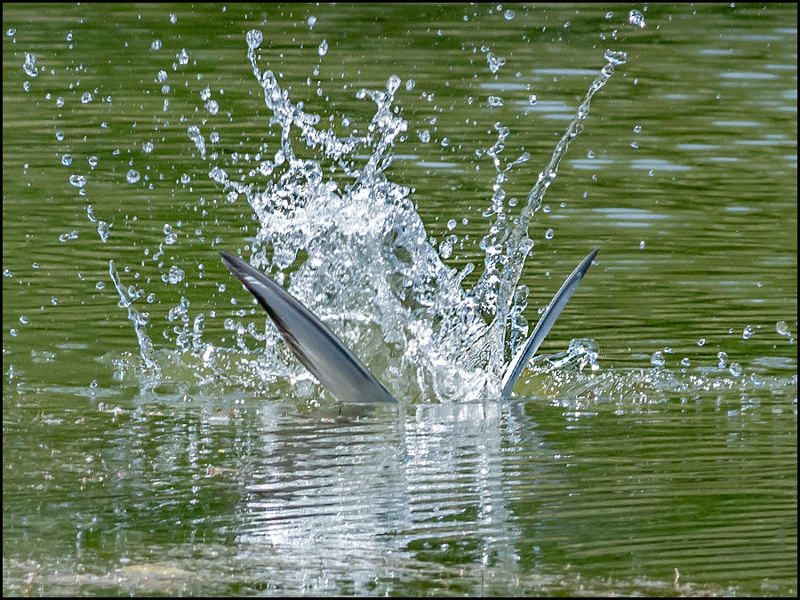 The bird was scanning the water below for tiny "Mosquito-fish" (Gambusia affinis). 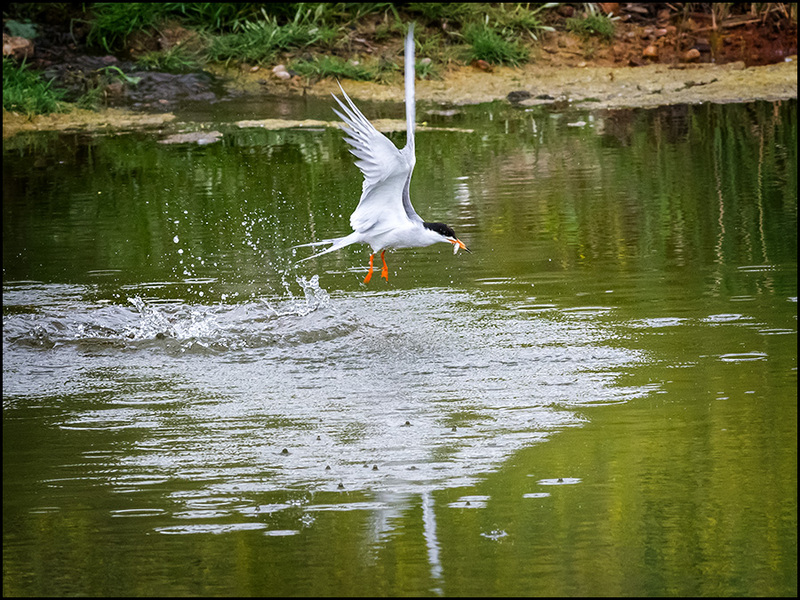 The next 3 images were shot rapid fire. 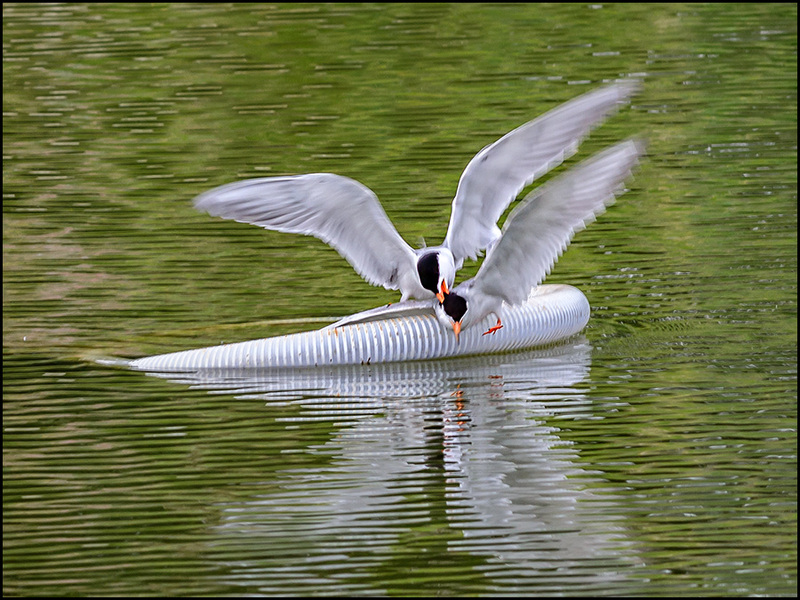 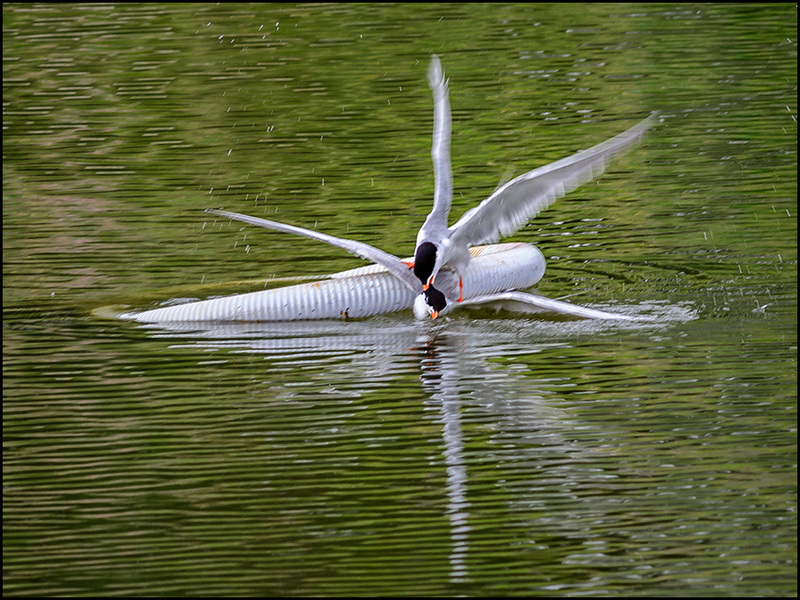 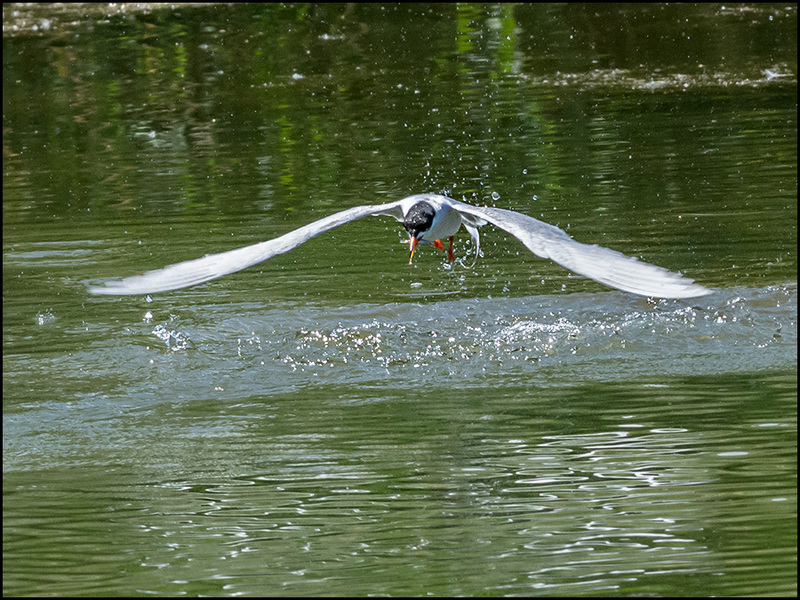 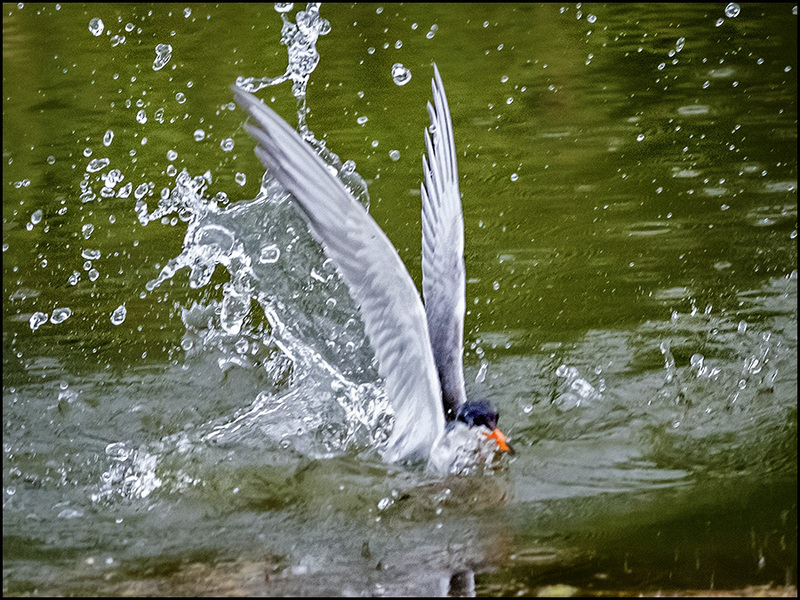 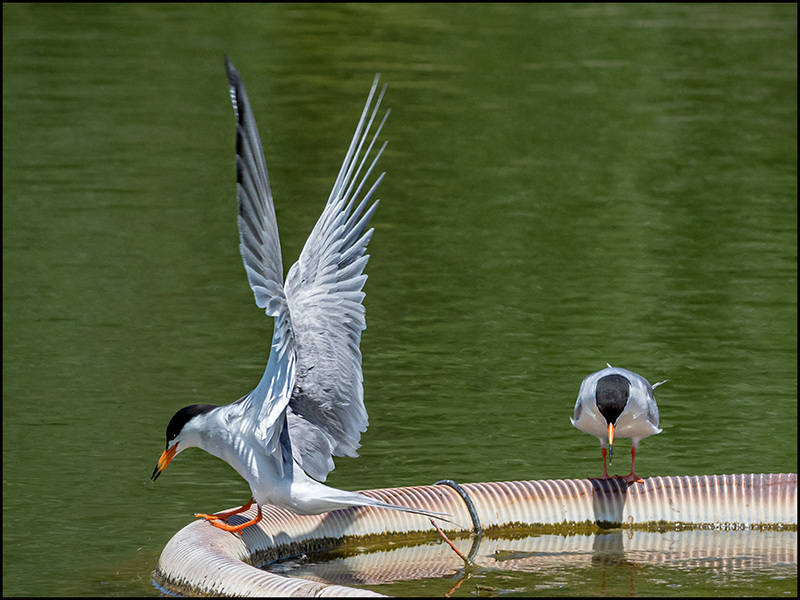 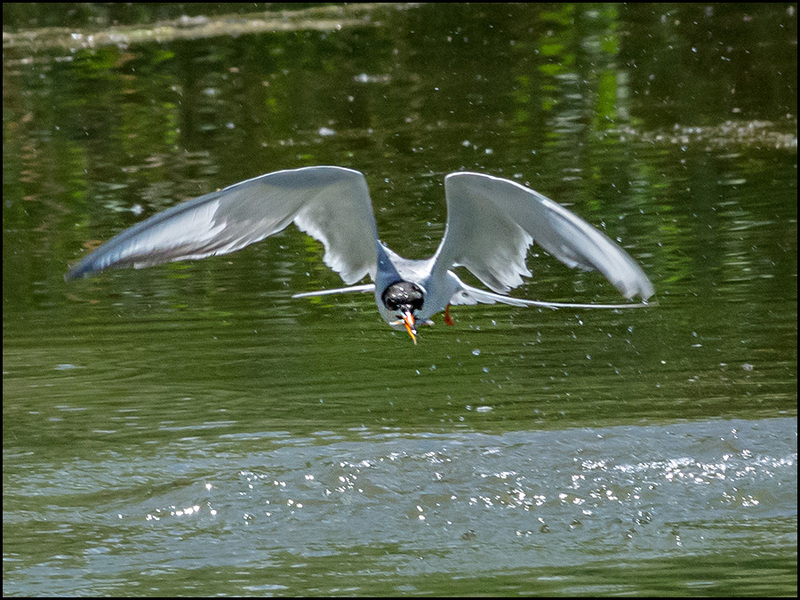 I missed the plunge that rewarded the Tern with a fish! 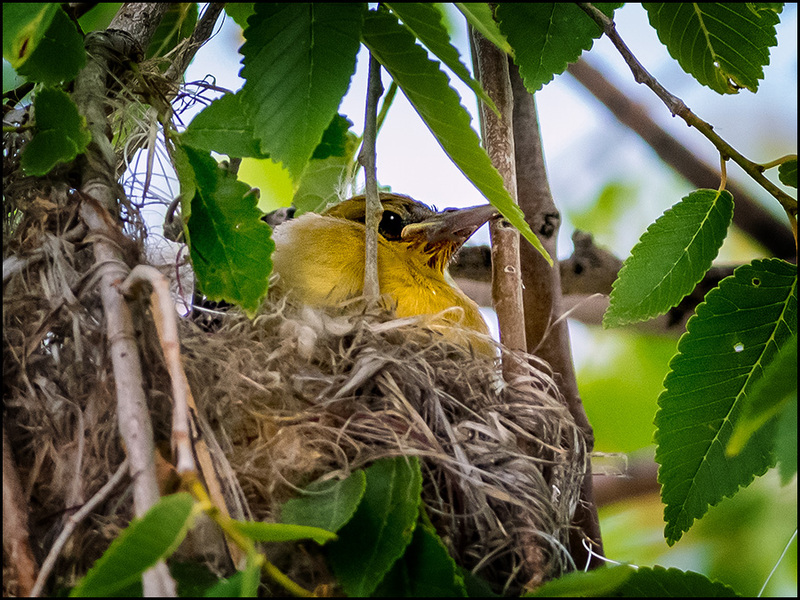 And my little friend begins to scan again! 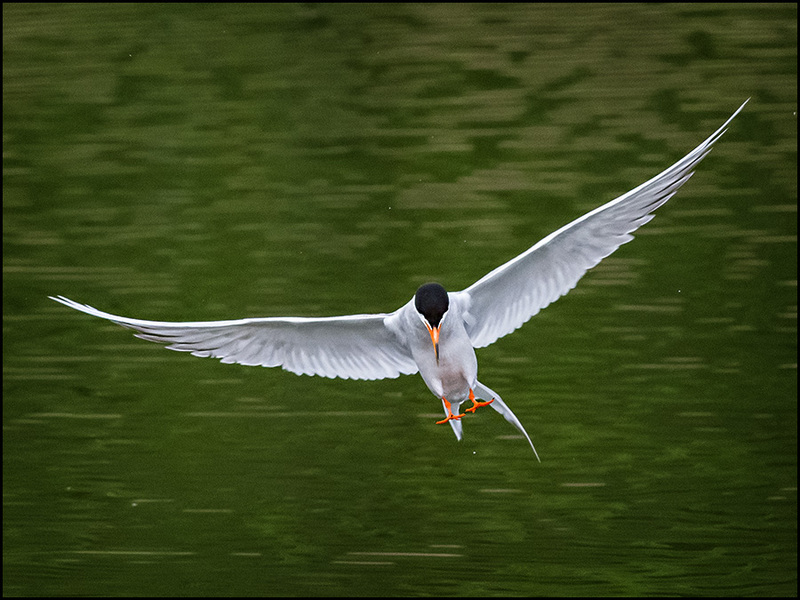 Providing me with a satisfying series of Forster's Tern behavior! 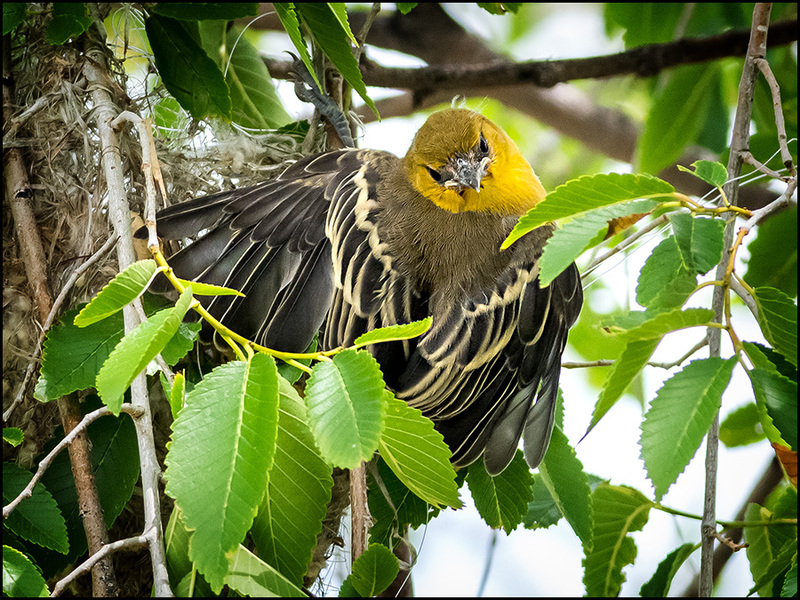 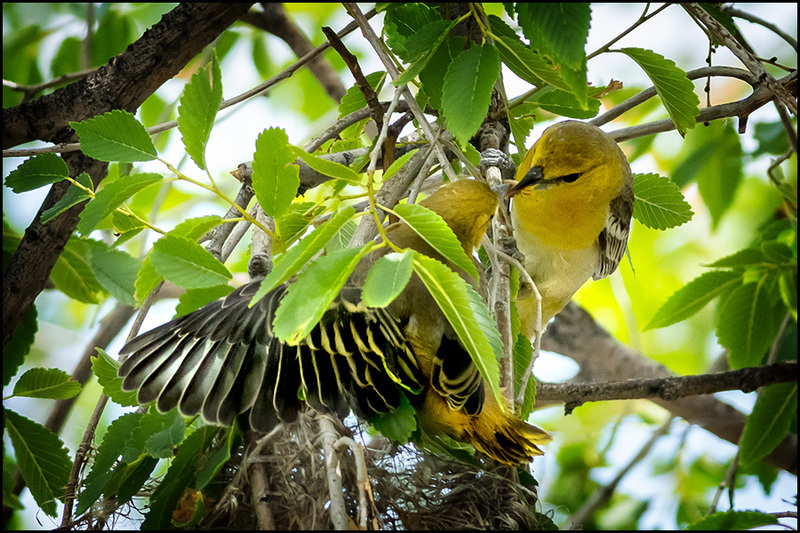 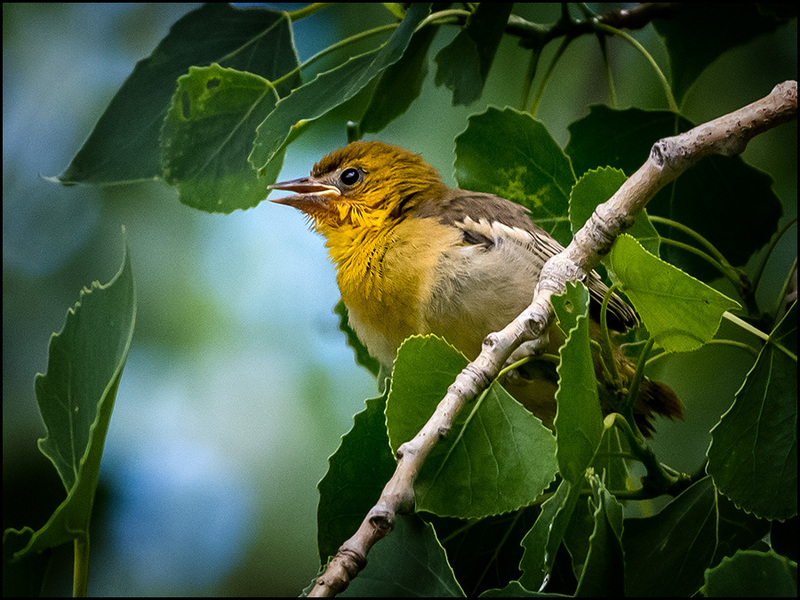 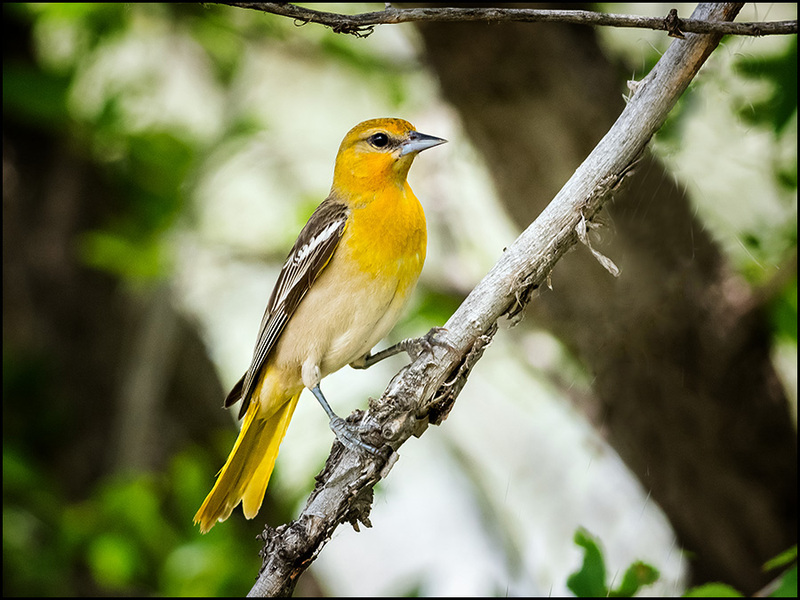 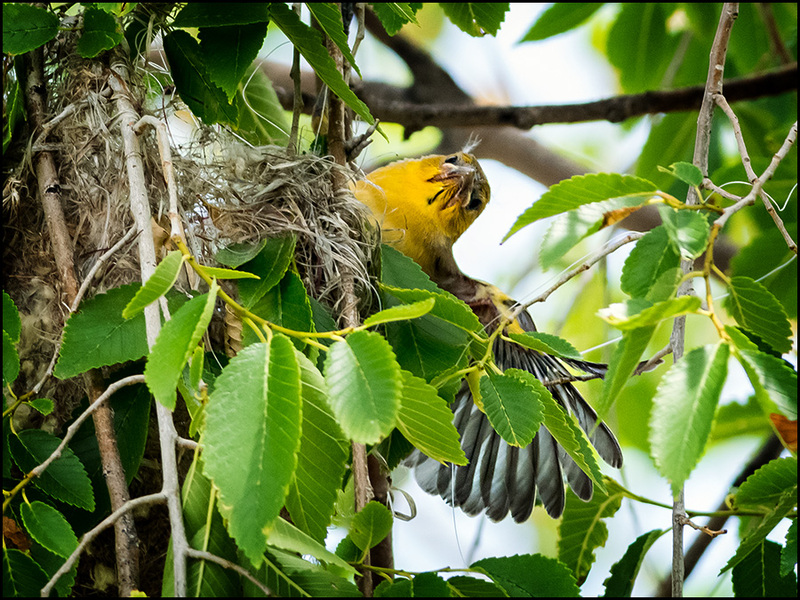 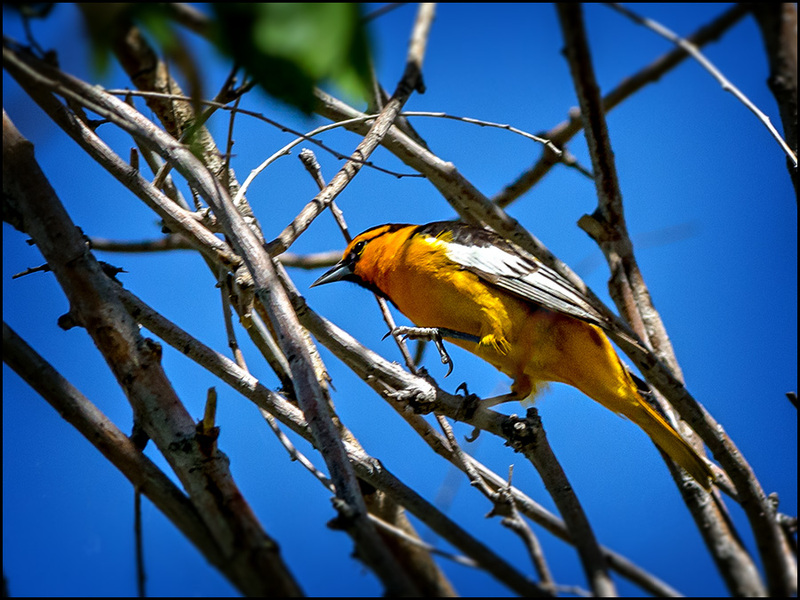 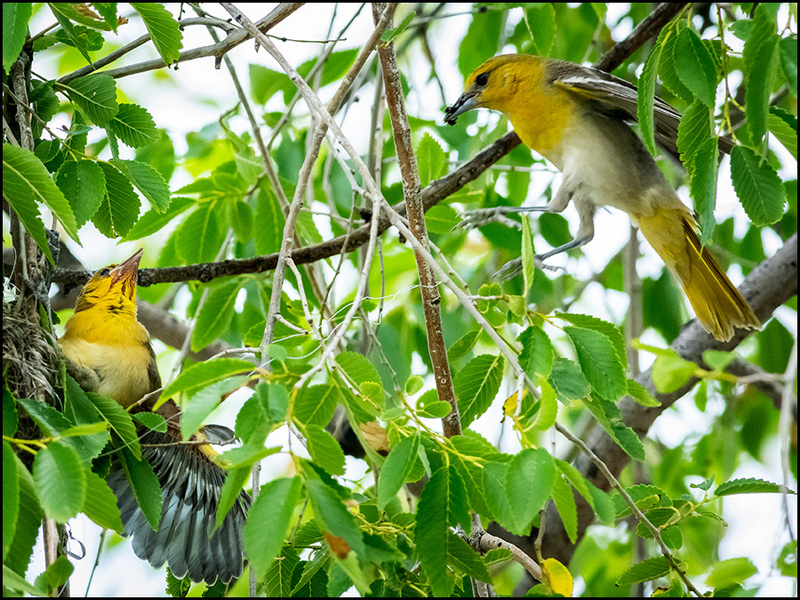 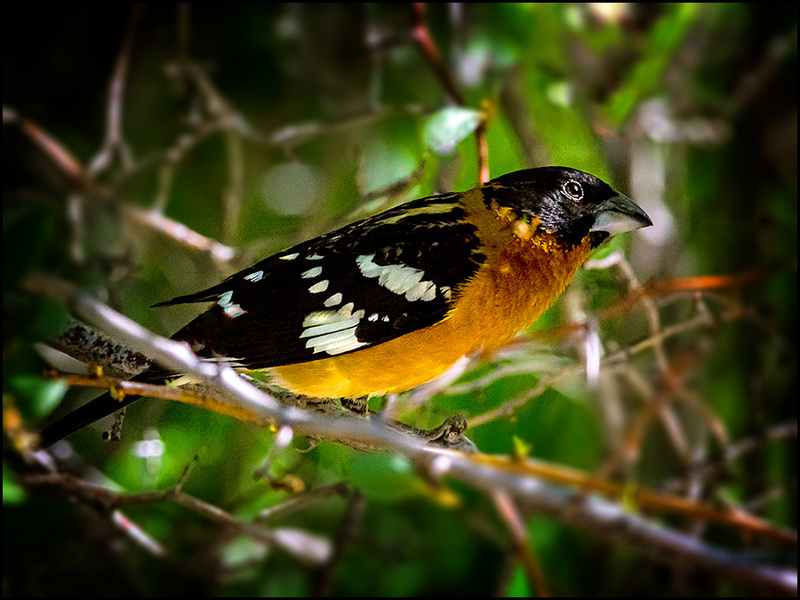 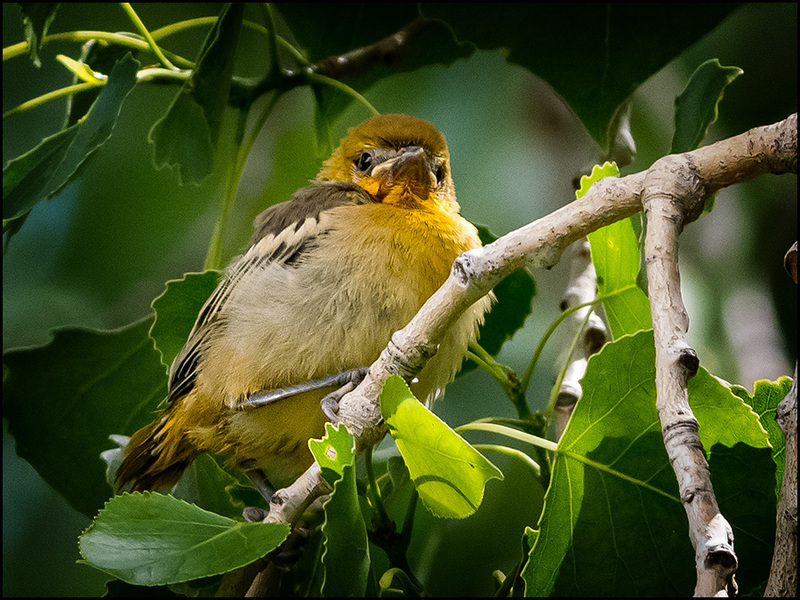 For the past 5 years, at this time of month, I've enjoyed photographing Bullock's Orioles nesting, particularly when the fledglings begin to wander away from their nests! 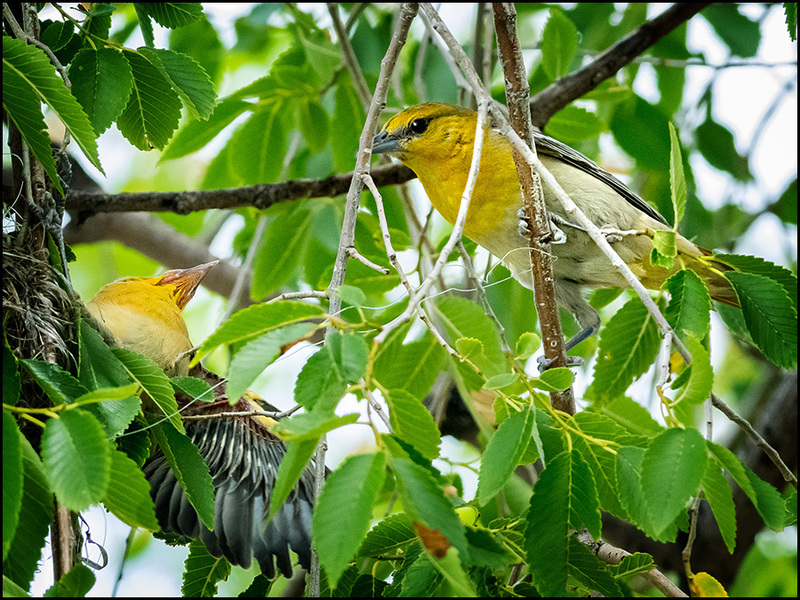 The youngsters climb out of their hanging nests and wander the tree! 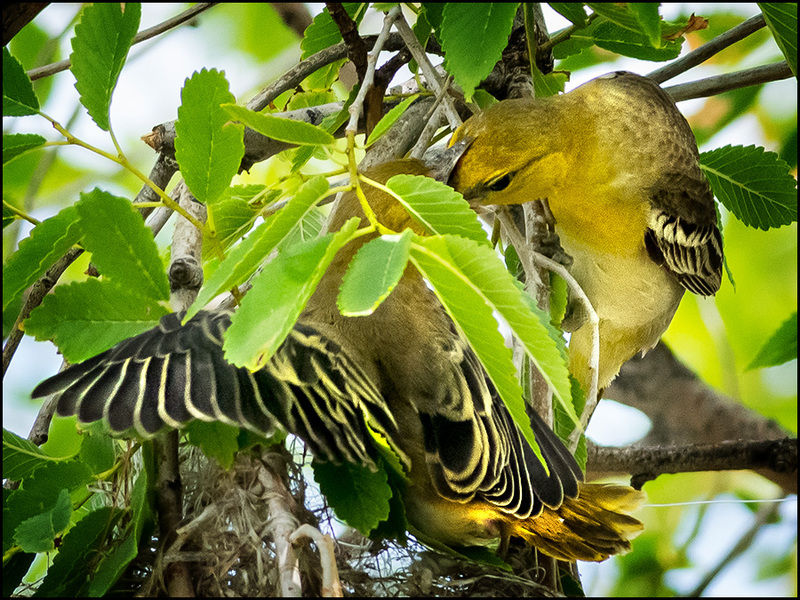 When this happens, both adult parents chase after them with morsels of food, continuing until the young can successfully fly on their own. 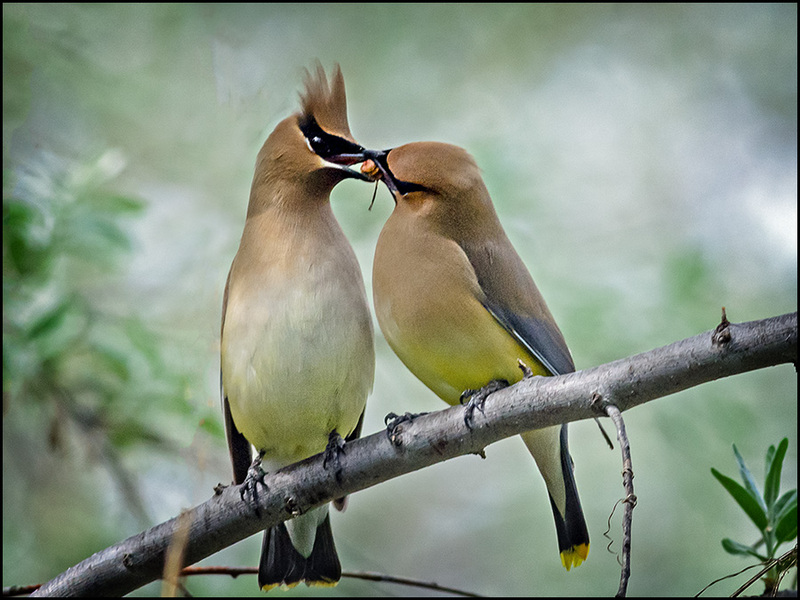 Even then, the adult females continue to feed these young. 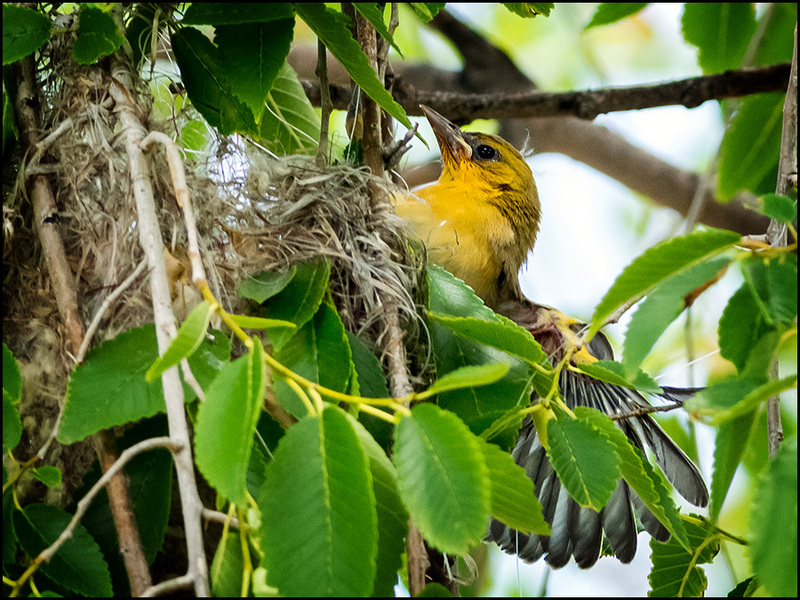 One fledgling has left the nest and was a considerable distance away from it! 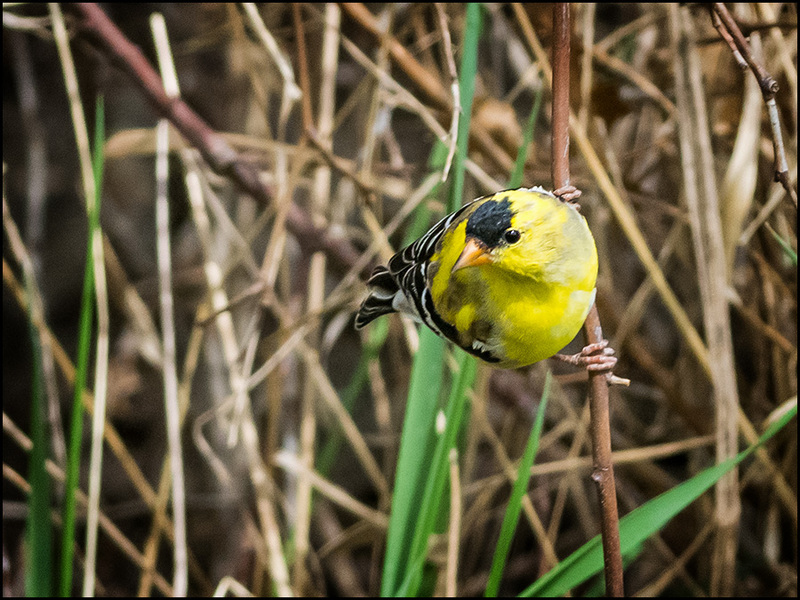 This little guy was pretty active! 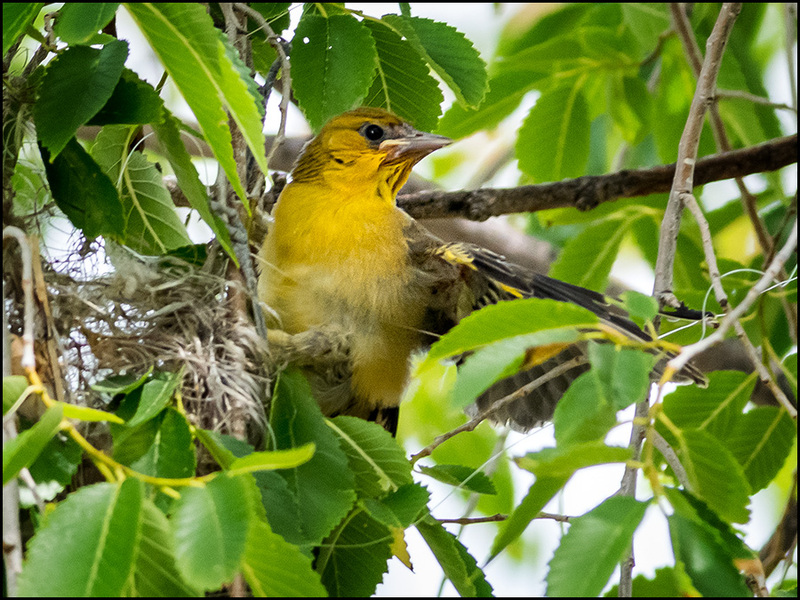 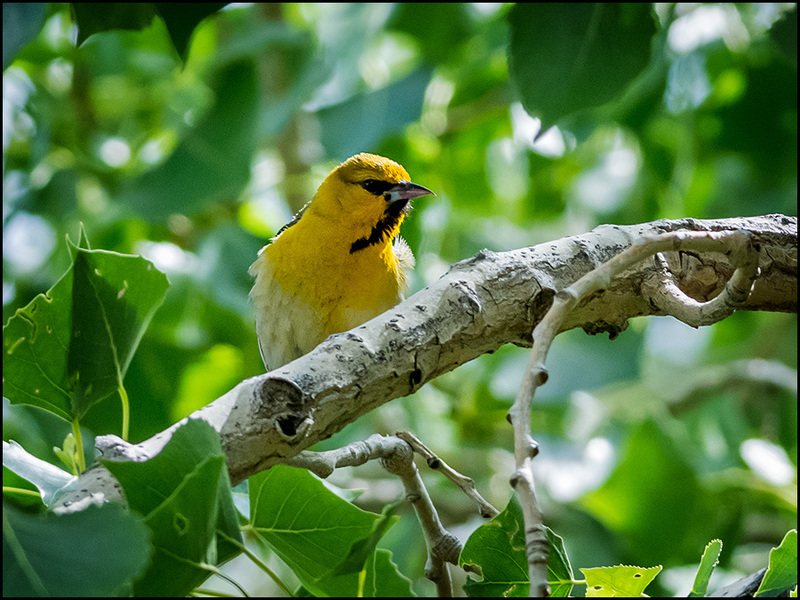 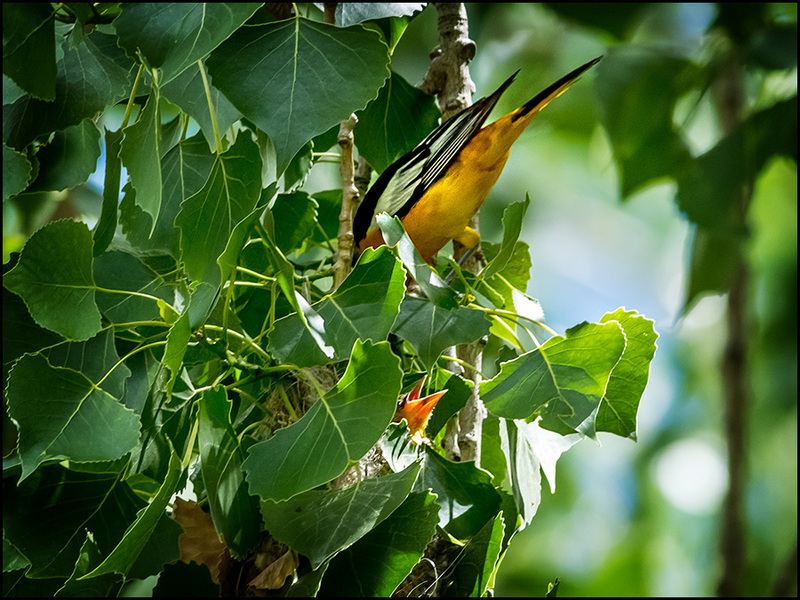 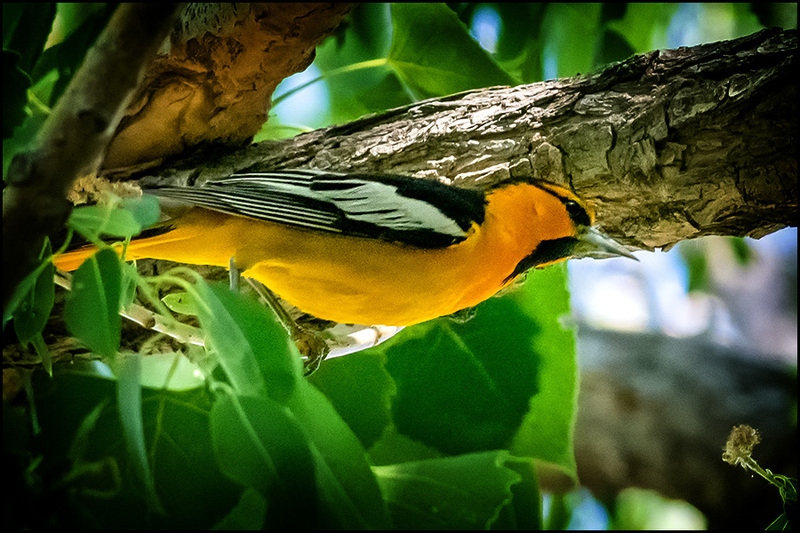 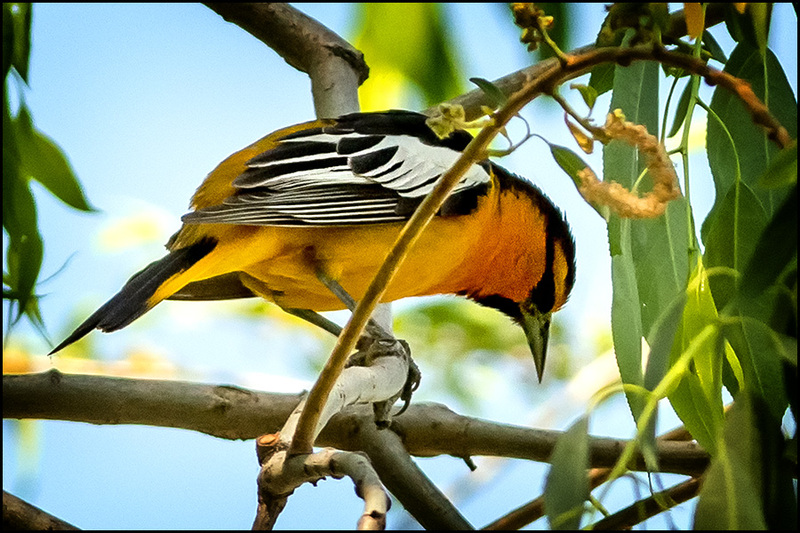 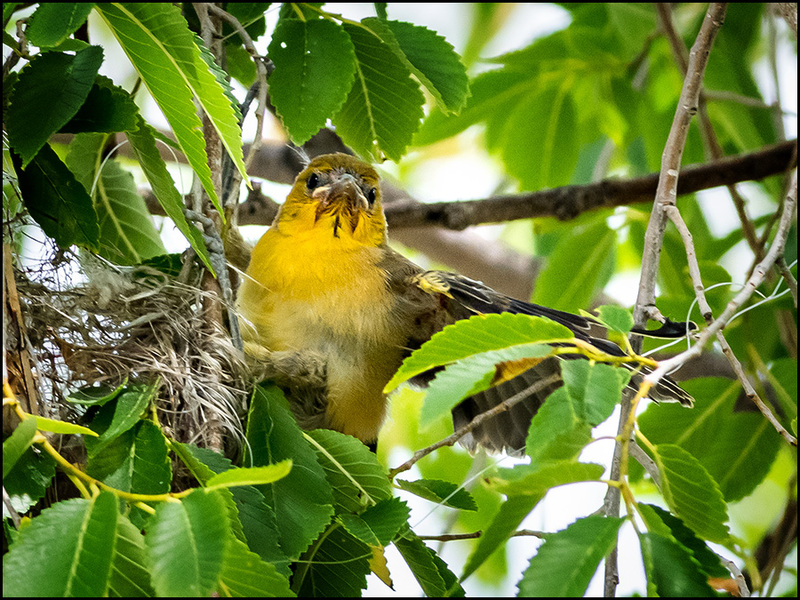 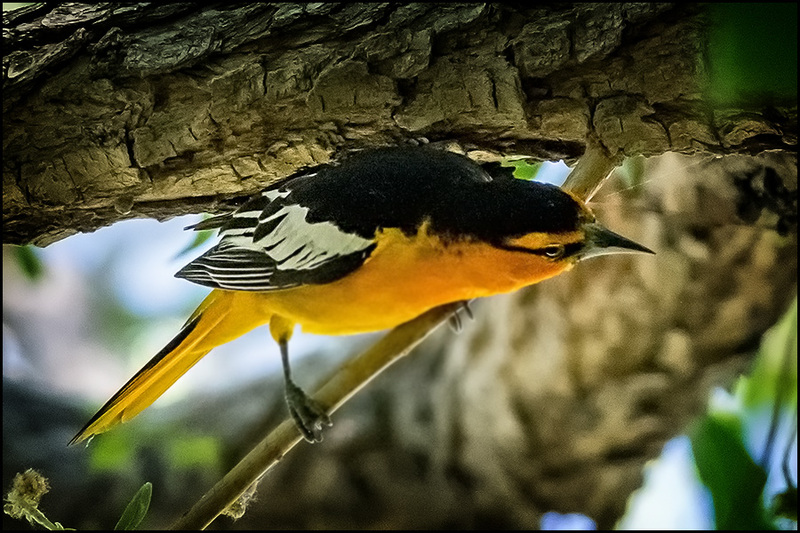 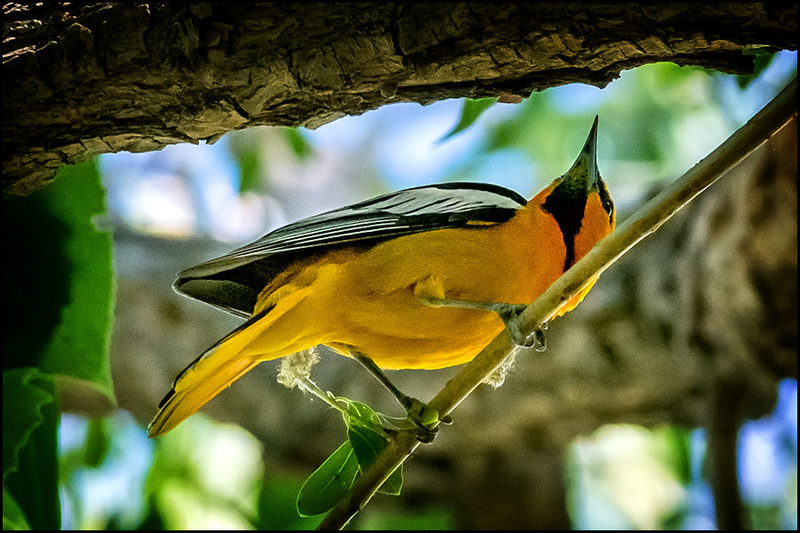 At the same time, the male Bullock's Oriole was attending to the young that stayed in the hanging nest! 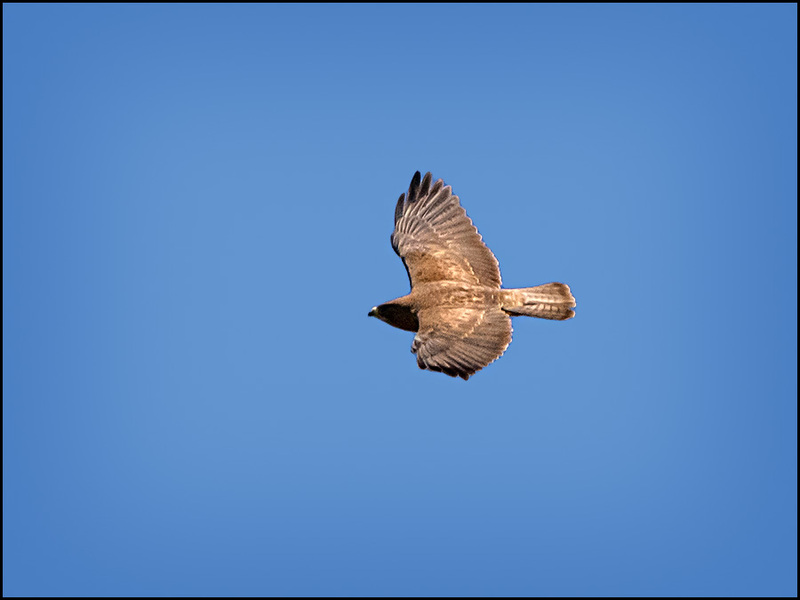 One can be seen here. 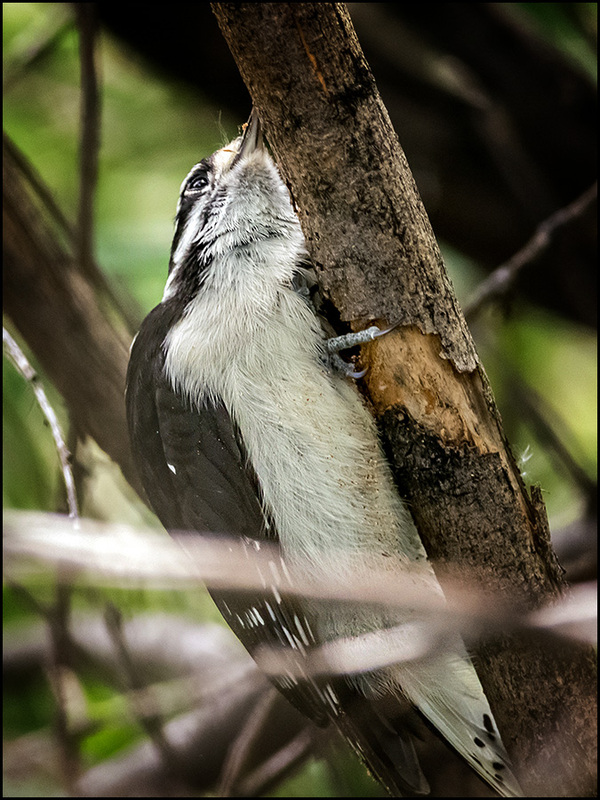 and preparing to fly out for more insects for its brood. 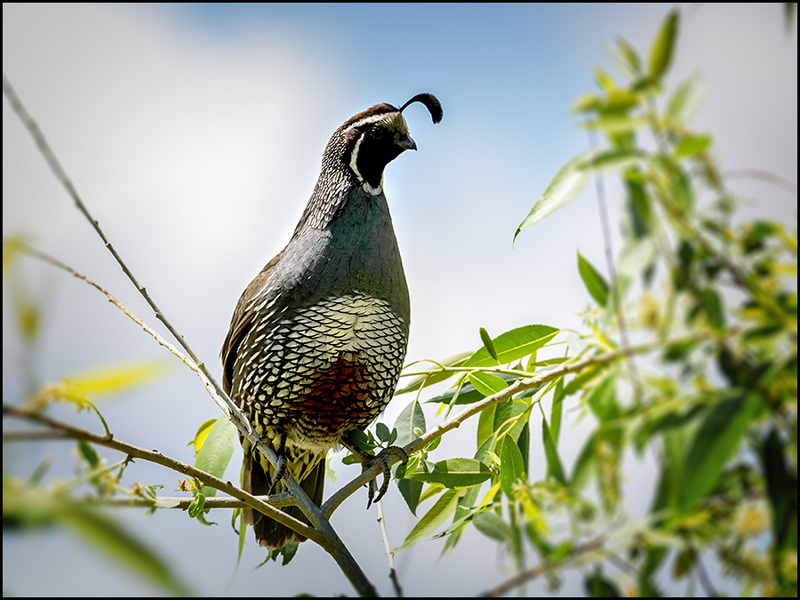 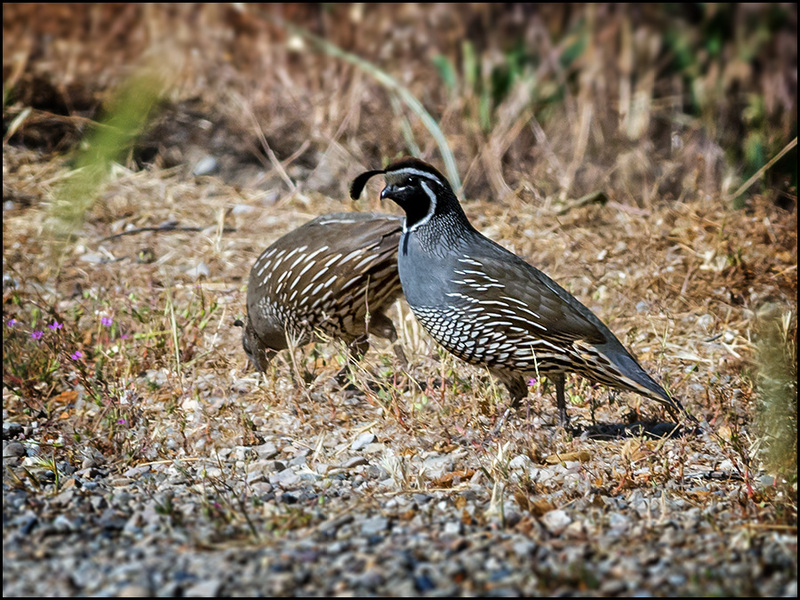 Last but not least, a handsome male California quail. 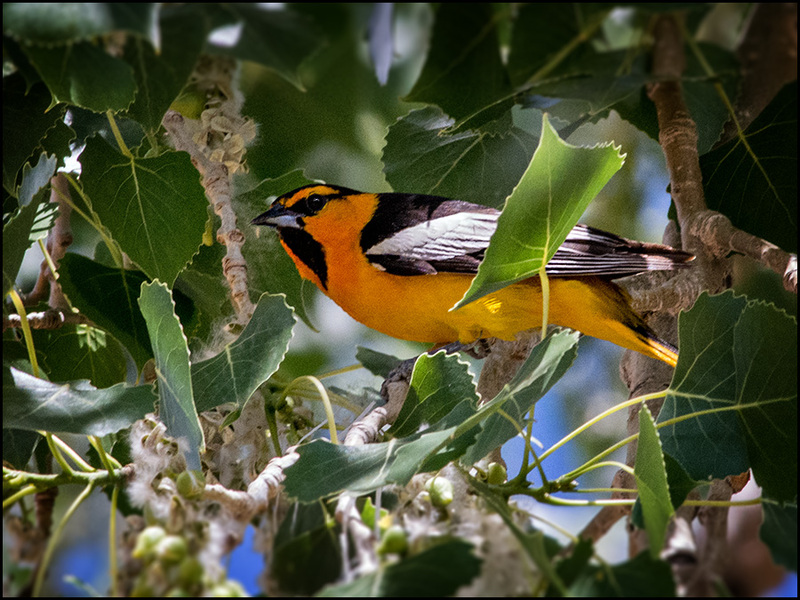 Mill Race Pond in Taylorsville, UT, adjacent to the Murray/Jordan River Parkway did NOT disappoint yesterday! 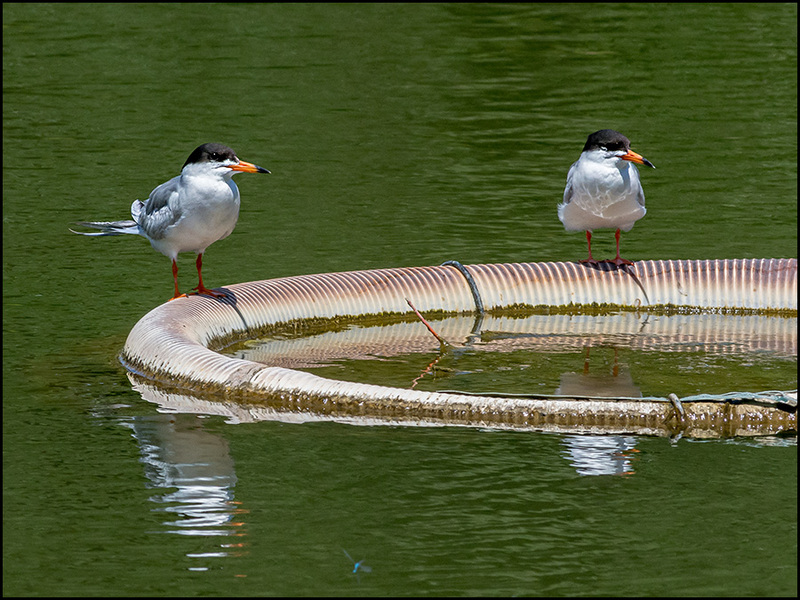 Each of the 5 floating devices on the tiny pond was occupied by a fish-eating bird! 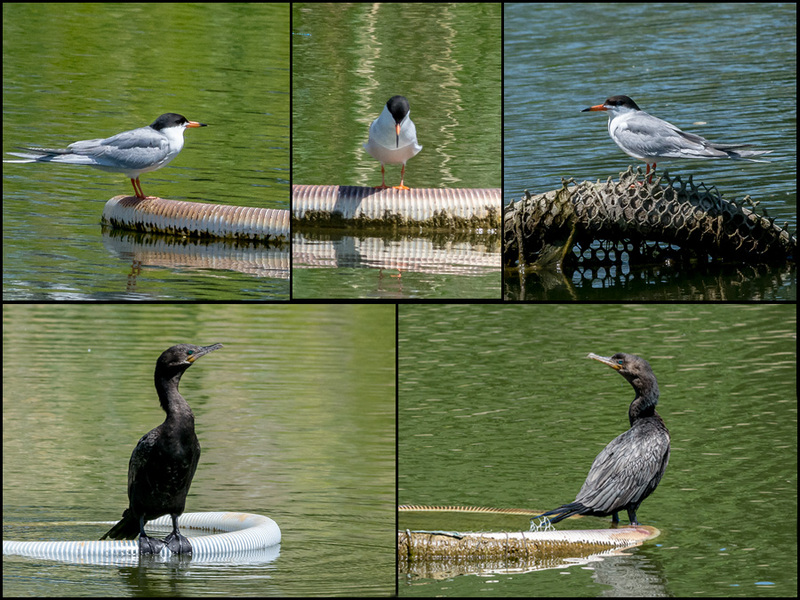 There were, 3 Forster's Terns along with 2 Neotropic cormorants! 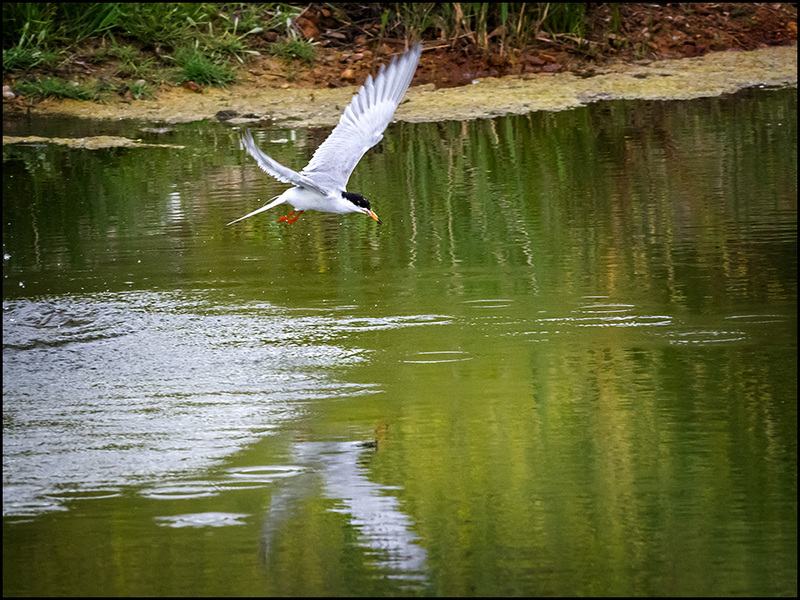 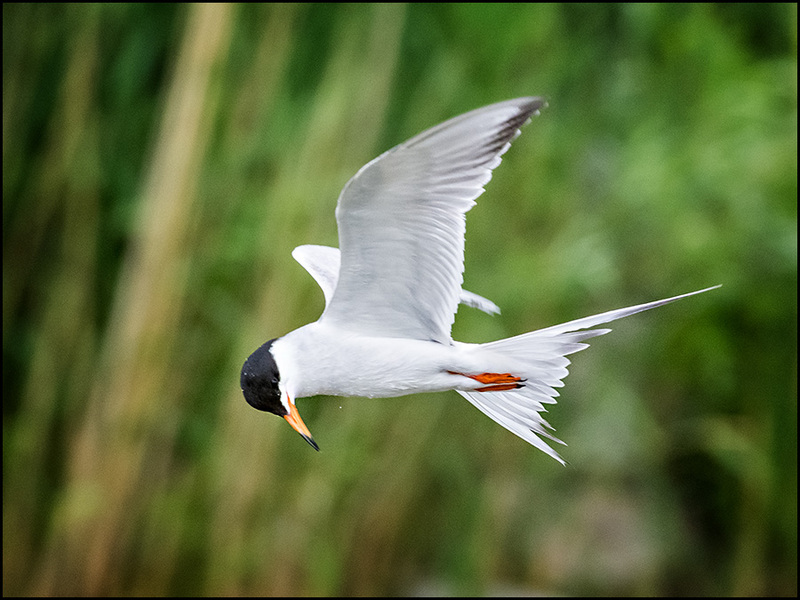 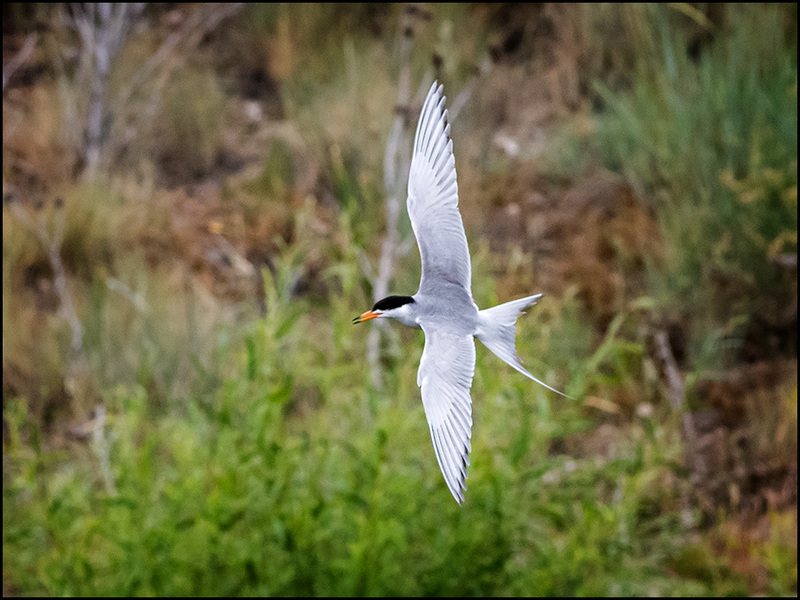 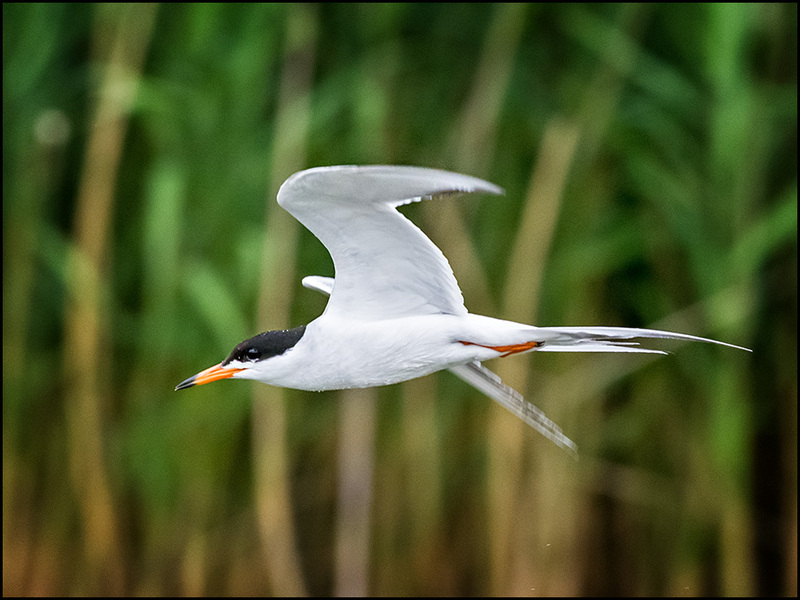 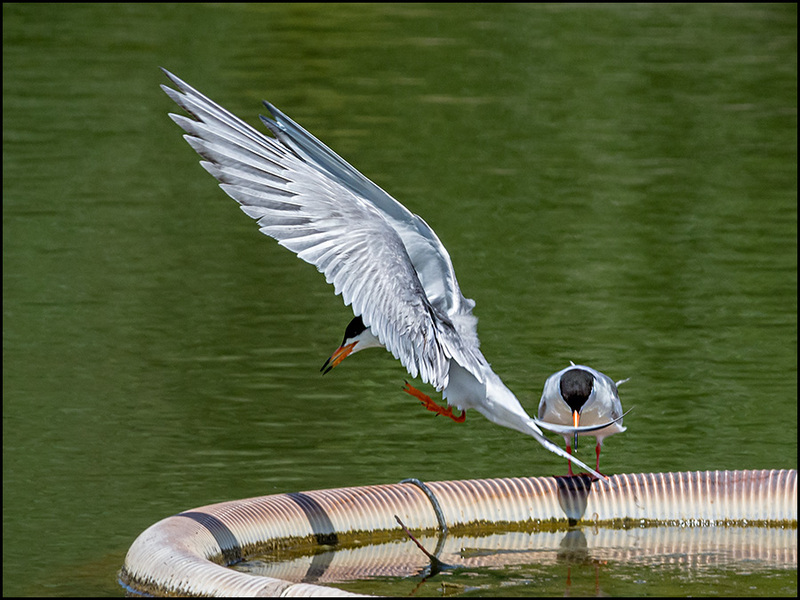 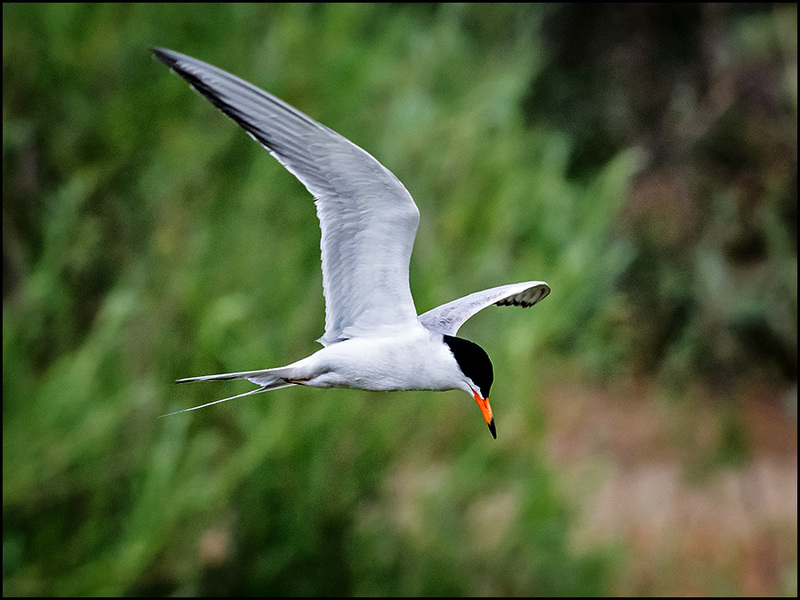 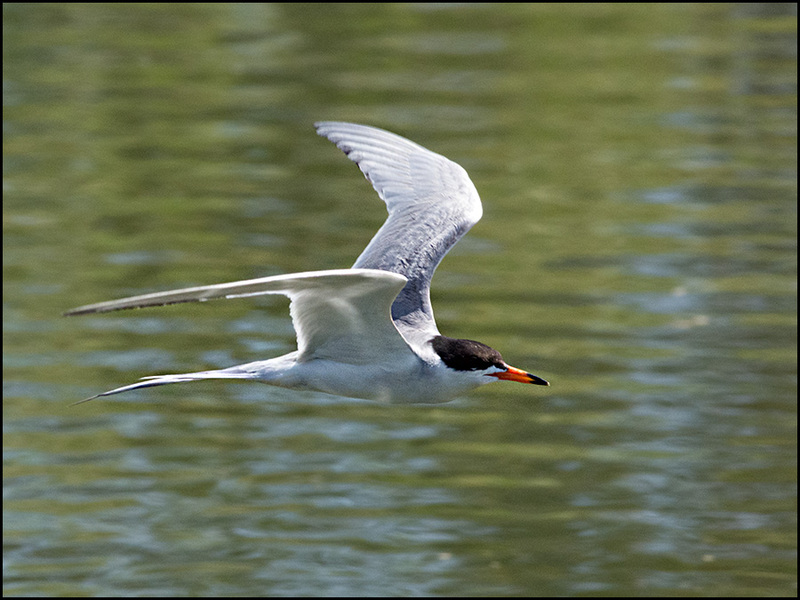 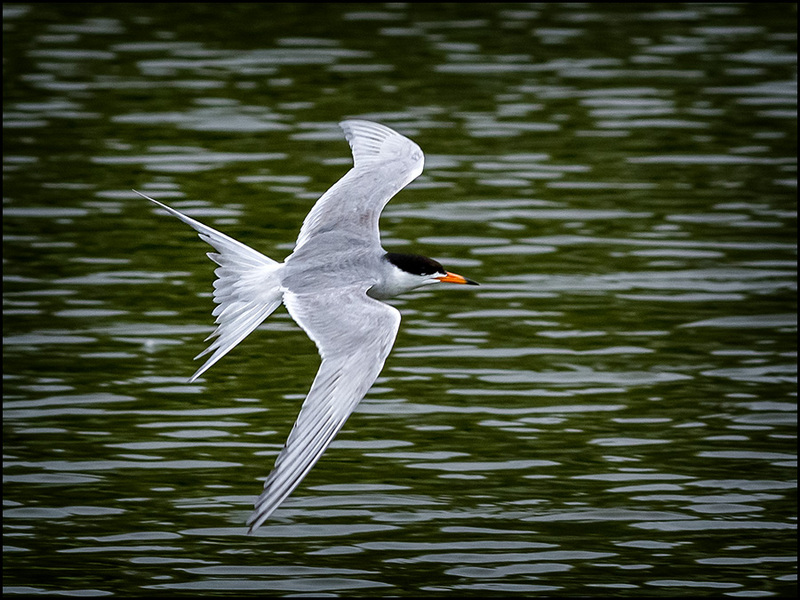 I took advantage of the Forster's Terns to hone my skills photographing birds in flight! 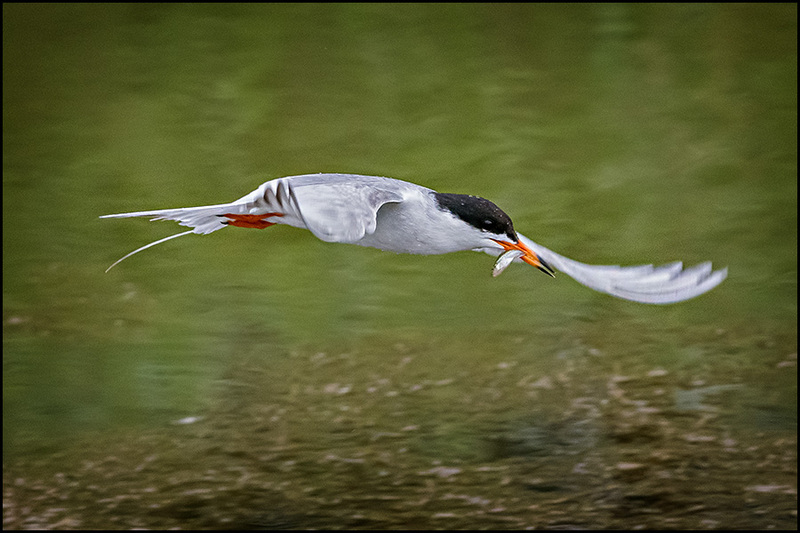 The Terns were capturing tiny fish, eating them while in midflight! 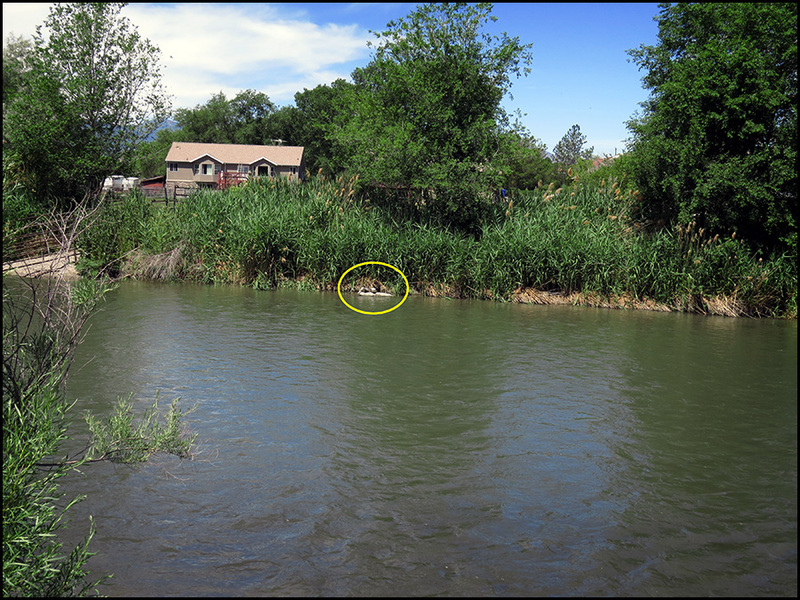 Here, one just plunged into the water. 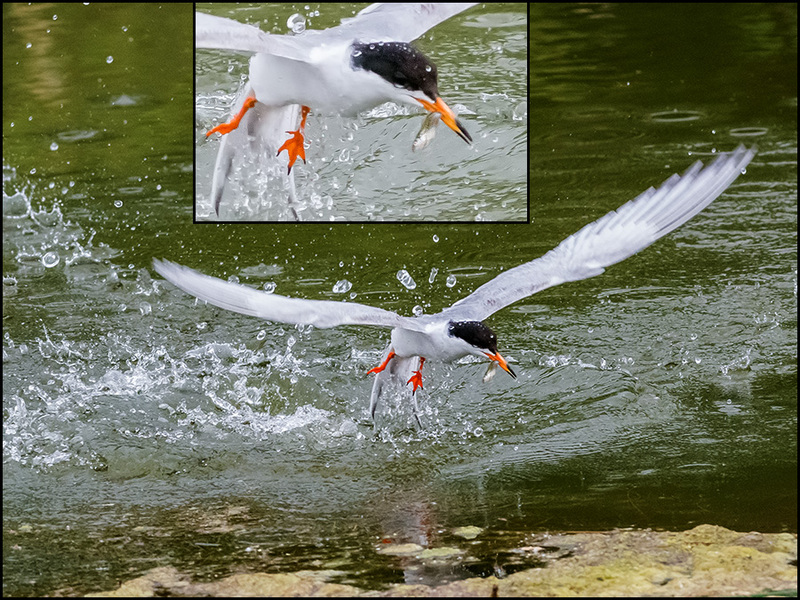 Look closely in the 2 following images and you'll see the tiny fish. 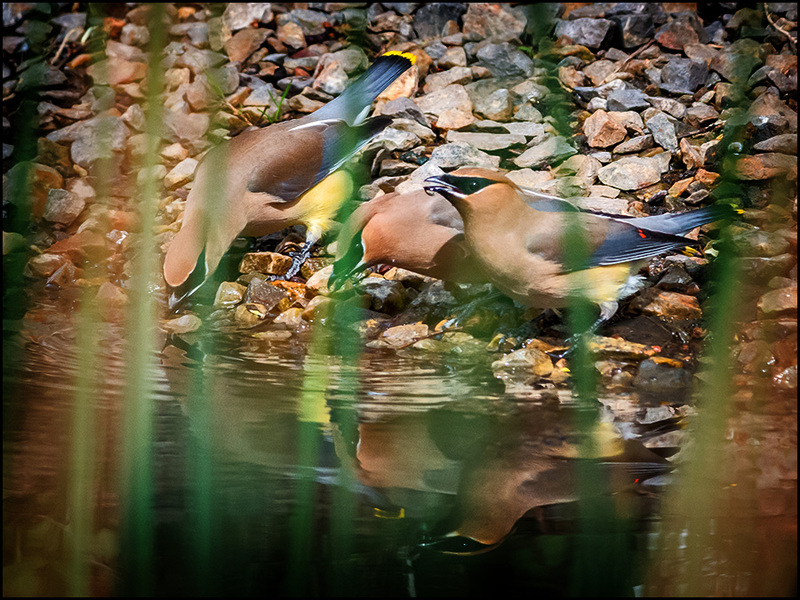 Lovely birds, with their forked tails.. Their somewhat erratic flight patterns make it tough to get them in focus. 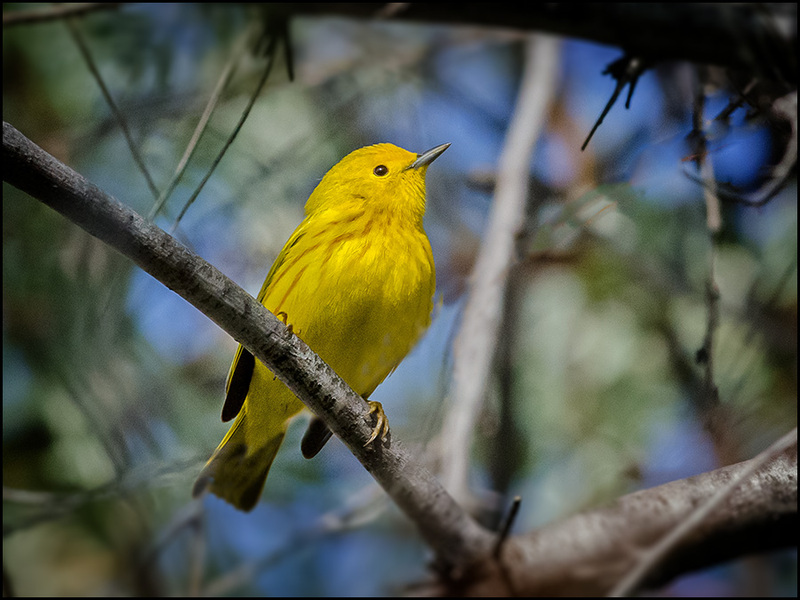 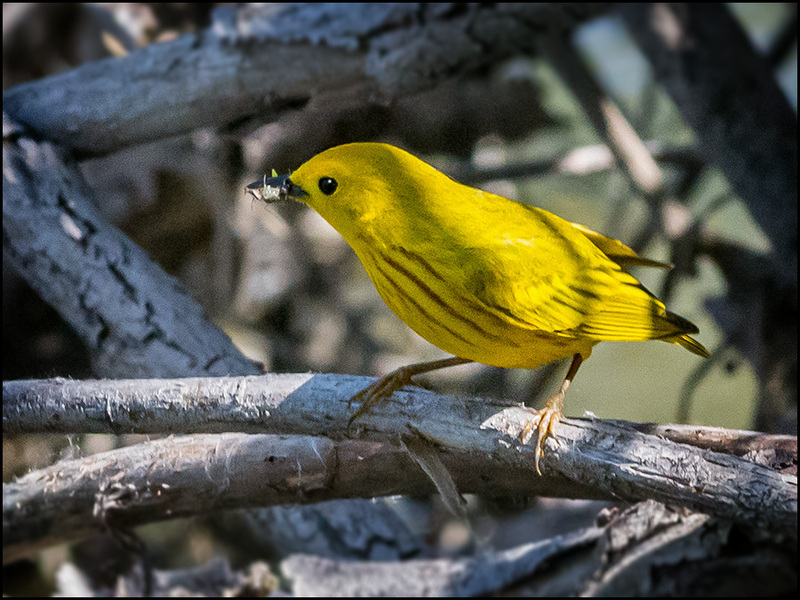 Yellow Warbler, gathering food for its hidden young. 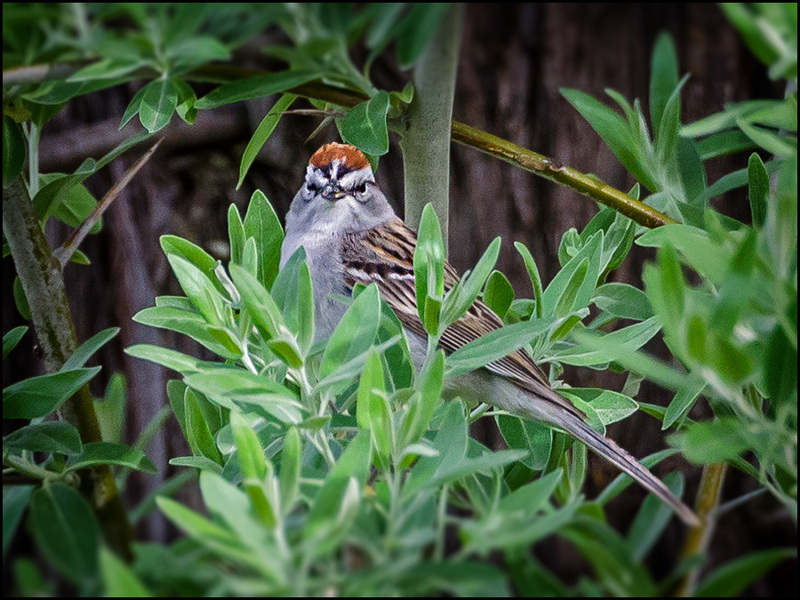 This bird was in deep shade. 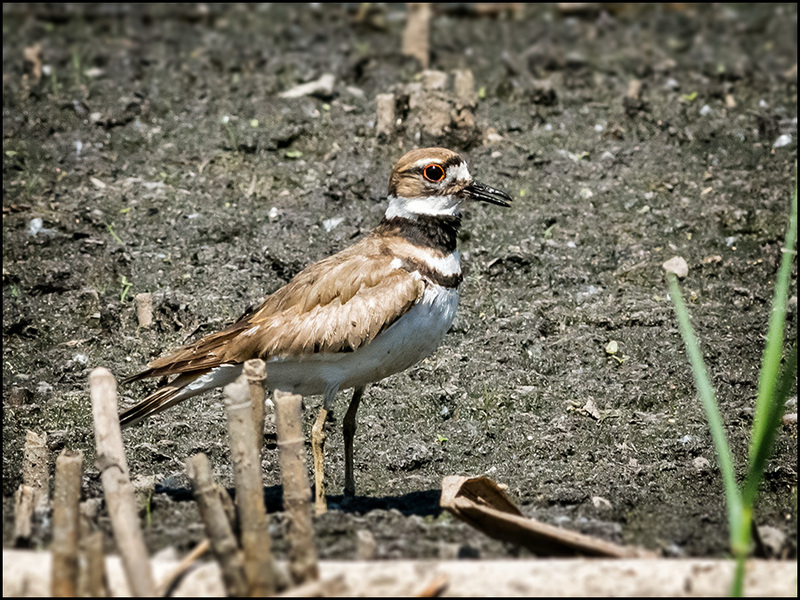 Killdeer images, where it feigned injury to draw me away from an unseen nest. 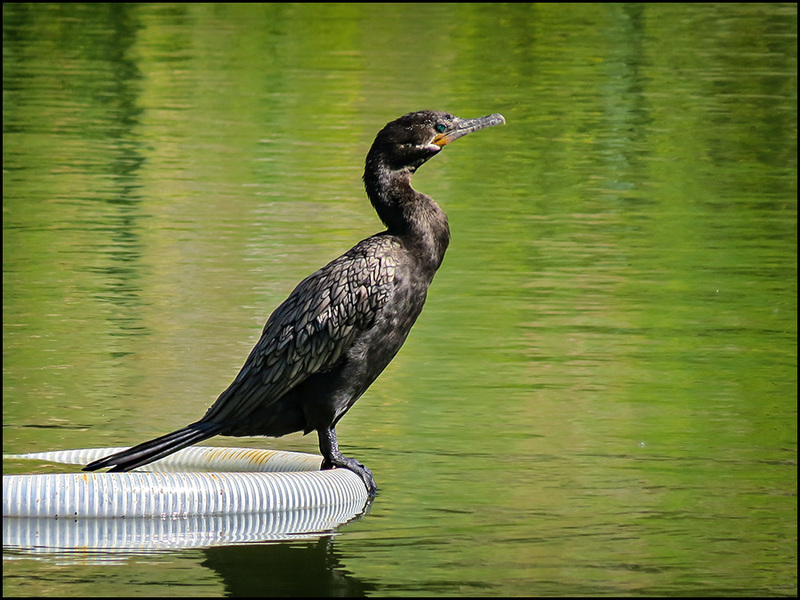 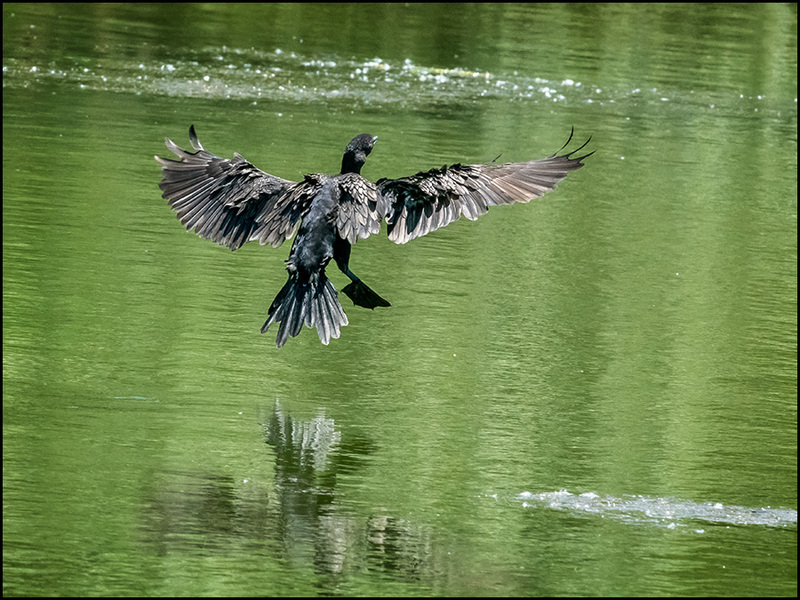 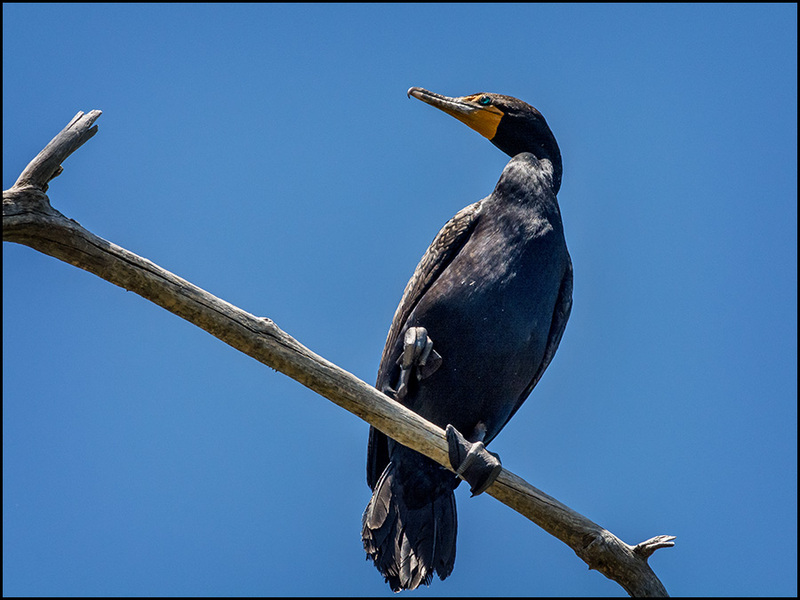 Neotropic Cormorants still favor the Mill Race Pond in Taylorsville. 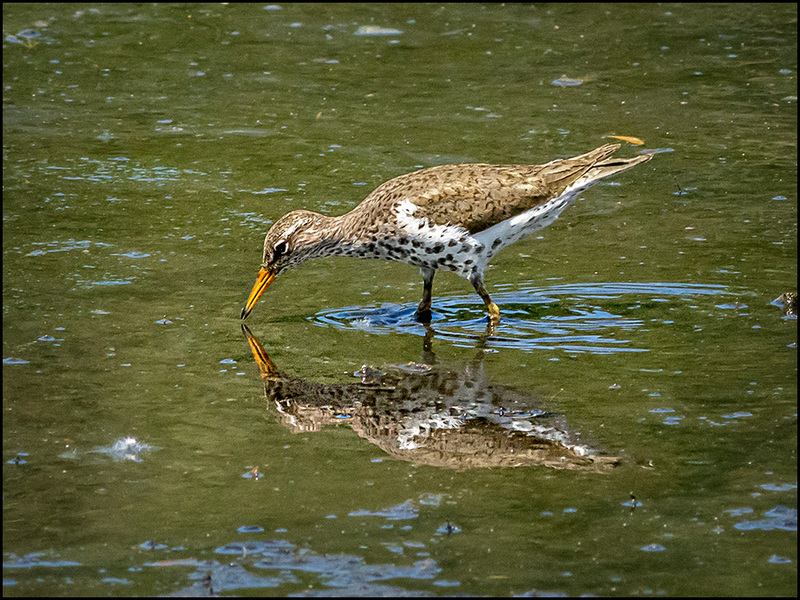 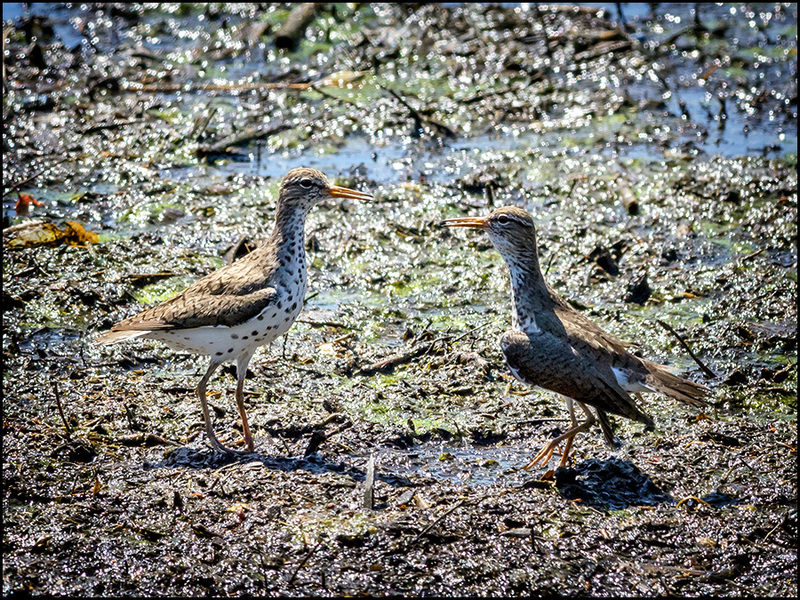 The Sandpiper encountered a 2nd Sandpiper! 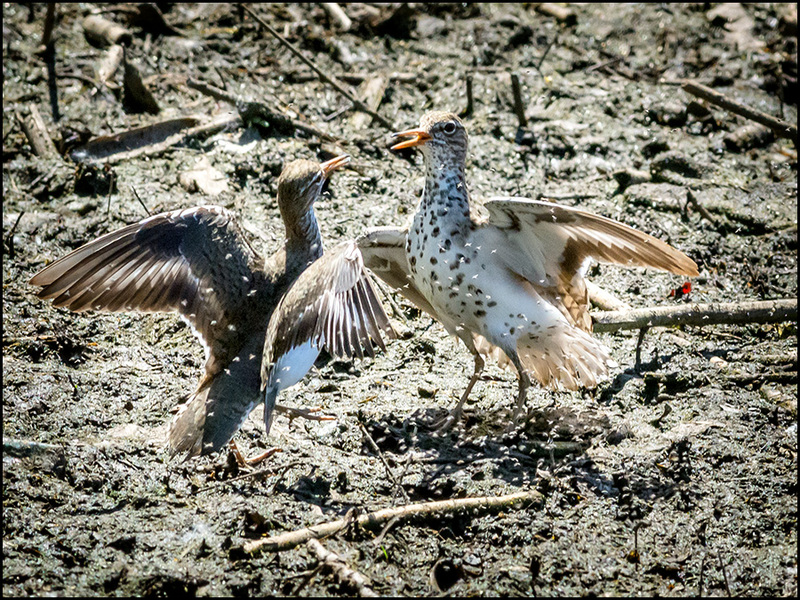 Both birds began some sort of staging behavior! 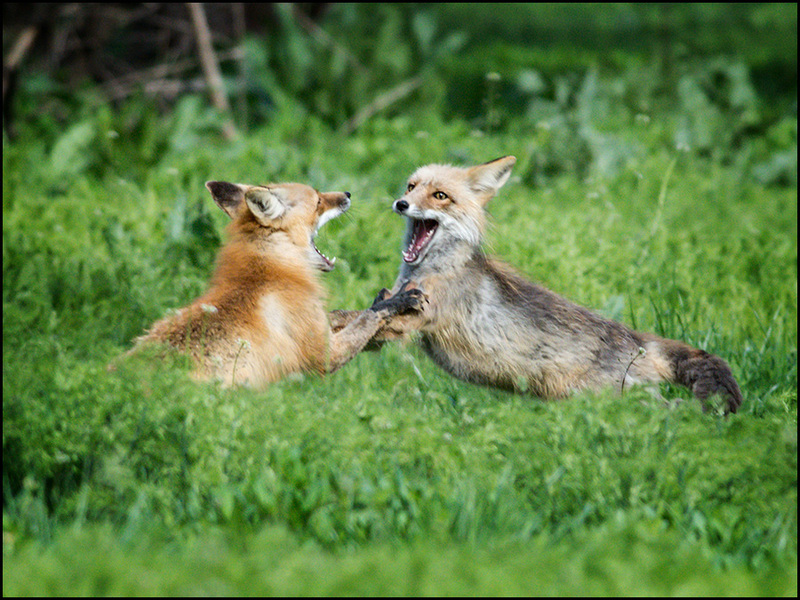 Things got heated up between them! 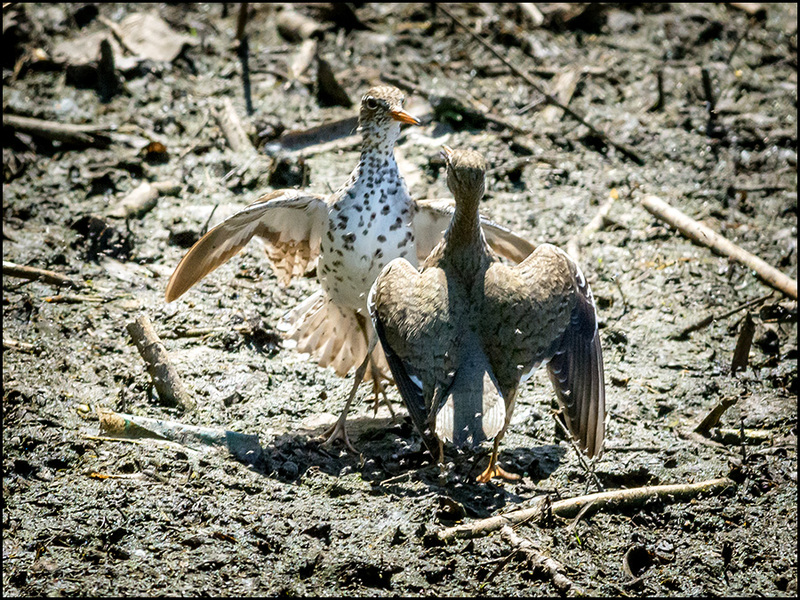 This behavior continued for some time! 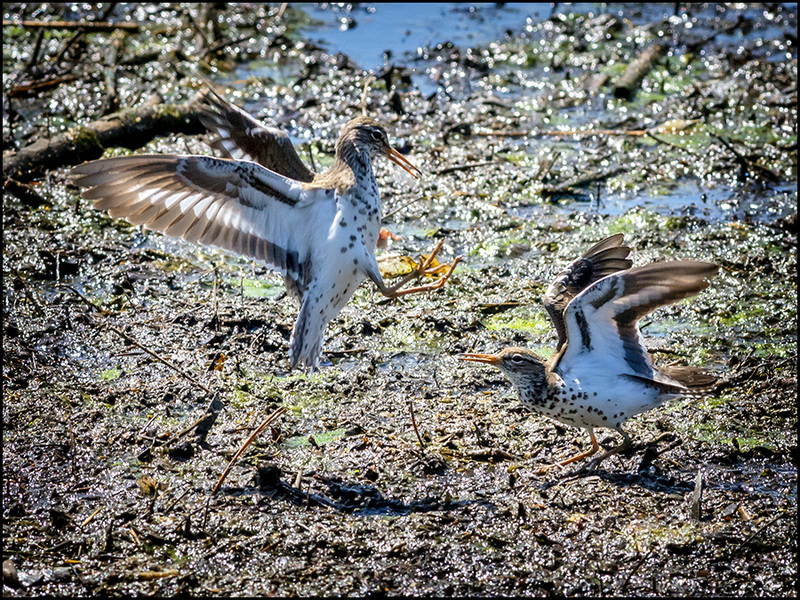 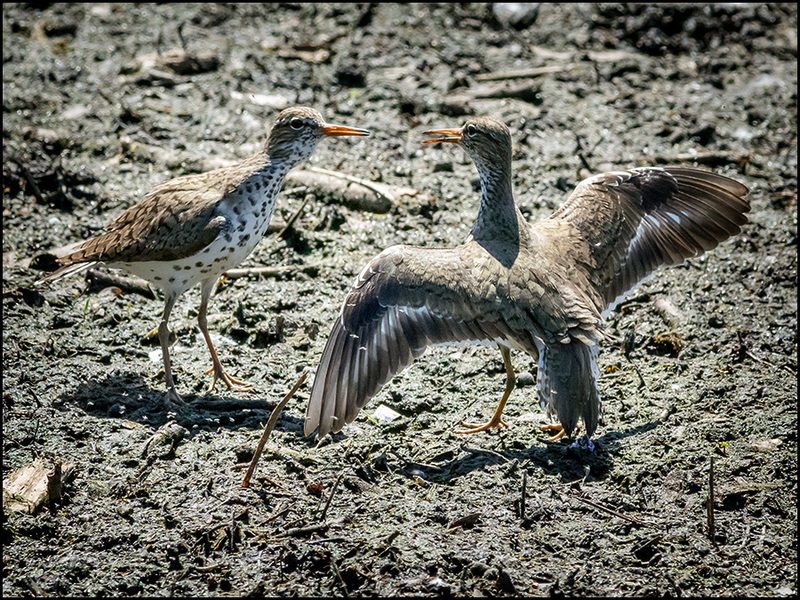 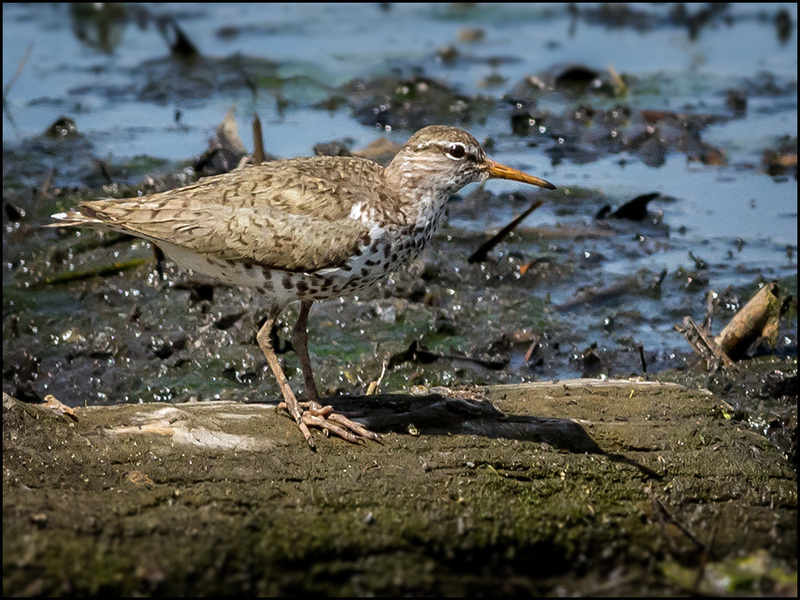 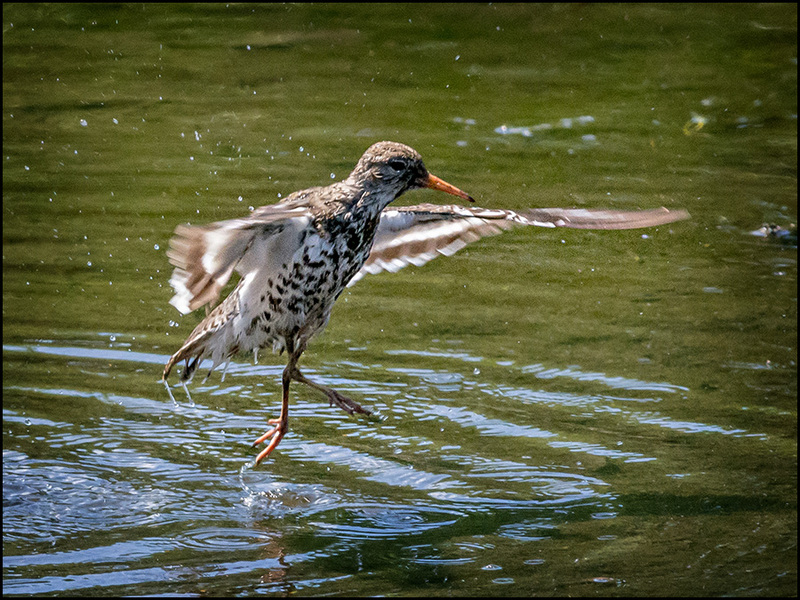 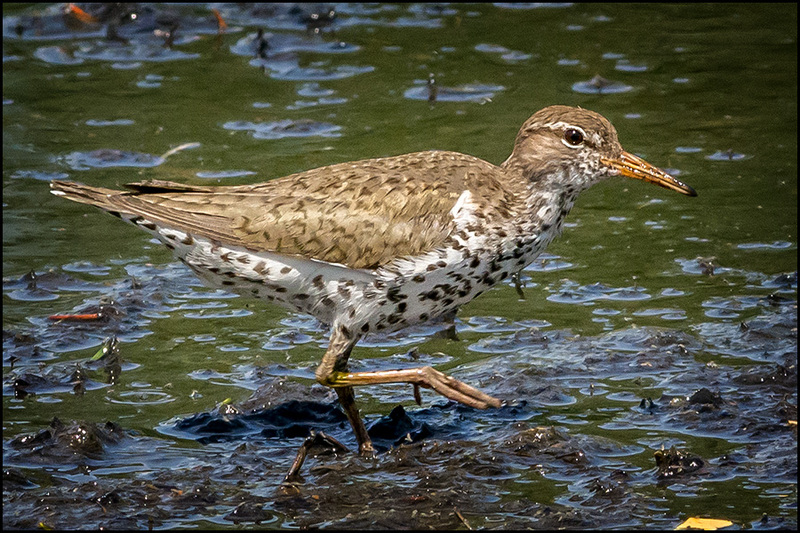 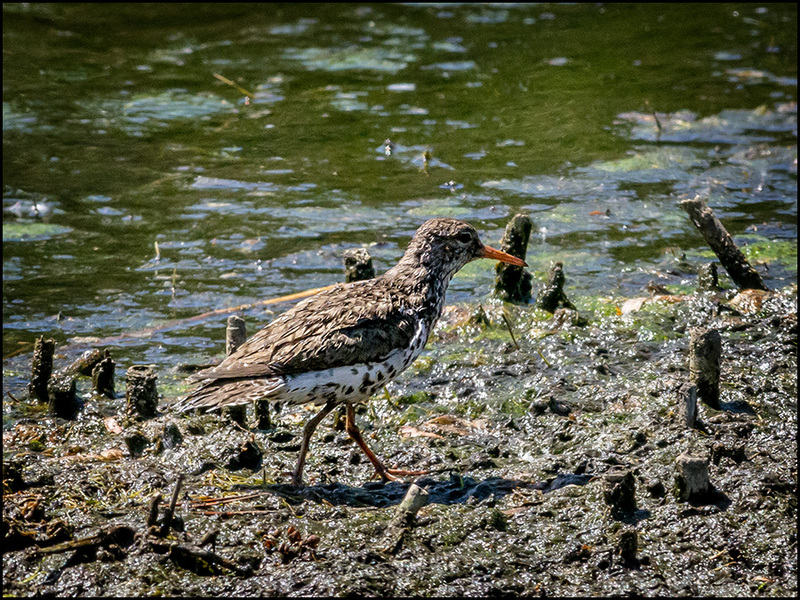 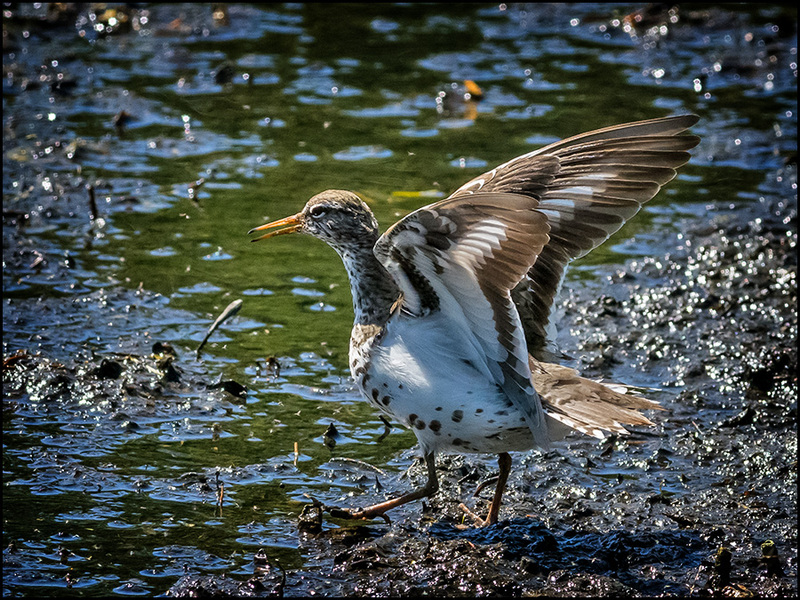 Leaving the original Spotted Sandpiper alone, still agitated! 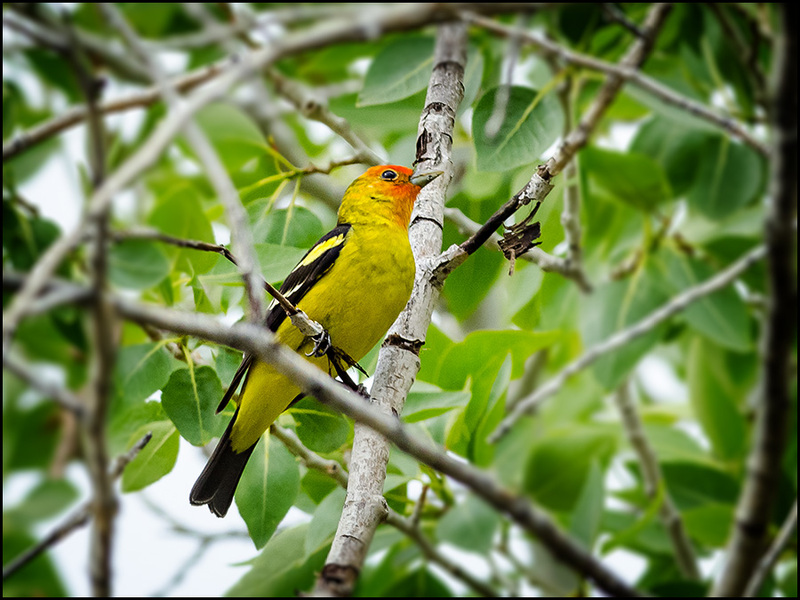 they both are the result of named-alike streams beginning eastward, in the 'Wasatch Front' range of mountains. 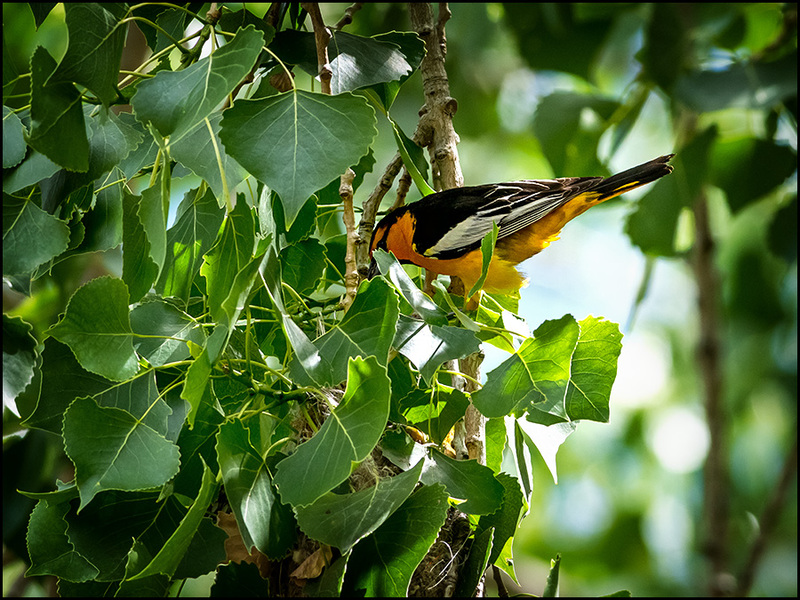 Big Cottonwood Park is the home of Big Cottonwood Creek (since the adjacent side-park, 'Creekside' is included as Big Cottonwood park). 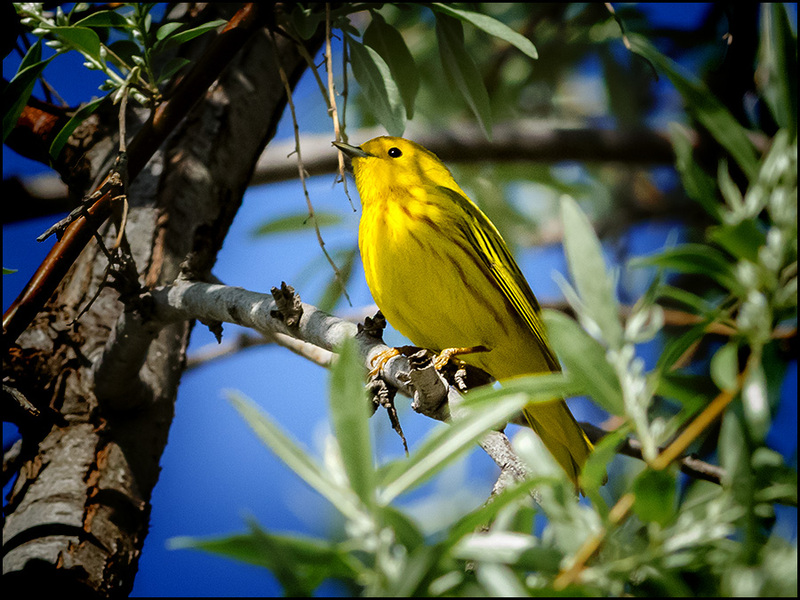 Crestwood Park is the home of Little Cottonwood Creek. 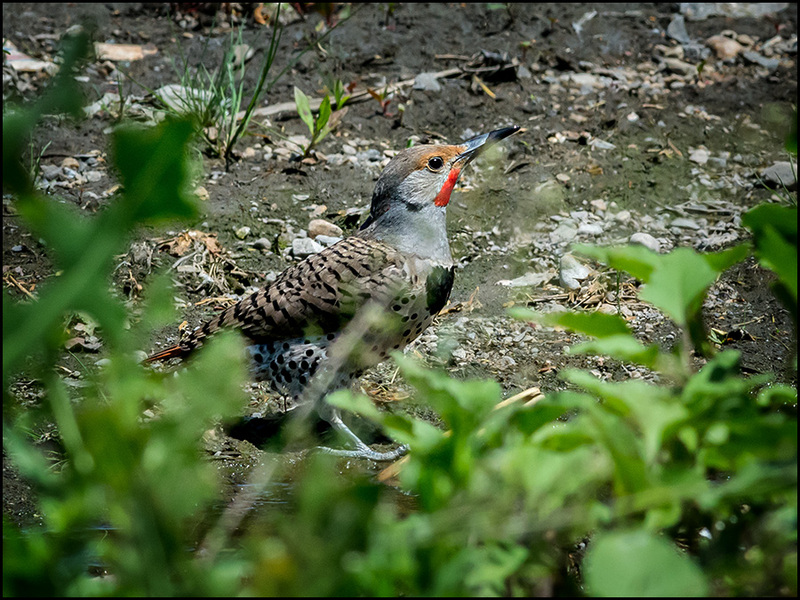 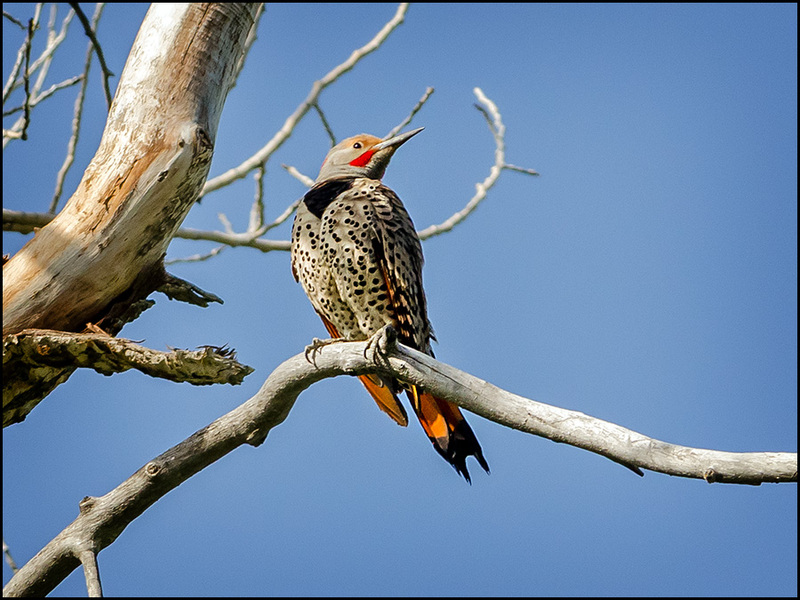 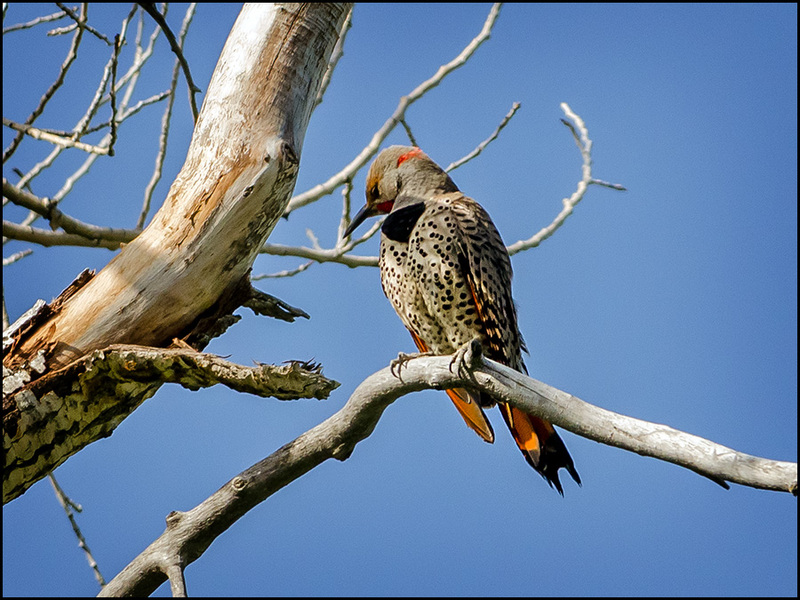 but look closely and you'll see this male is an Intergrade Red-shafted/Yellow shafted Northern Flicker, also seen often at Big Cottonwood Park! 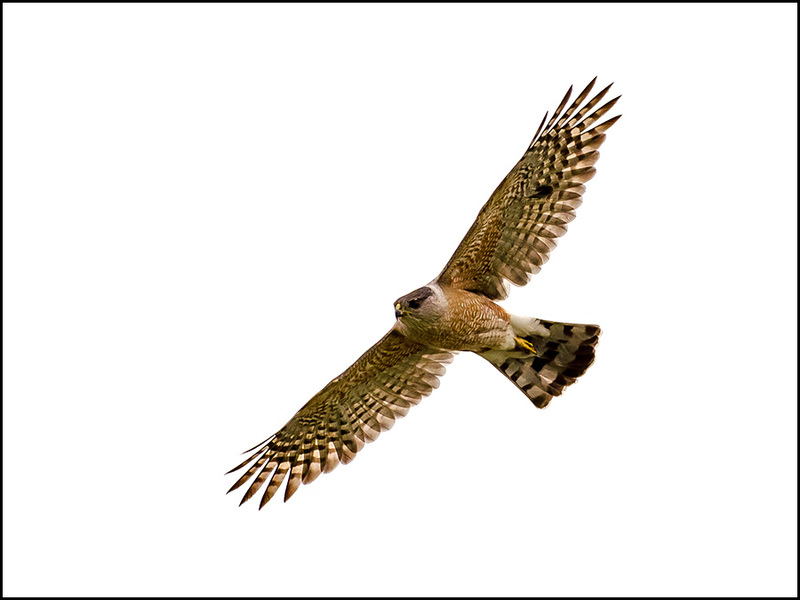 A shift of the bird's head reveals more distinctly, a red crescent on the back of it's neck... the mark of an intergrade! 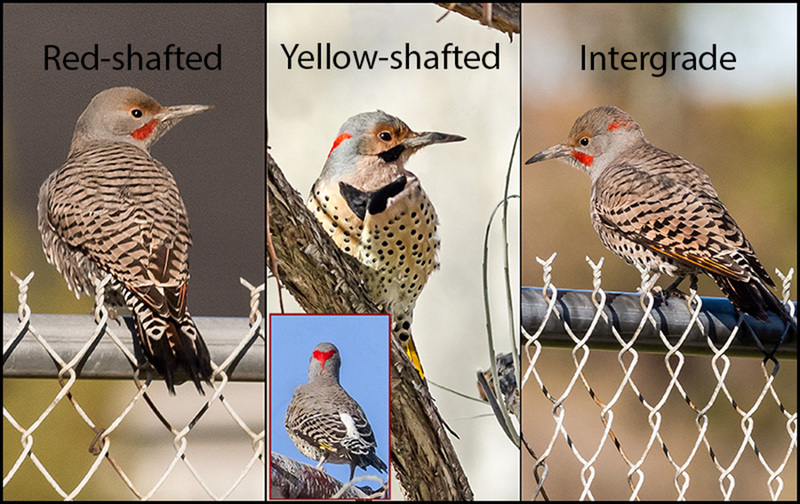 Below, see 3 'flavors' of Northern Flickers from Big Cottonwood park. 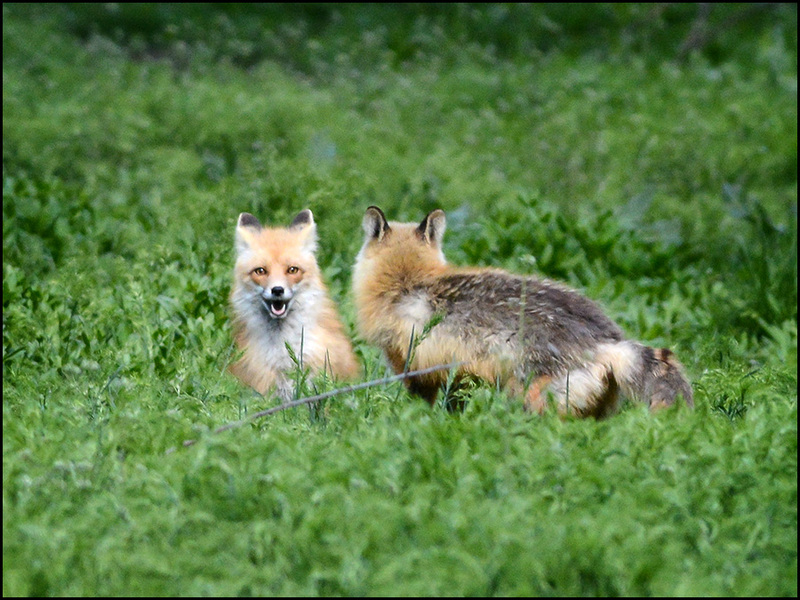 Both areas have a significant number of Red Foxes, like this bedraggled adult female at Crestwood yesterday. 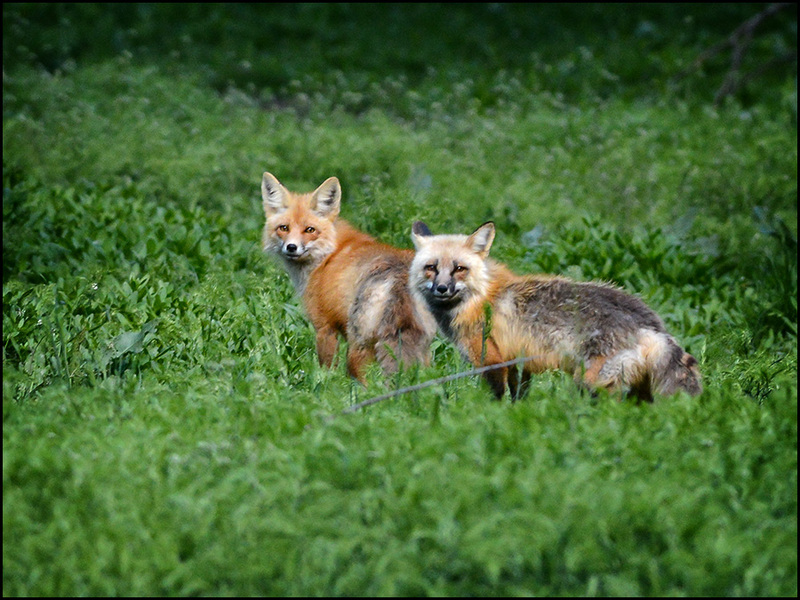 Below: Female mother fox at Crestwood. 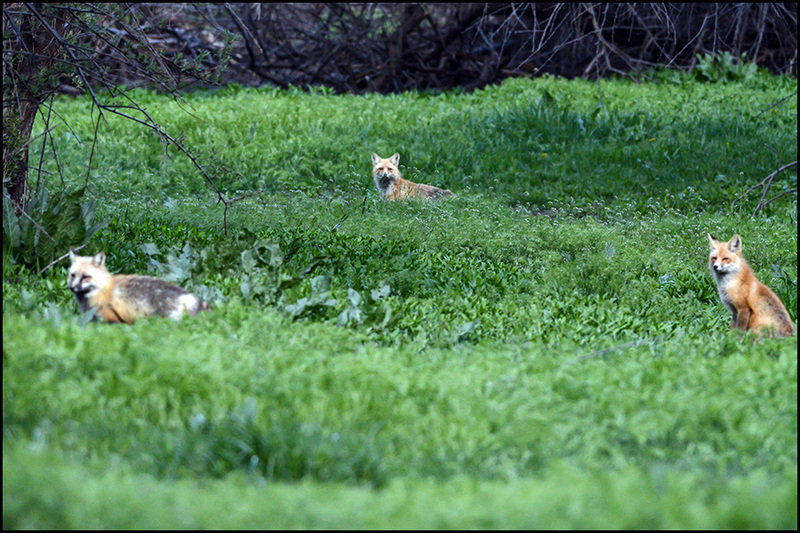 An expanded view reveals a total of 3 foxes, with 2 kits appearing. 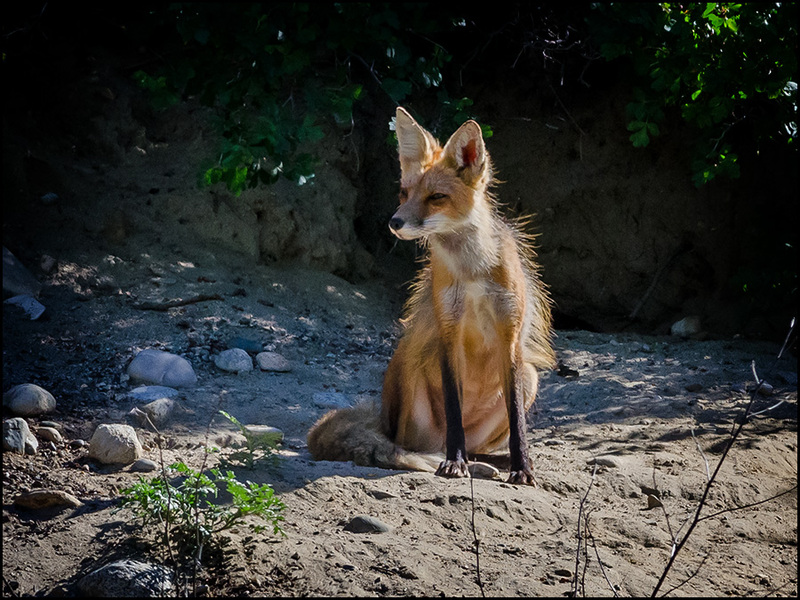 At Crestwood, females with Kits typically look like this one, scruffy and skinny. 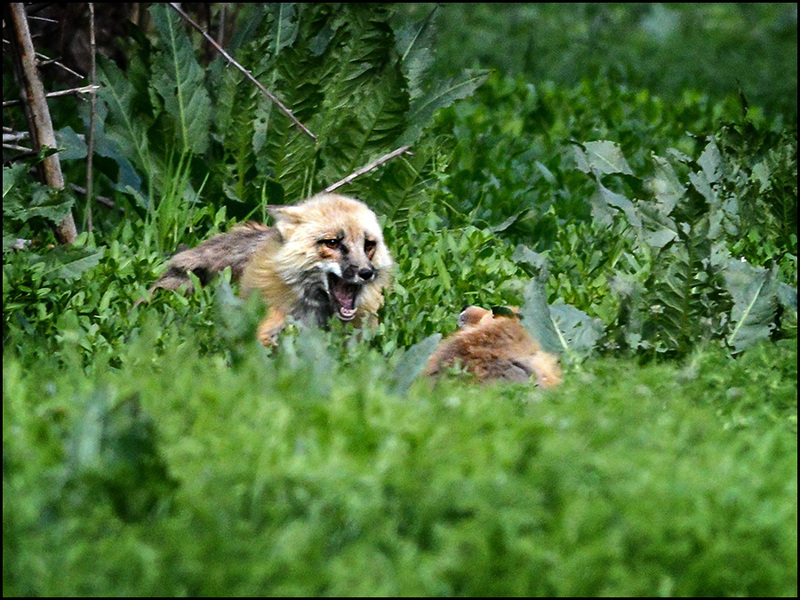 This mother had no sense of humor when a kit wandered by, baring her teeth at him! 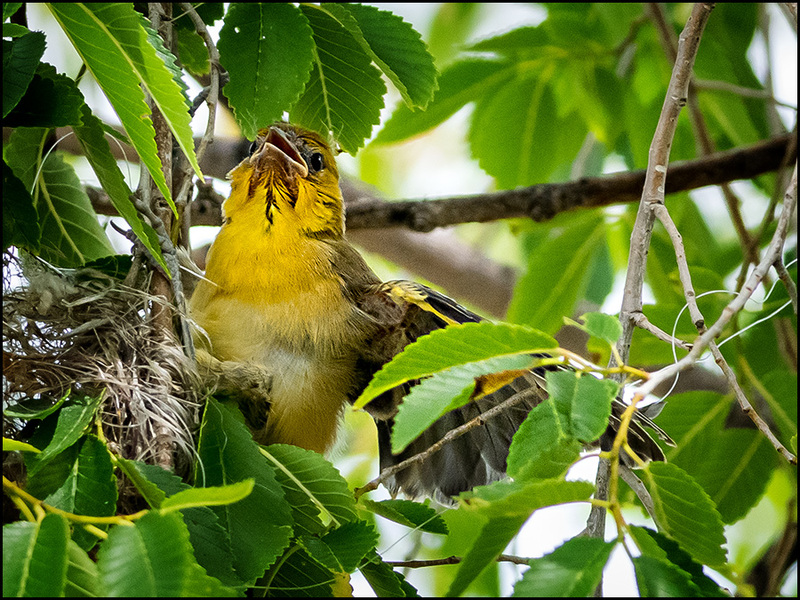 My guess is, food supplies were consistently meager, causing the mothers to work harder in their attempts to feed their young. 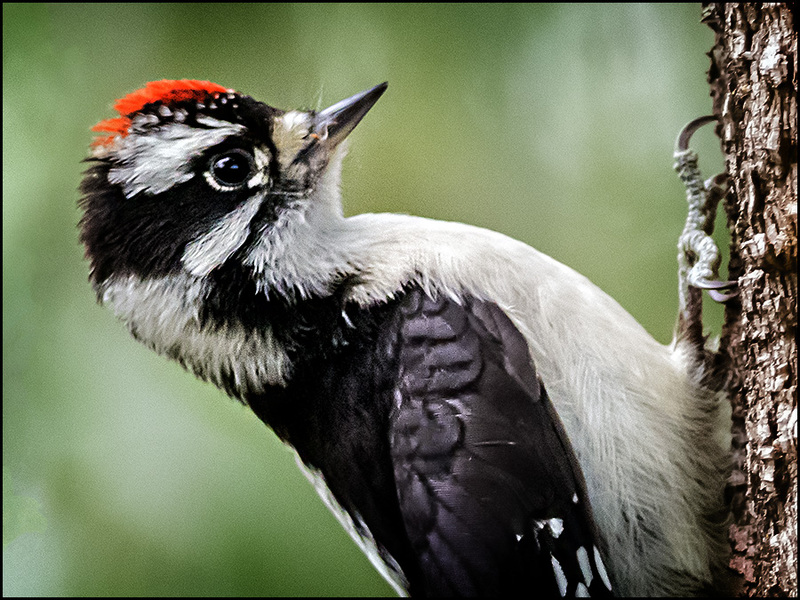 As seen with this current offspring, Crestwood young are in good shape! 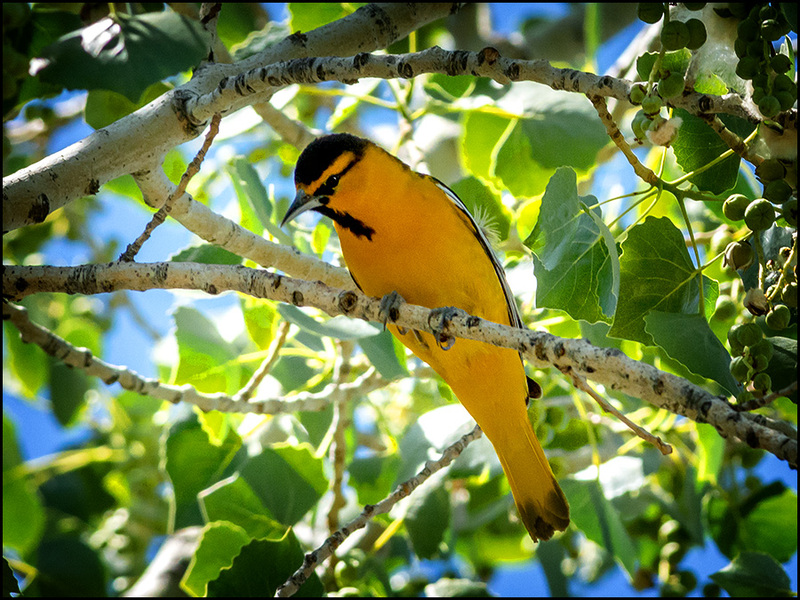 Combined visits to Crestwood Park, and Big Cottonwood Park, with similar results! 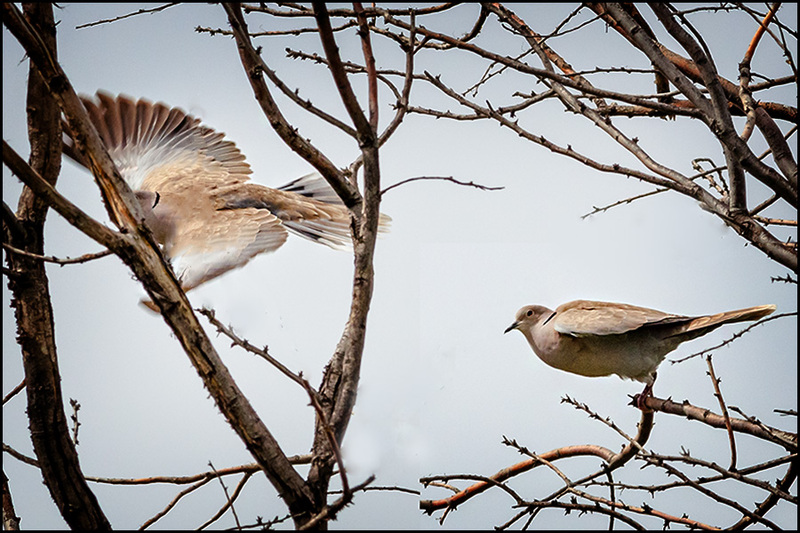 An invasive species of Dove, a pair of "Eurasian Collared Doves"! 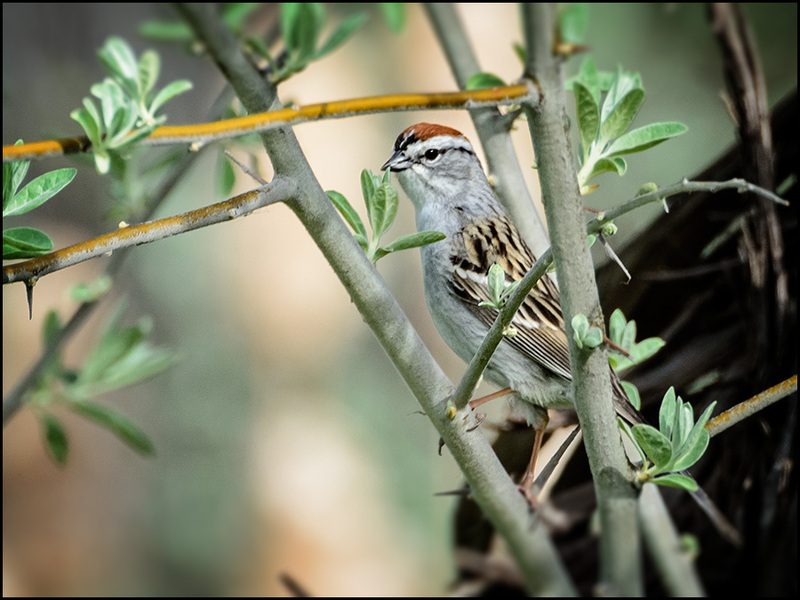 Even with their small size, these birds stand out against green foliage! 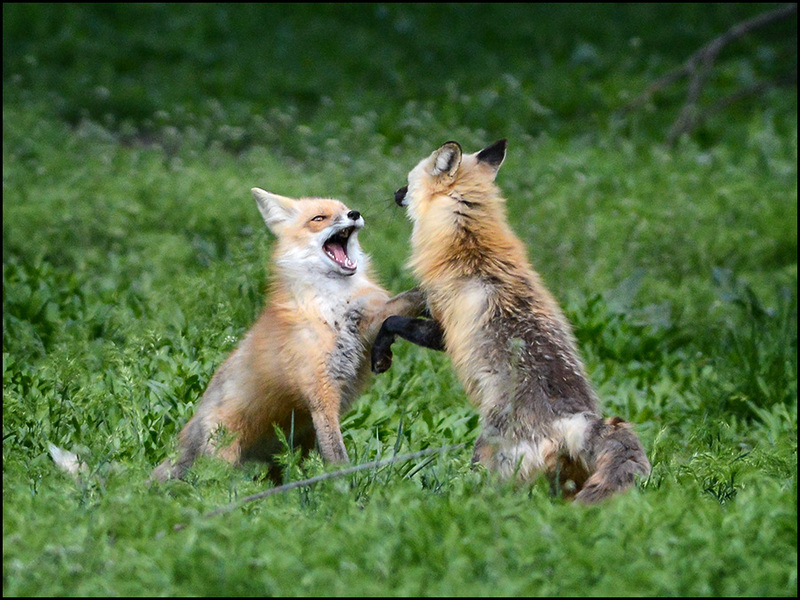 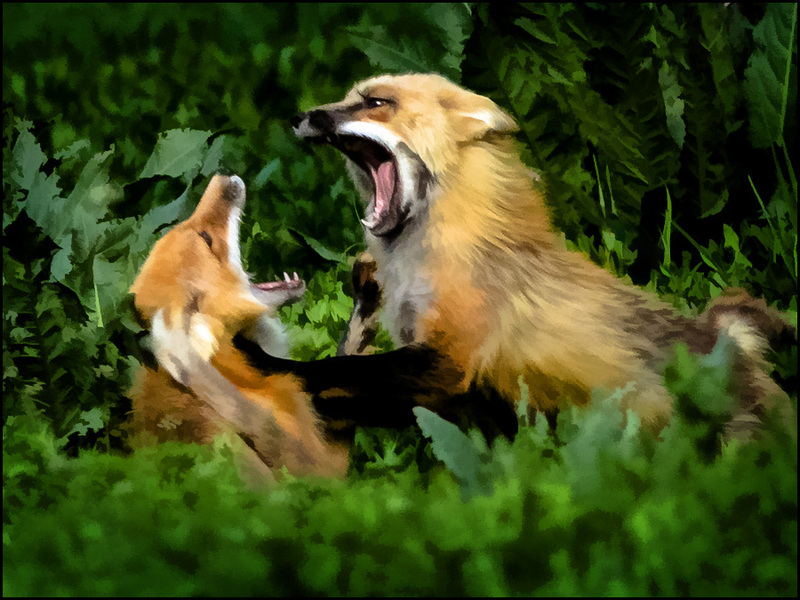 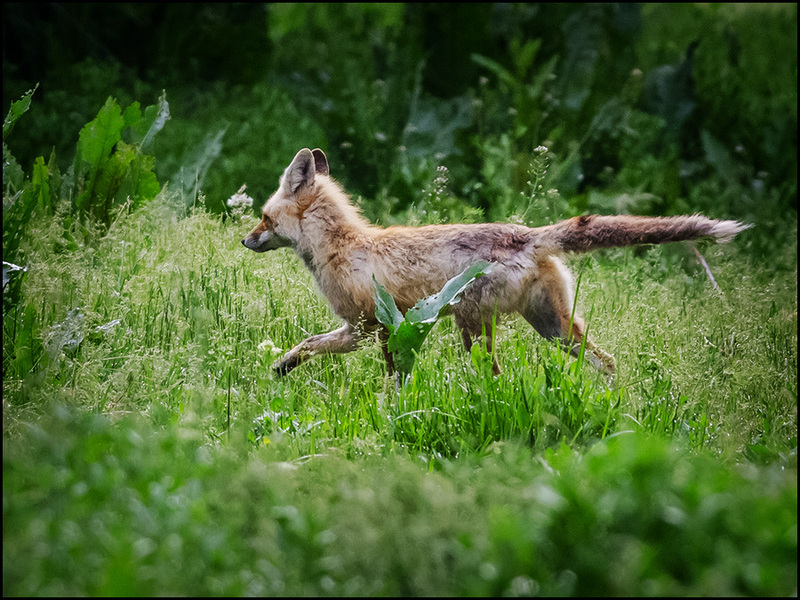 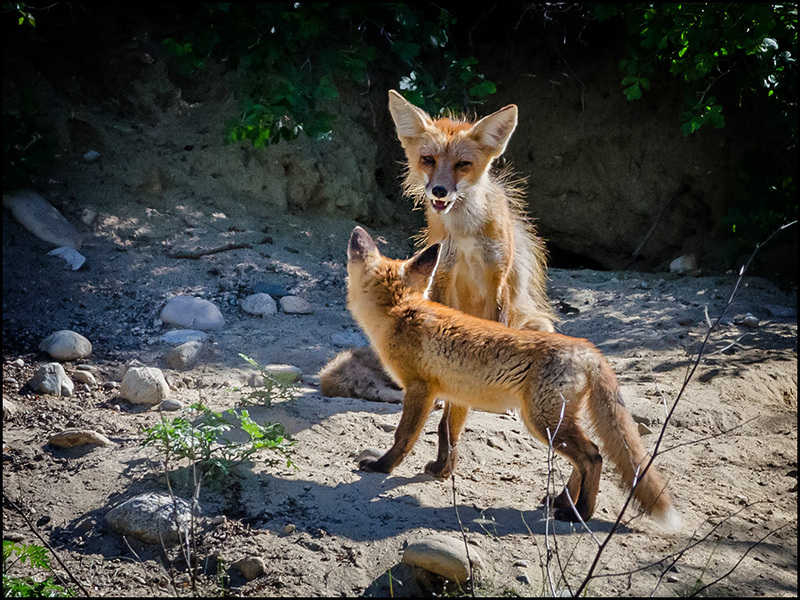 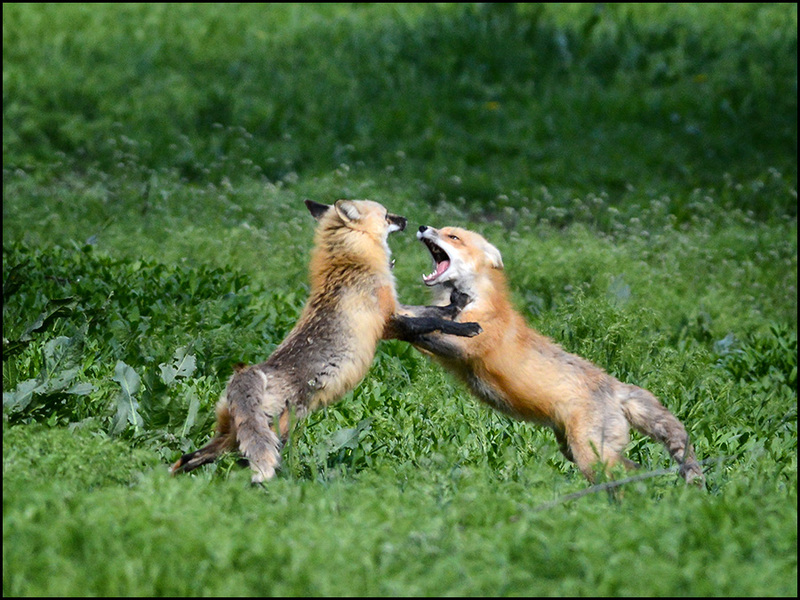 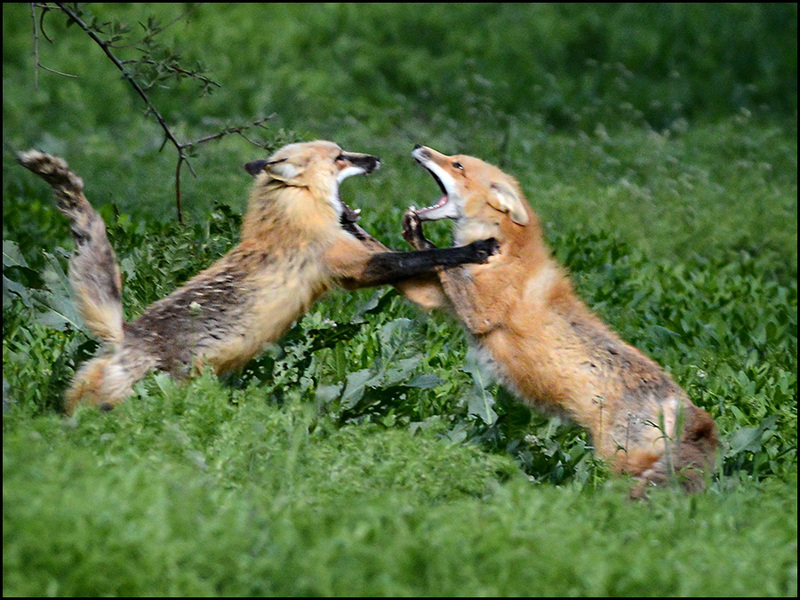 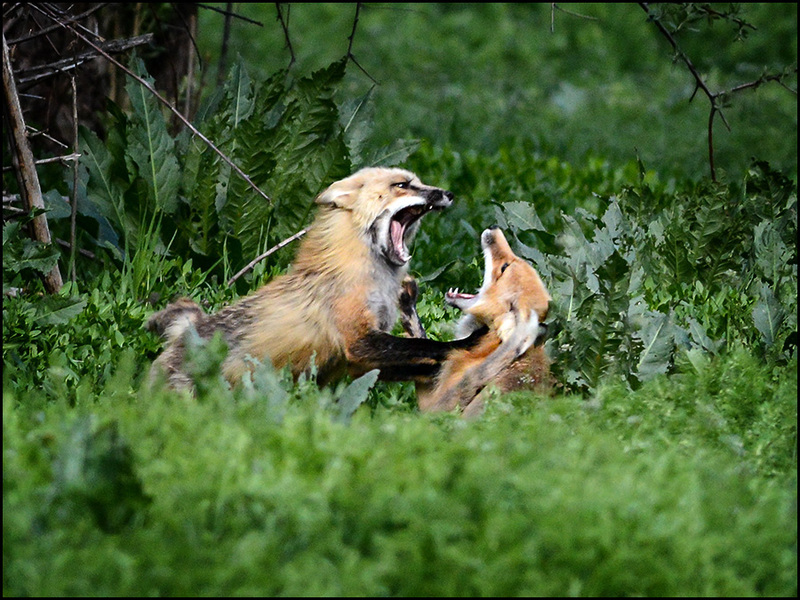 I often see foxes; but they are anti-climatic after photographing foxes at play. 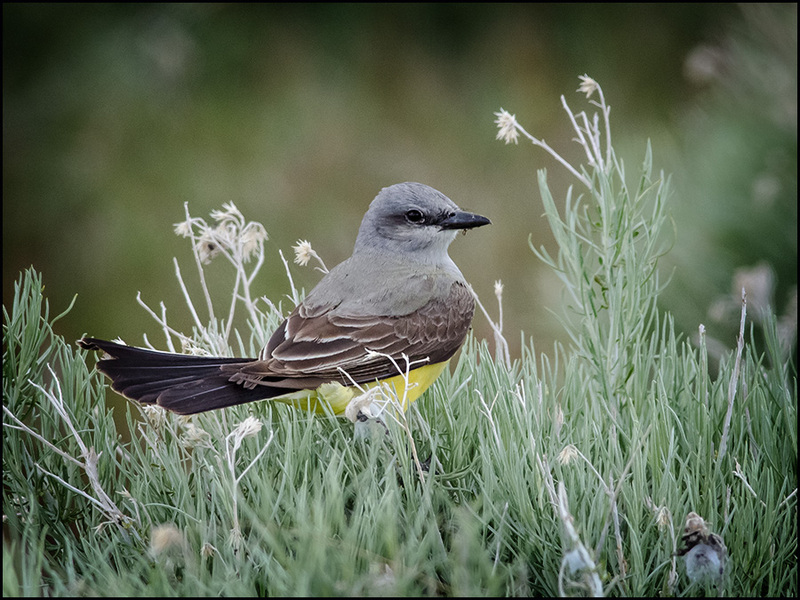 I'm just getting around to posting images taken on Monday at Antelope Island, a day of mixed weather, including rain and wind! 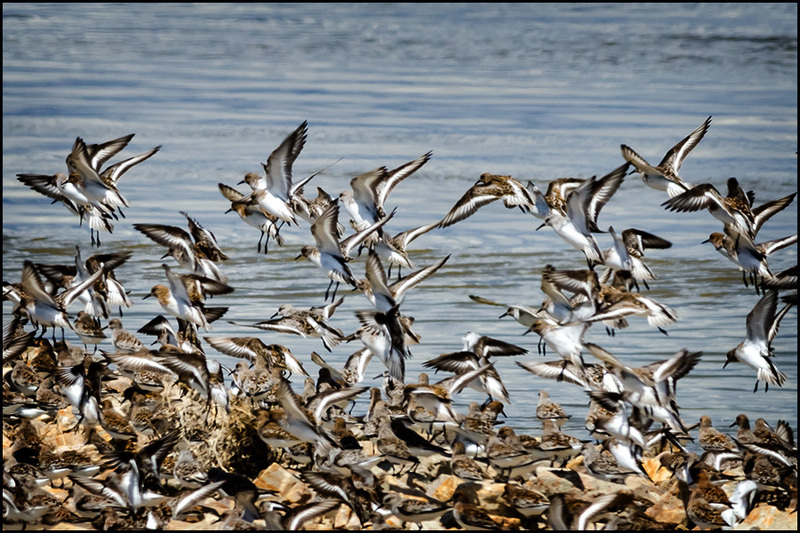 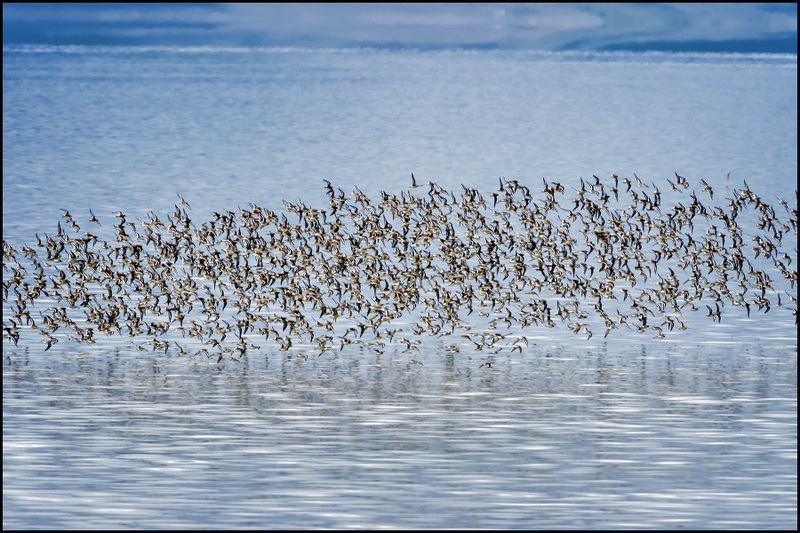 As is typical at this time of year the Causeway is loaded with birds, the largest number were Sanderlings mixed with other 'peeps'. 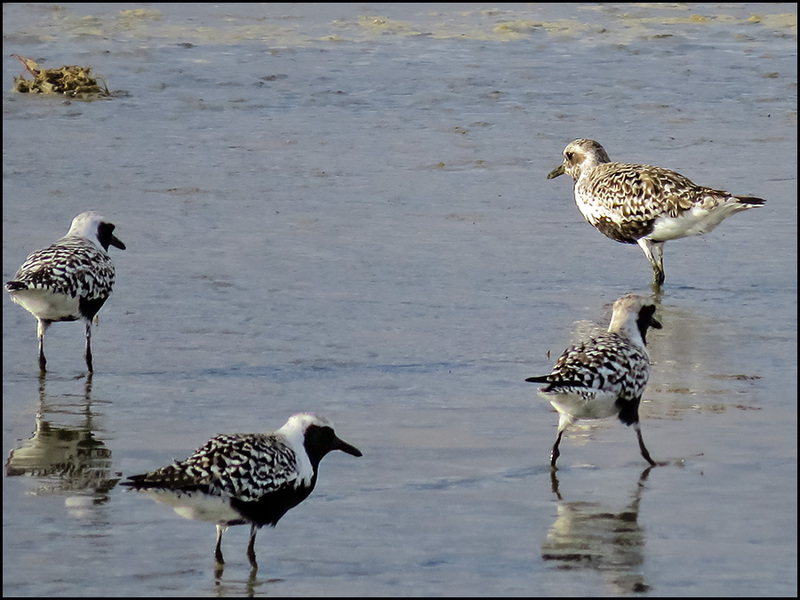 Here, they landed among thousands of other birds (on the jetty.. AIC). 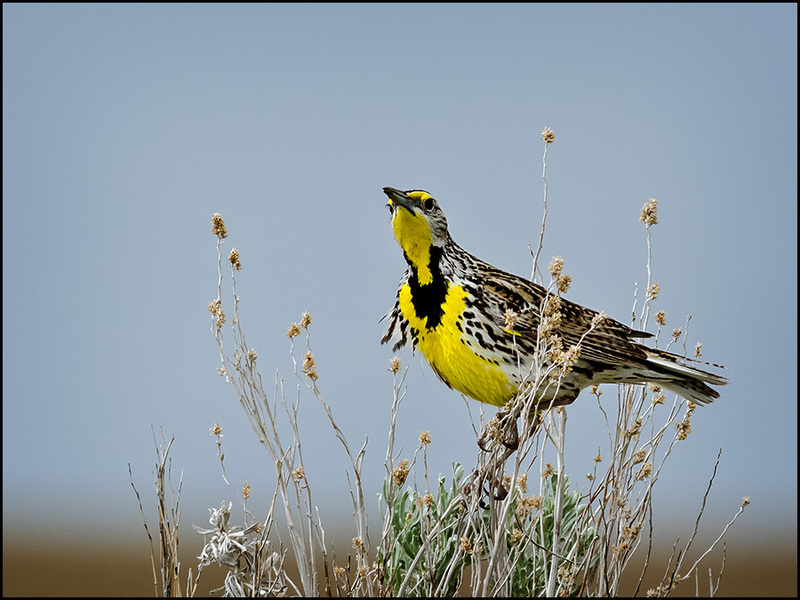 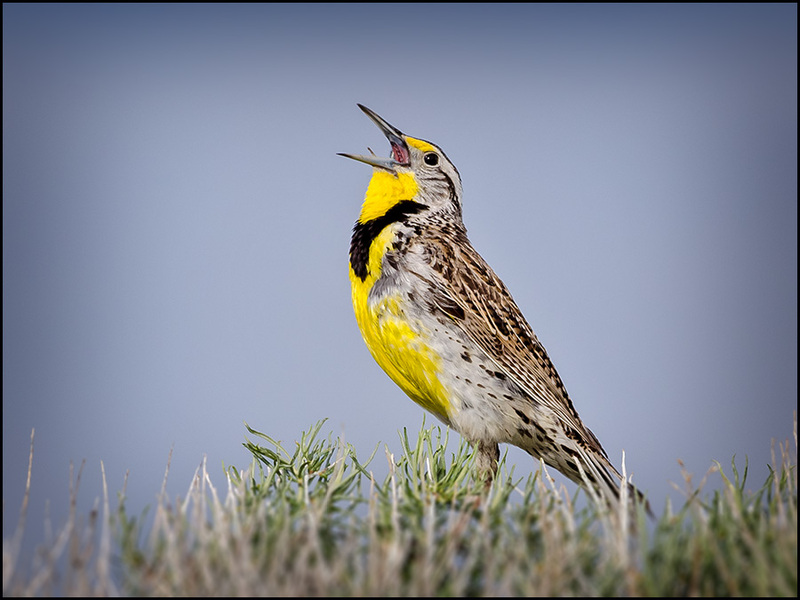 But I begin with upland birds first...Western Meadowlark. 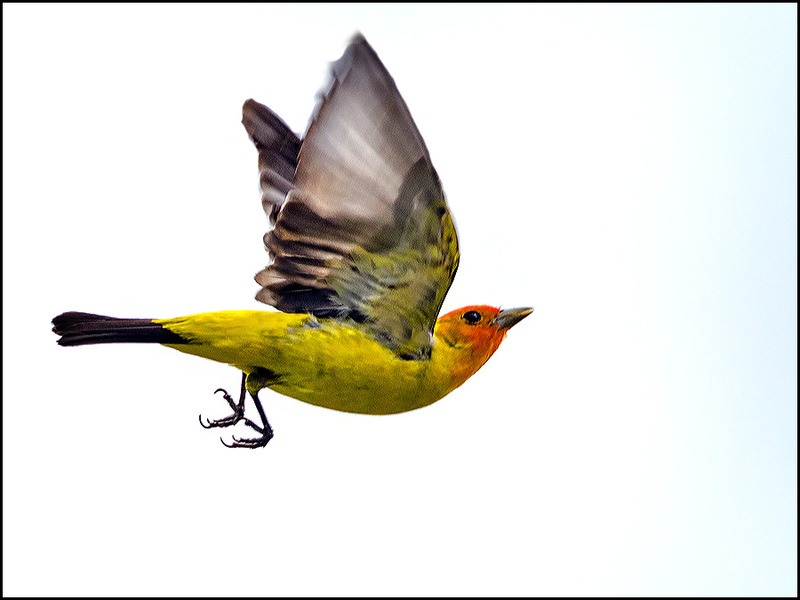 In flight... 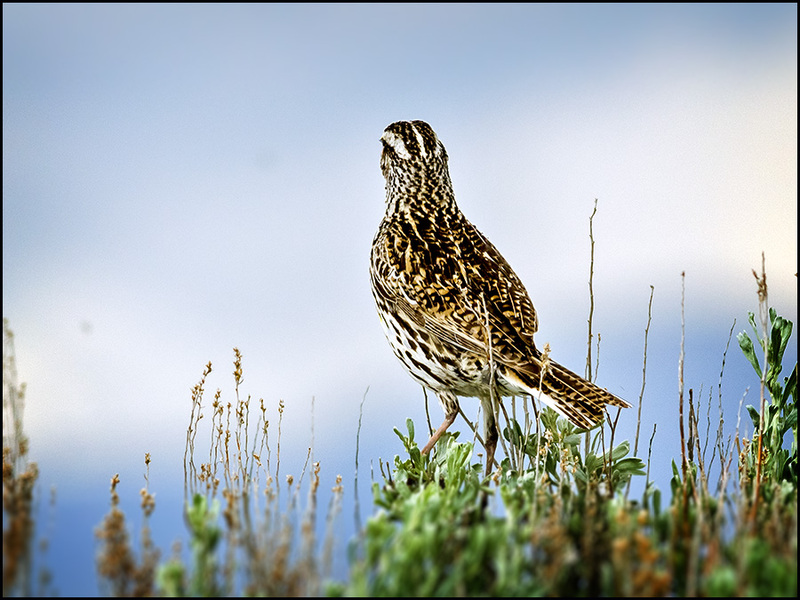 The hills were alive with active Meadowlarks everywhere! 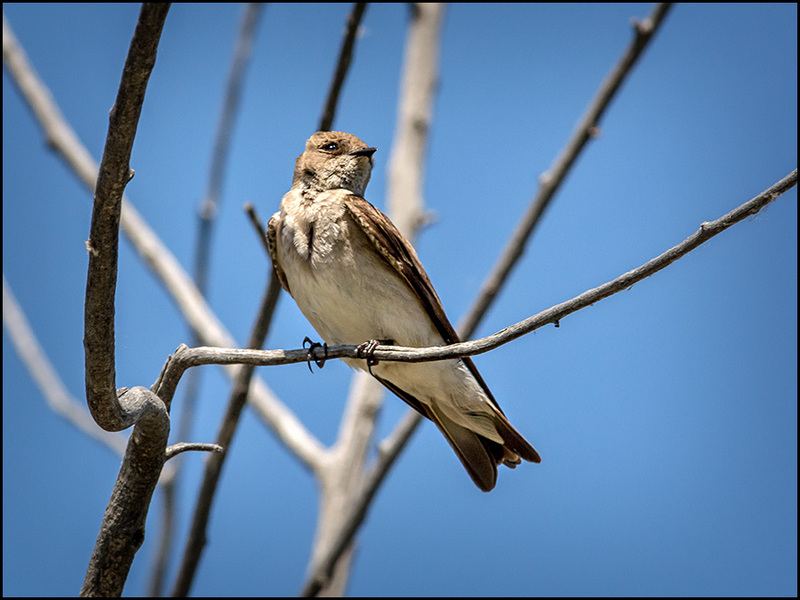 This one was facing away from the wind, with its feathers being rumpled. 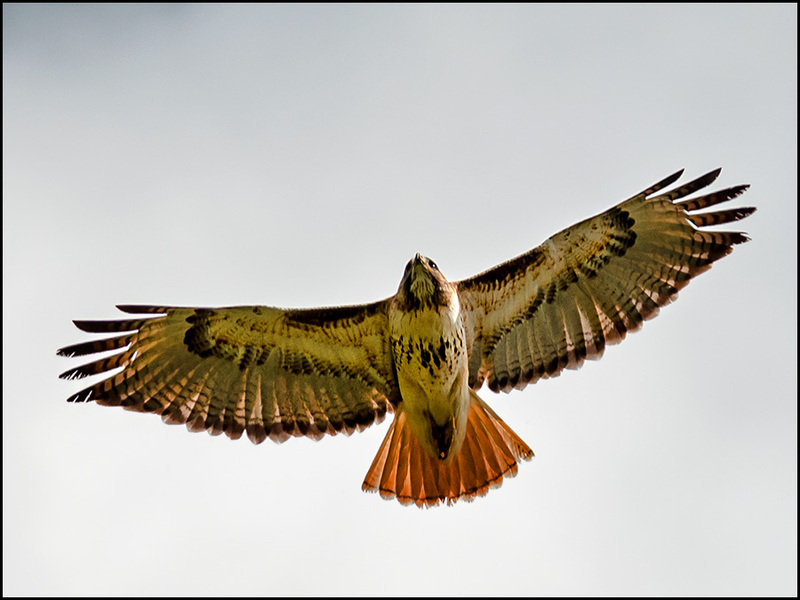 The same bird facing into the wind, showing its feather patterns from another angle. 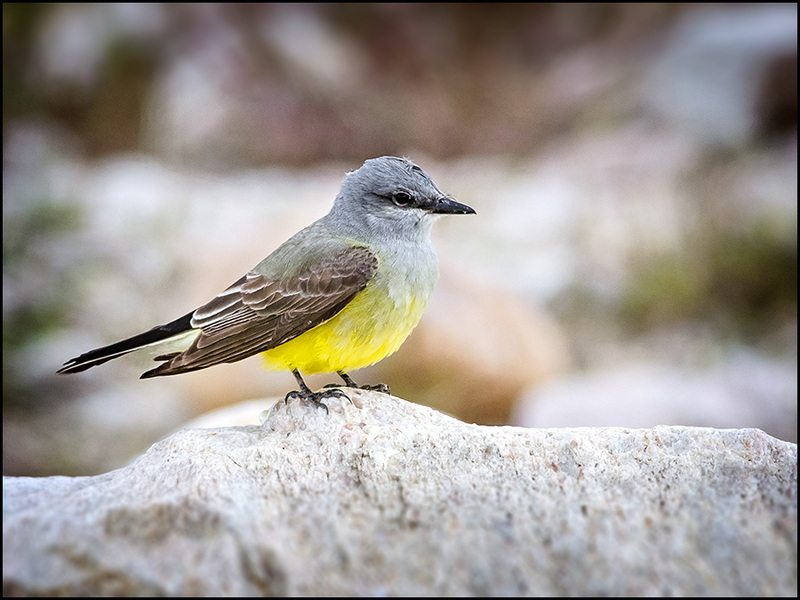 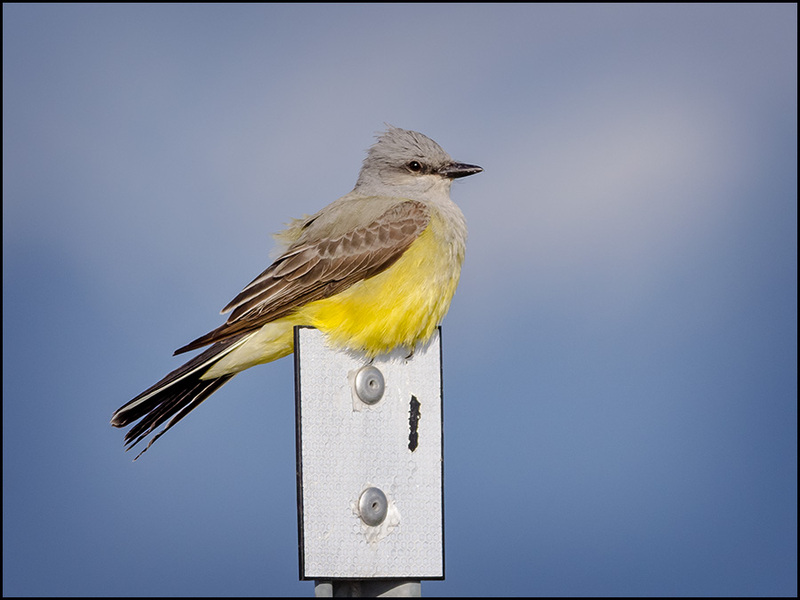 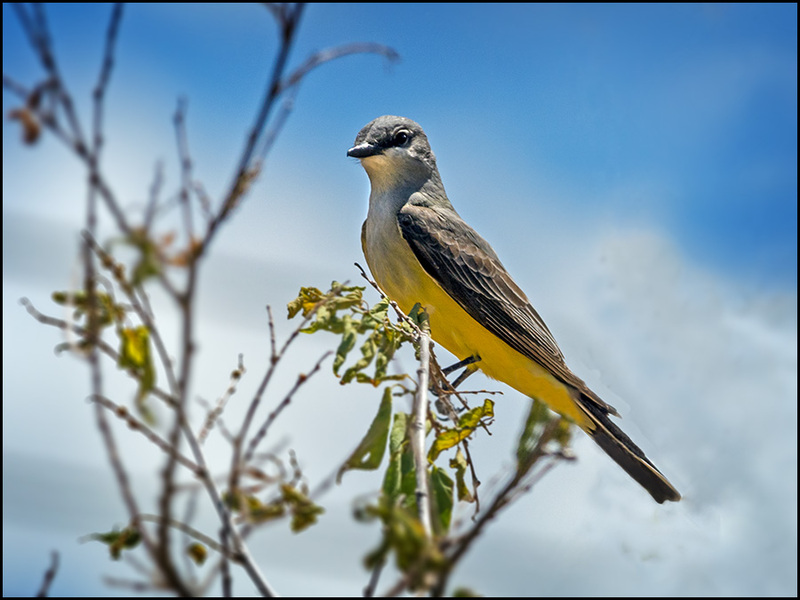 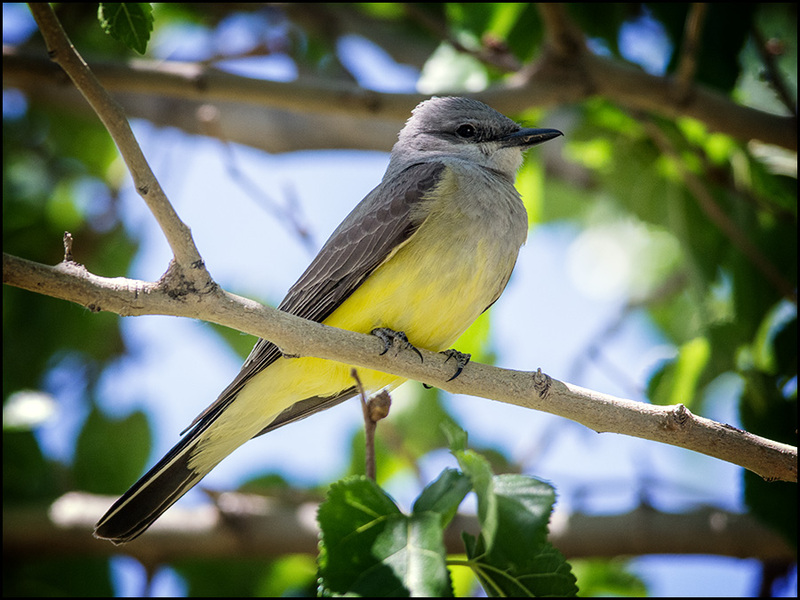 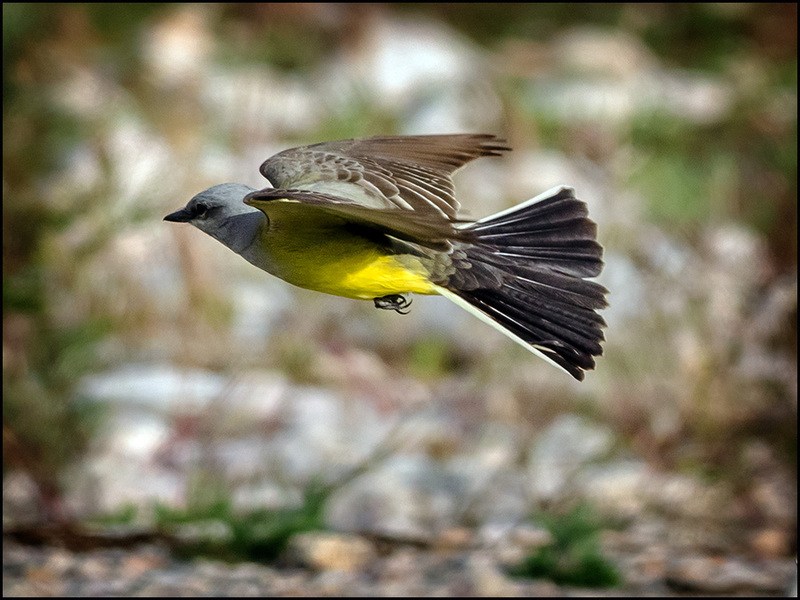 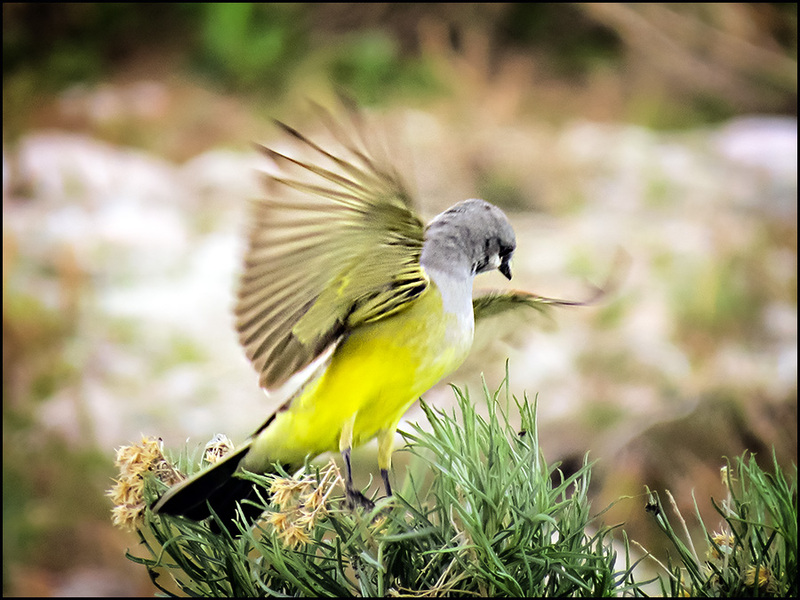 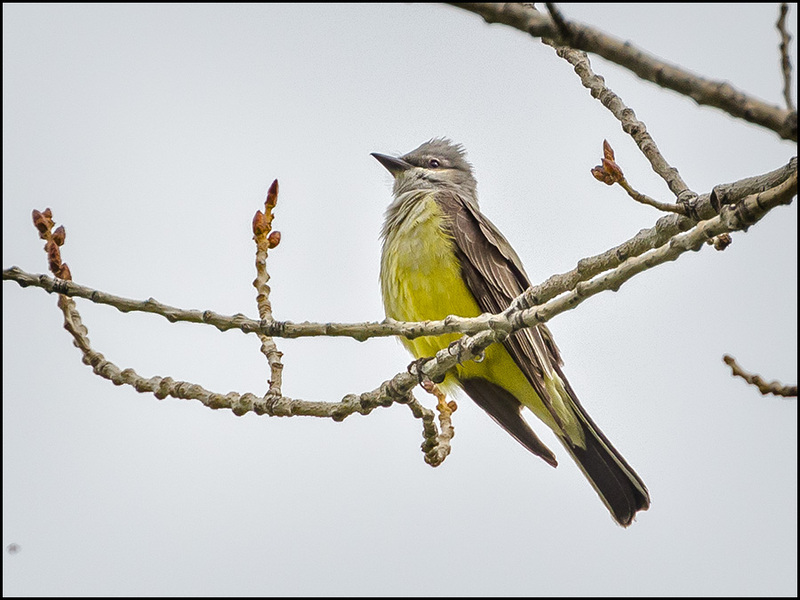 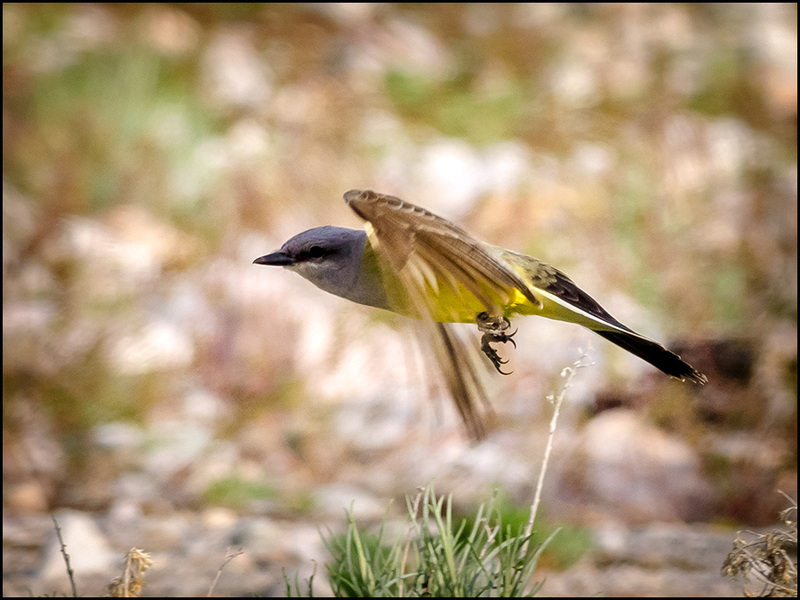 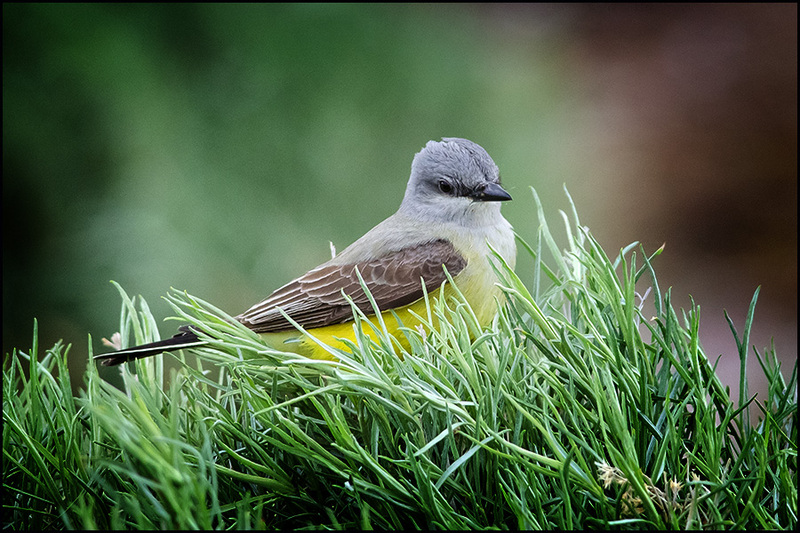 It was at a time when Western Kingbirds were ganged up in large numbers, especially along the Causeway! 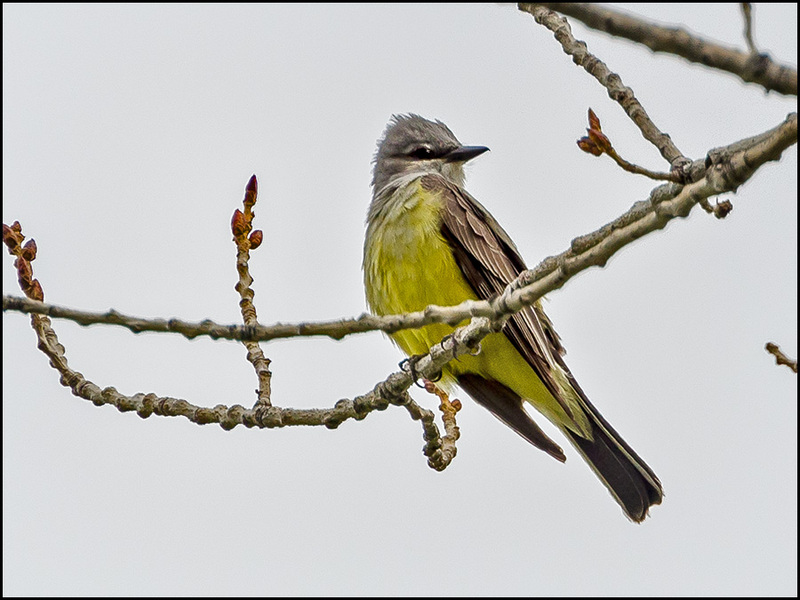 I'll come back to the Western Kingbirds a bit later. 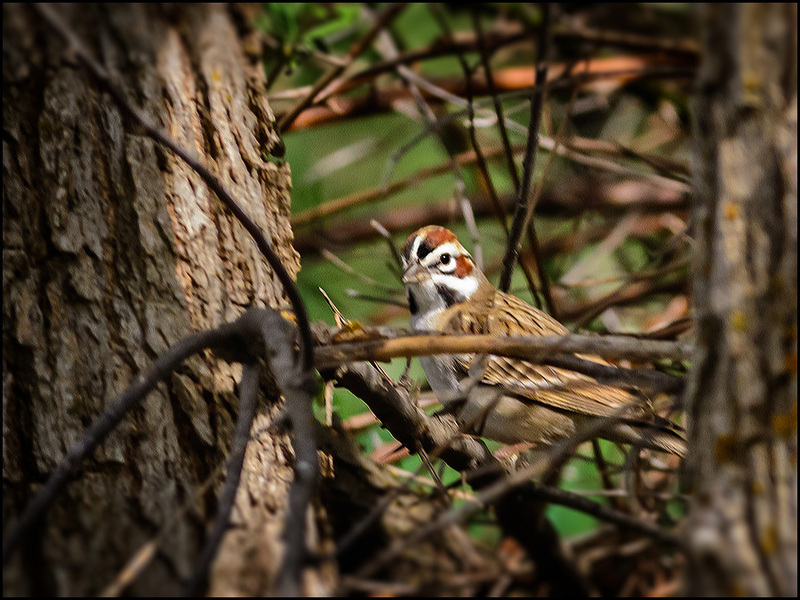 Lark Sparrows were everywhere... along with flying insects! 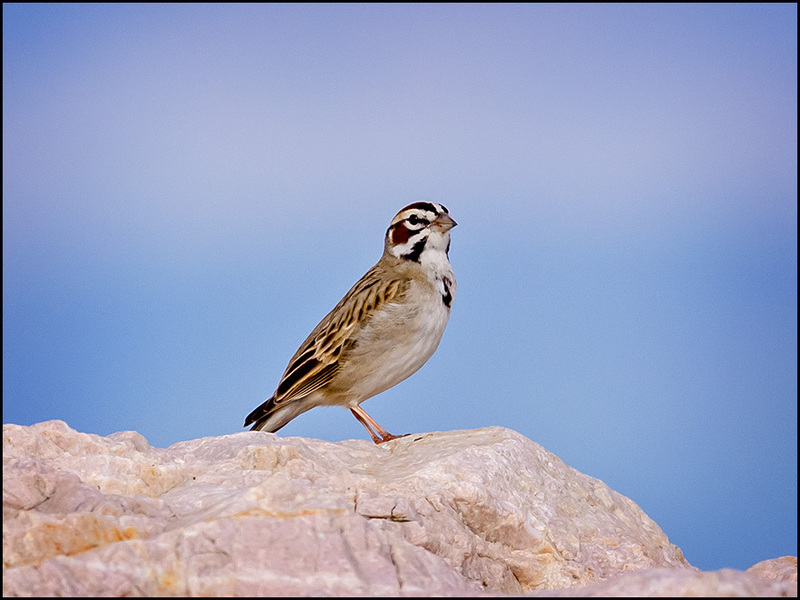 A closeup of a Lark Sparrow, showing its unique facial pattern. 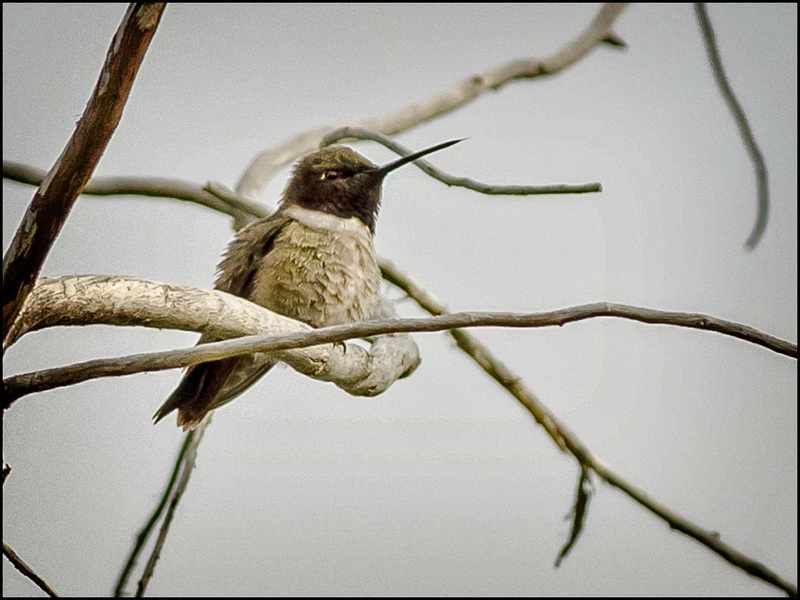 And one using a miniscule Canon point-shoot, the Canon SX50, costing less than $350. 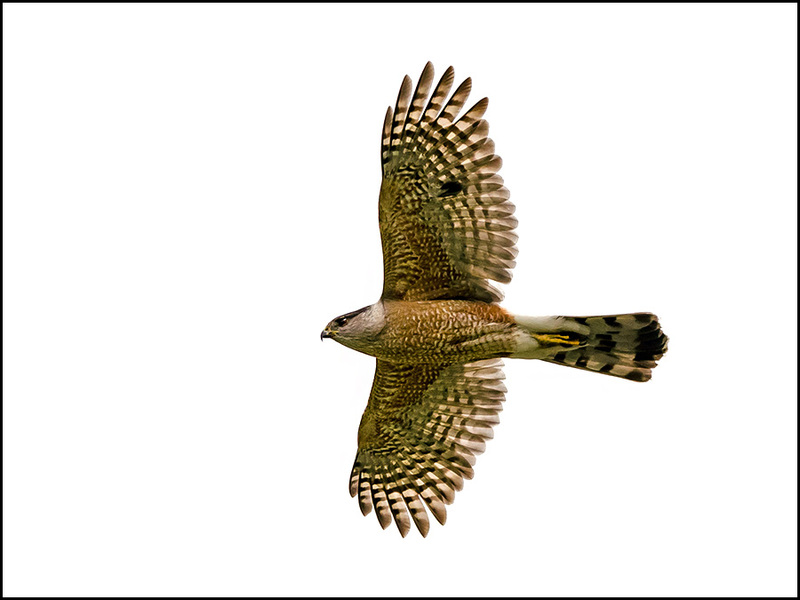 I always come away impressed when comparing the 2 systems! 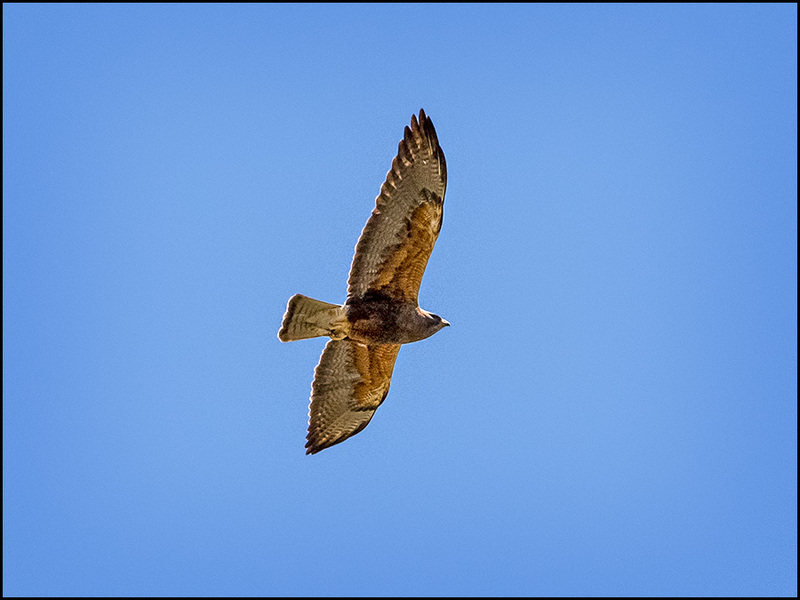 Finally, among the upland birds, I located this adult Swainson's Hawk. 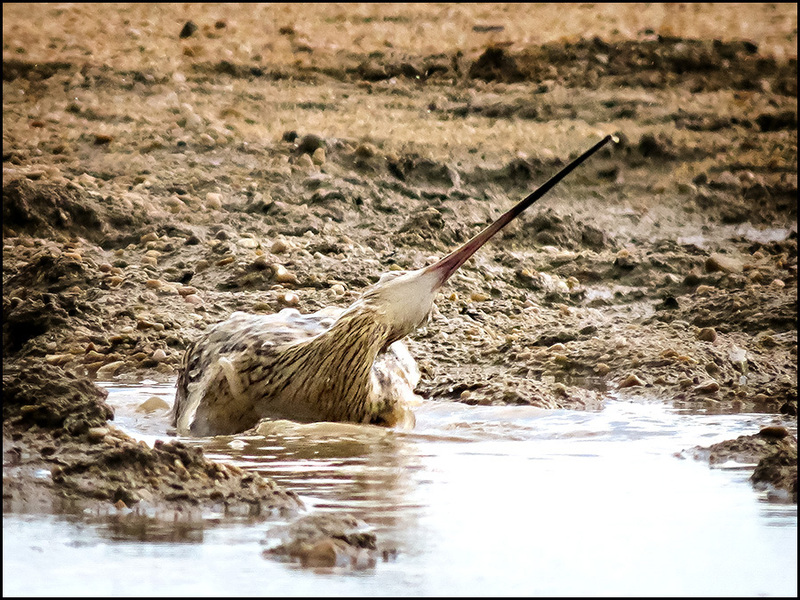 have a bath! 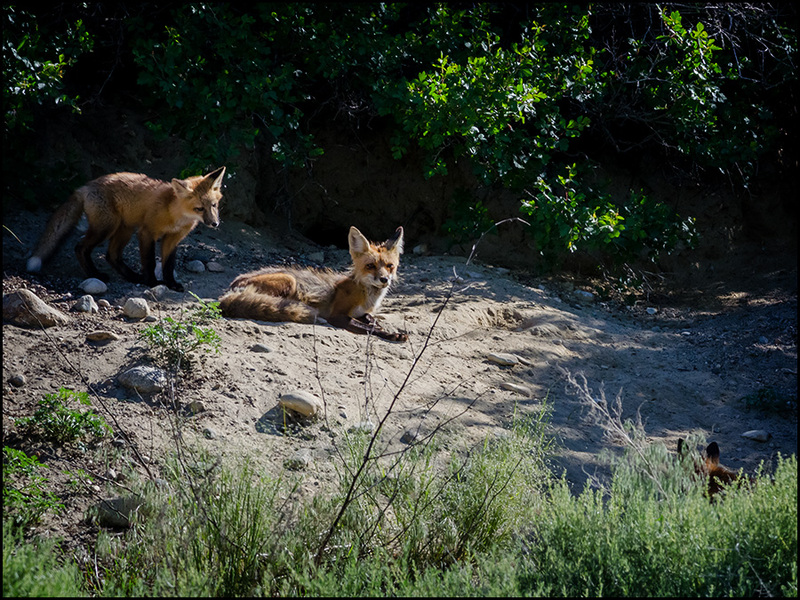 (This series was taken exclusively with the SX50). 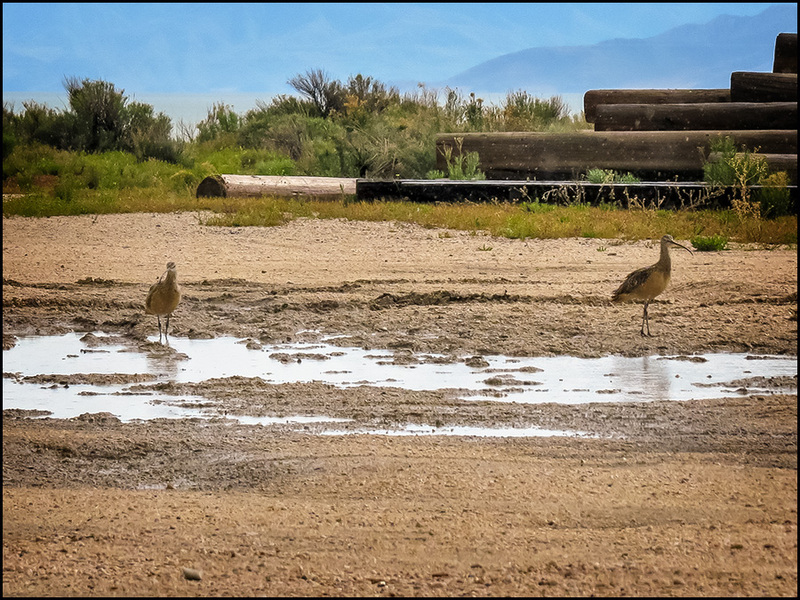 Finding fresh water for a bath is difficult around Great Salt Lake! 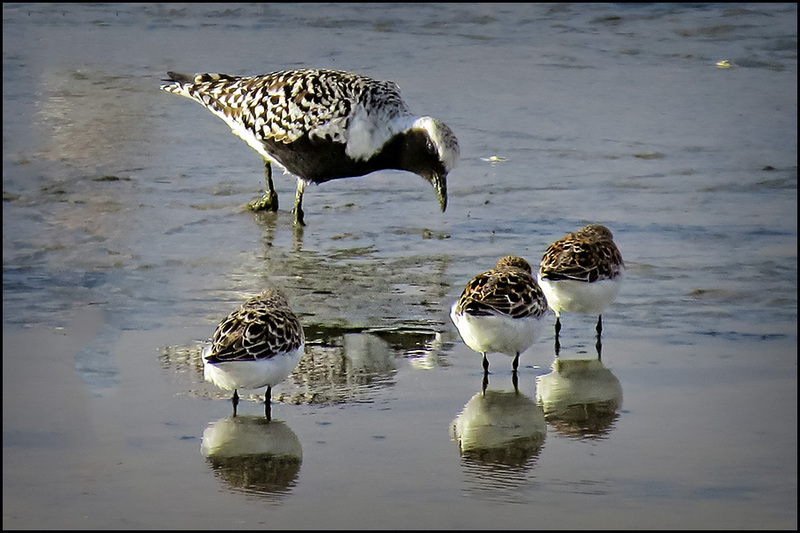 Concentrating on shorebirds was difficult since they were a great distance away. 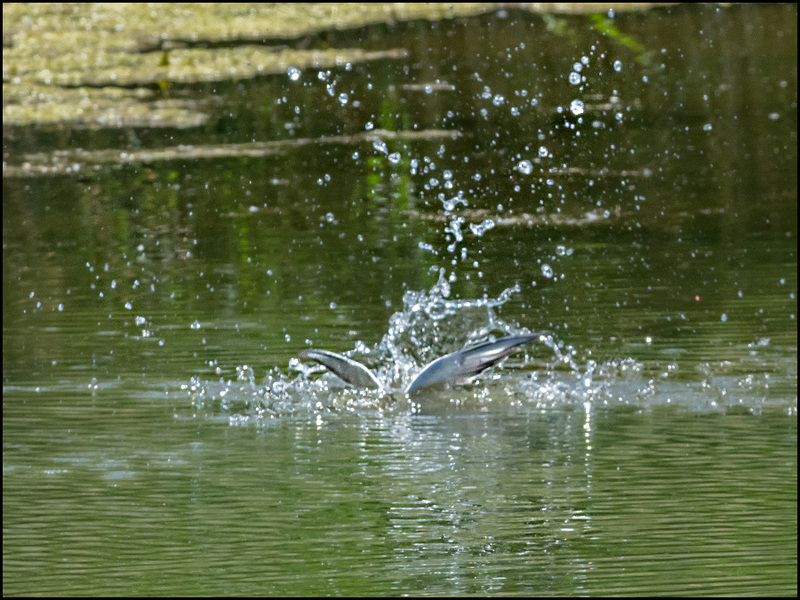 The Nikon system wasn't 'up to it'! 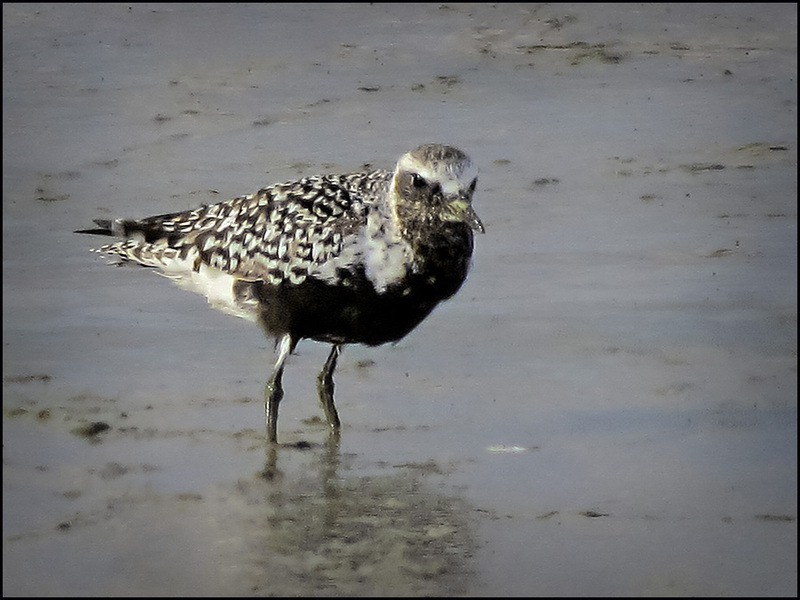 Closeup of a Black-bellied Plover. 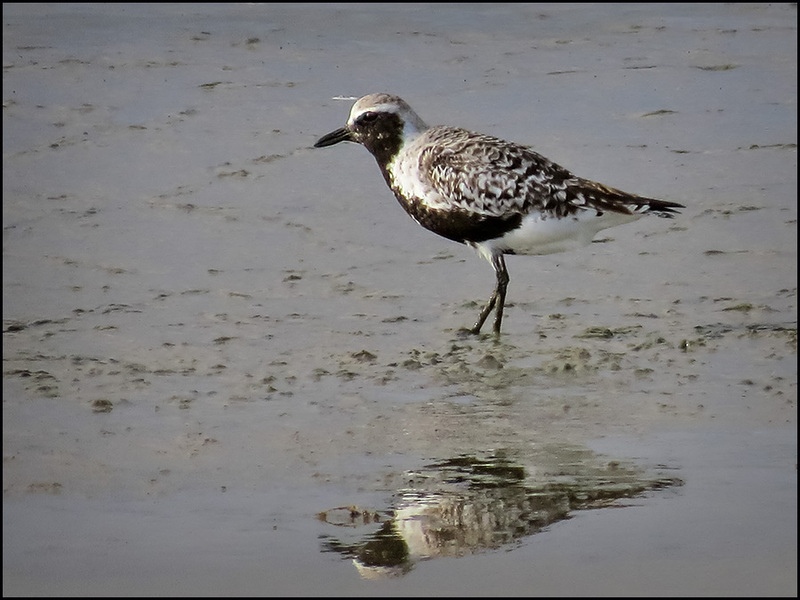 You'd be amazed to see the distance this Plover was from my camera! 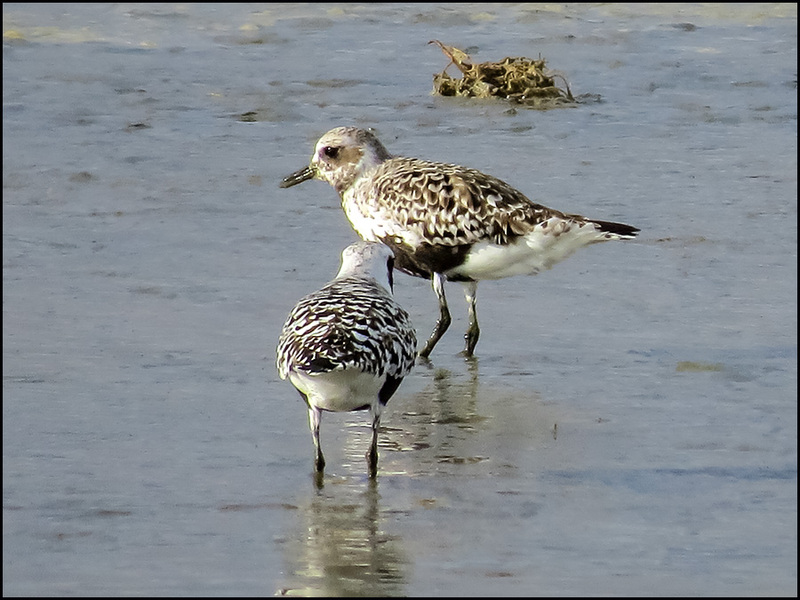 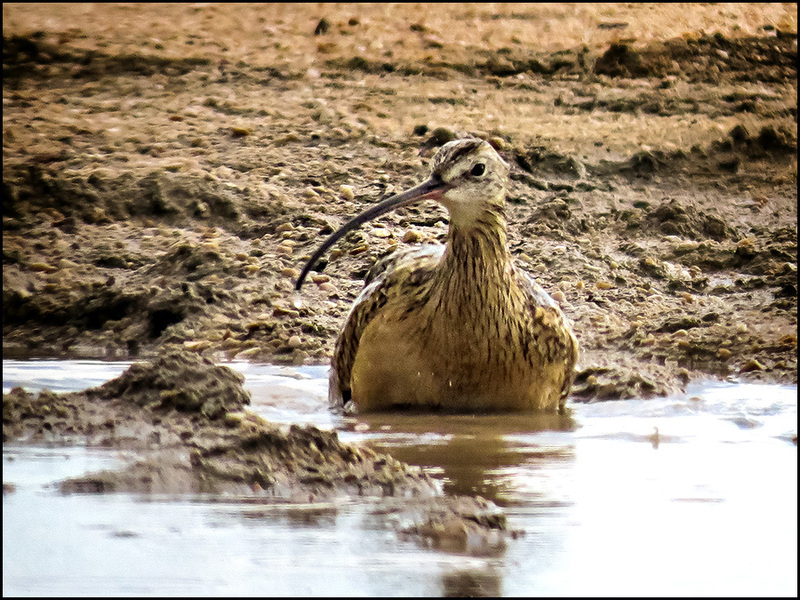 When we see these birds again in the autumn, they will be in 'non-breeding plumage'... a generic look, indeed! 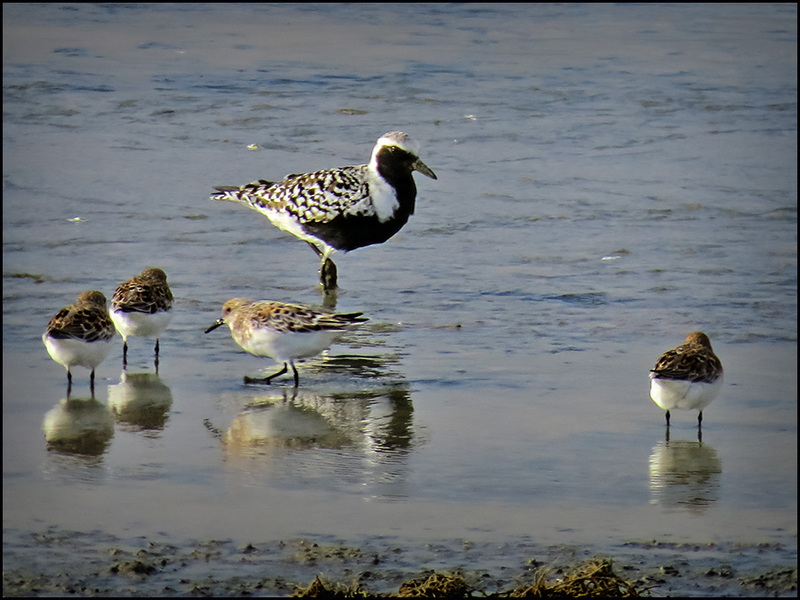 Camera buffs... notice the great depth of field the SX provides, getting both the Plover and Sanderlings in sharp focus!!! 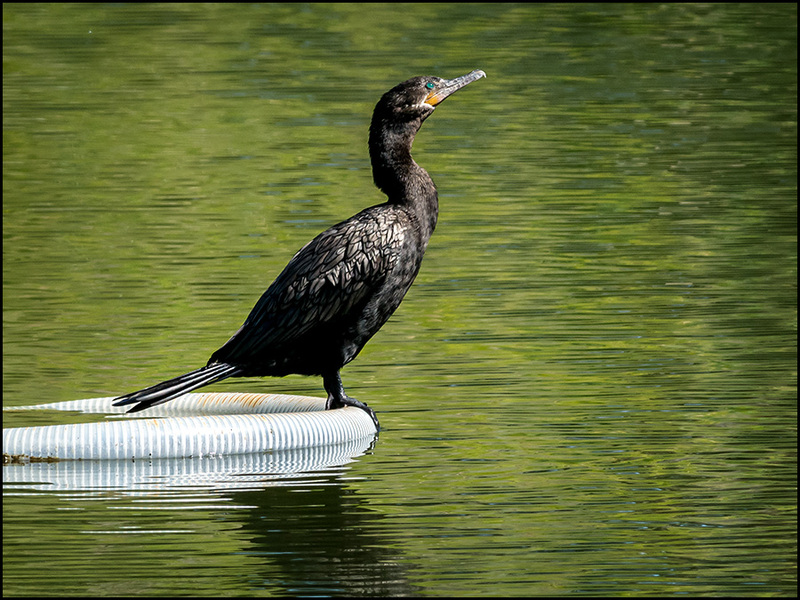 I must emphasize, the SX camera is amazing but requires some study to achieve its greatest potential! 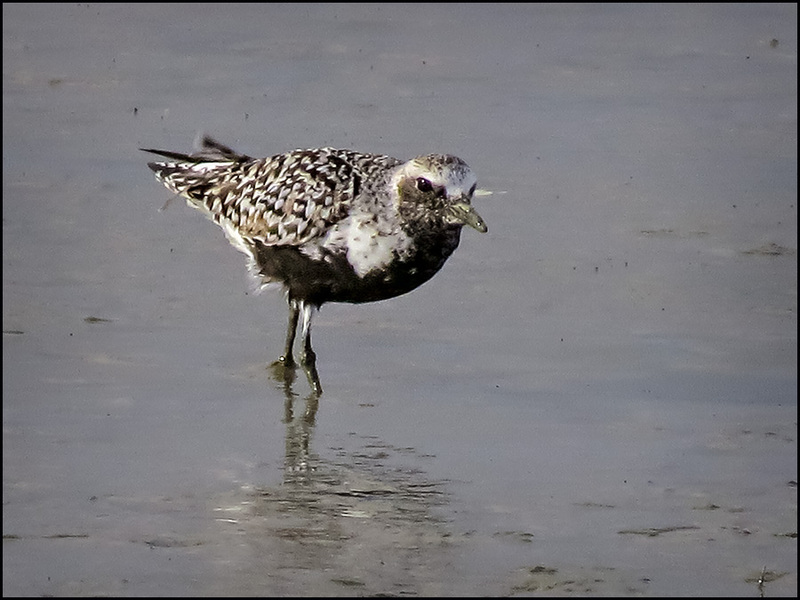 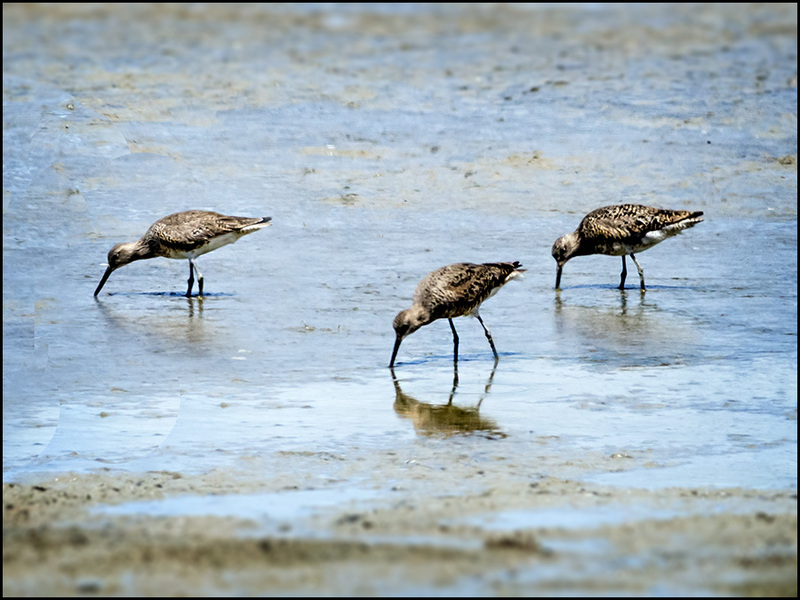 The last 3 images show a Black-bellied Plover in molt, looking different than the others. 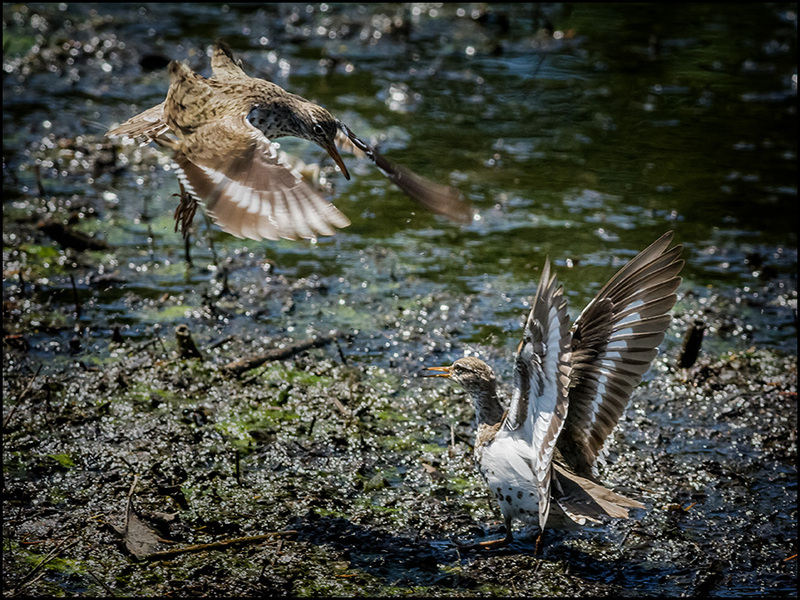 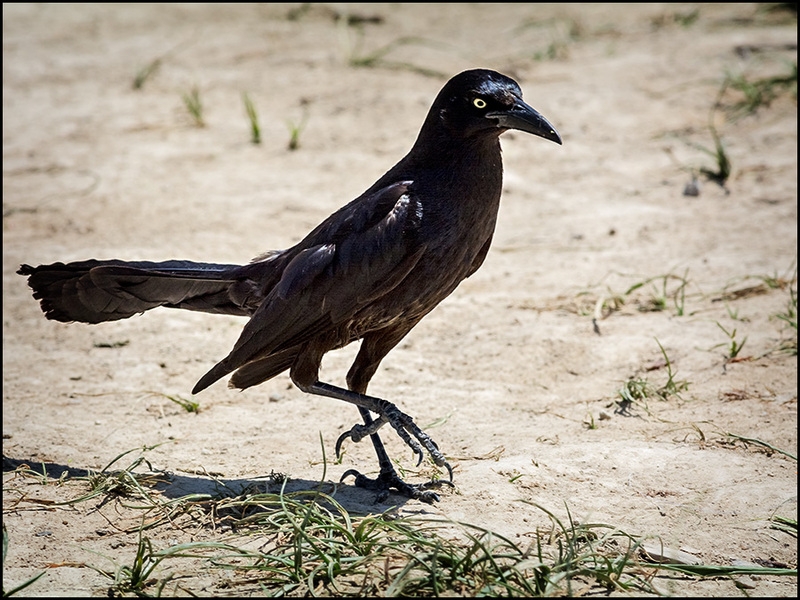 In direct sunlight, the molting bird stands out, compared to others in the frame. 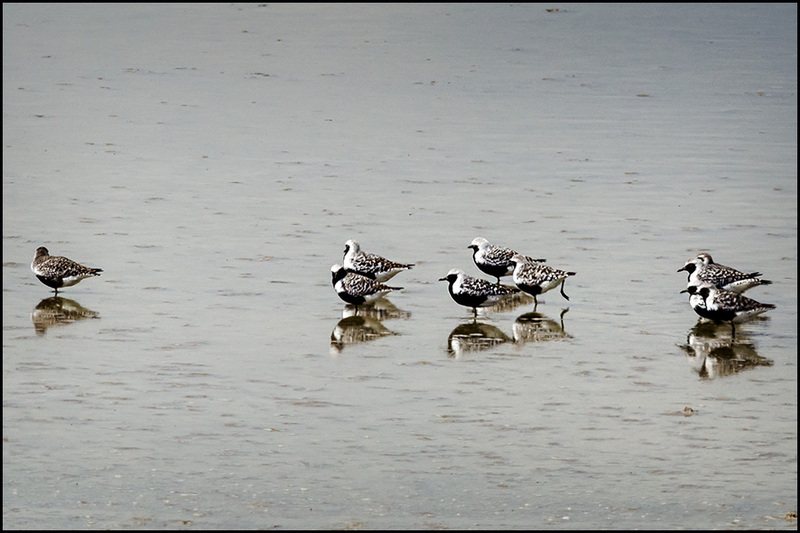 Other years I tried to capture images of these plovers with an expensive Nikon system... 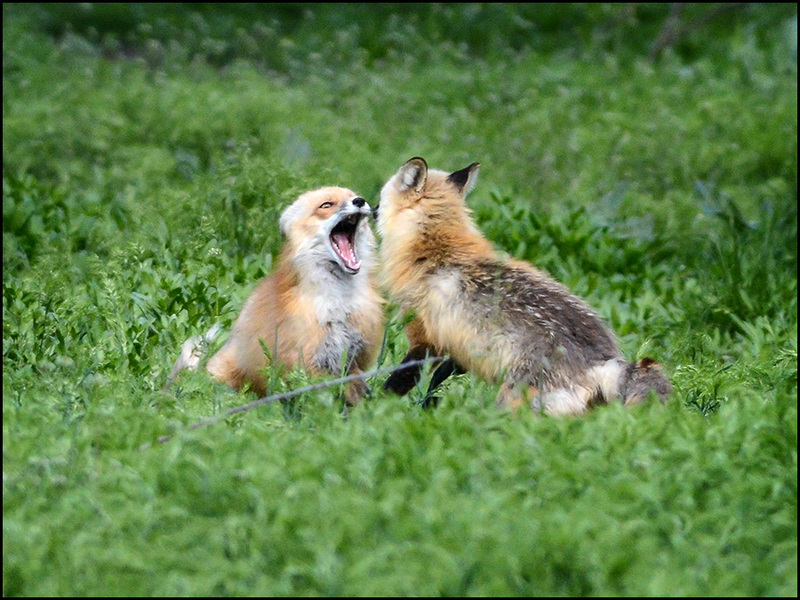 This time I succeeded with the Canon! 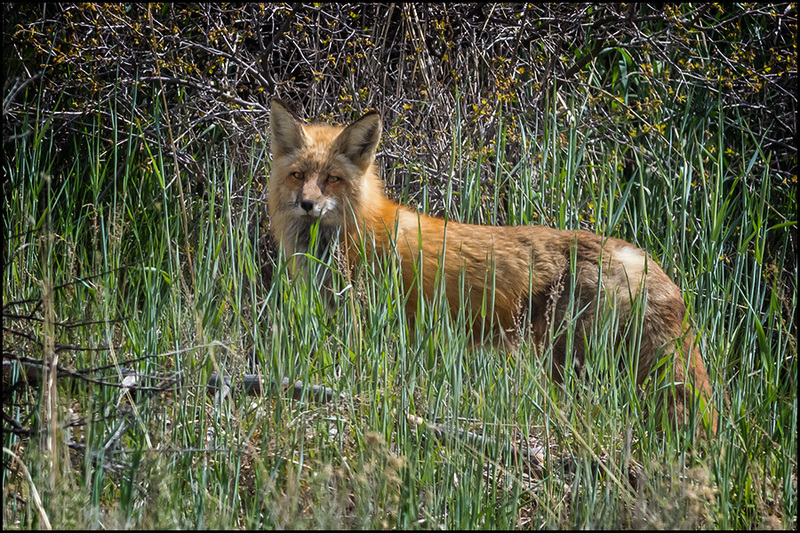 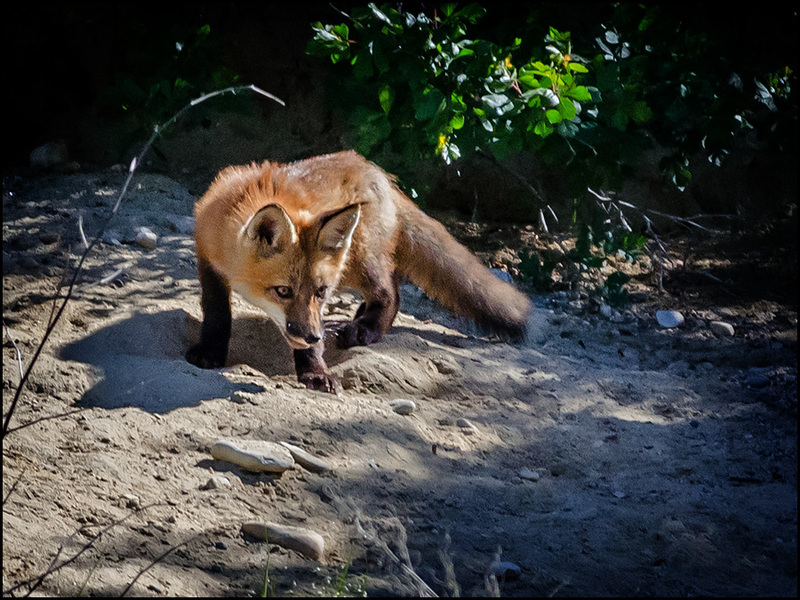 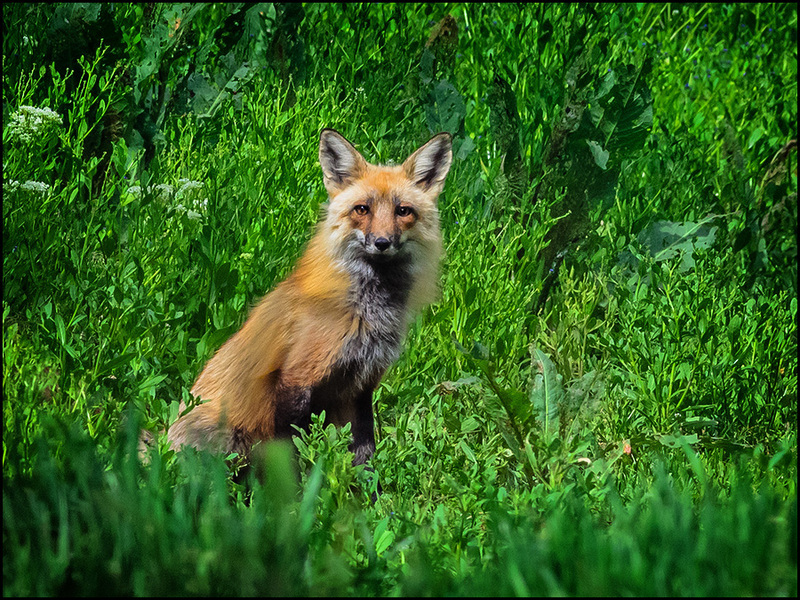 Big Cottonwood Park's bird population at present is dismal; but the FOX activity has been phenomenal! 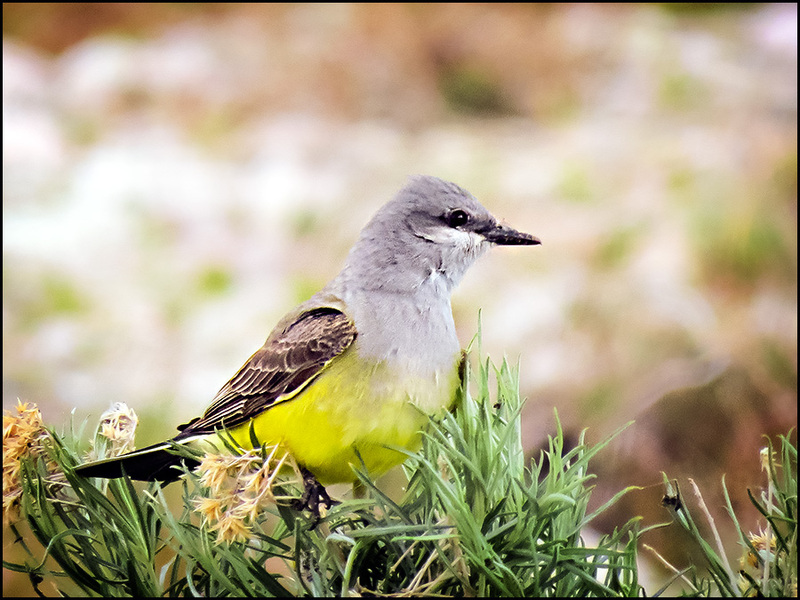 Looking forward to a jaunt to Antelope Island to see new and exciting birds reported there recently. 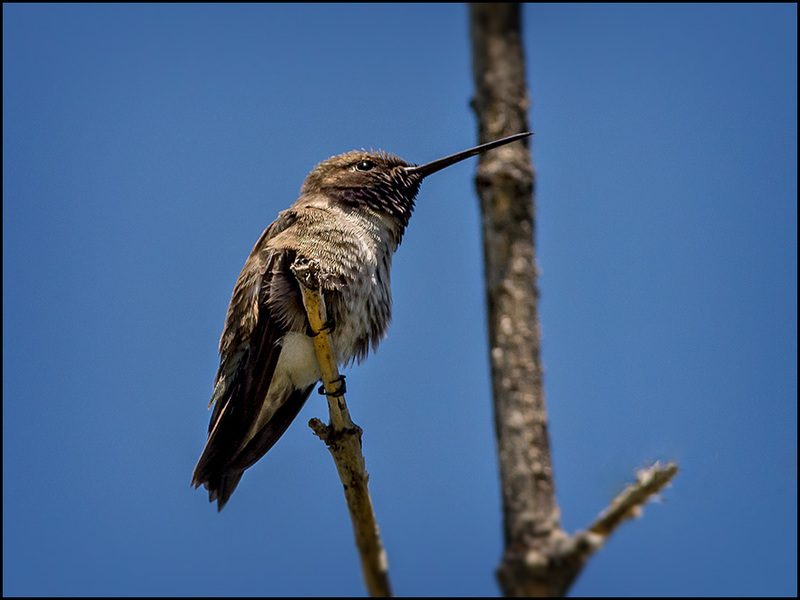 My most recent visit to Big Cottonwood Park yielded my FOY hummingbird, a Black-chinned. 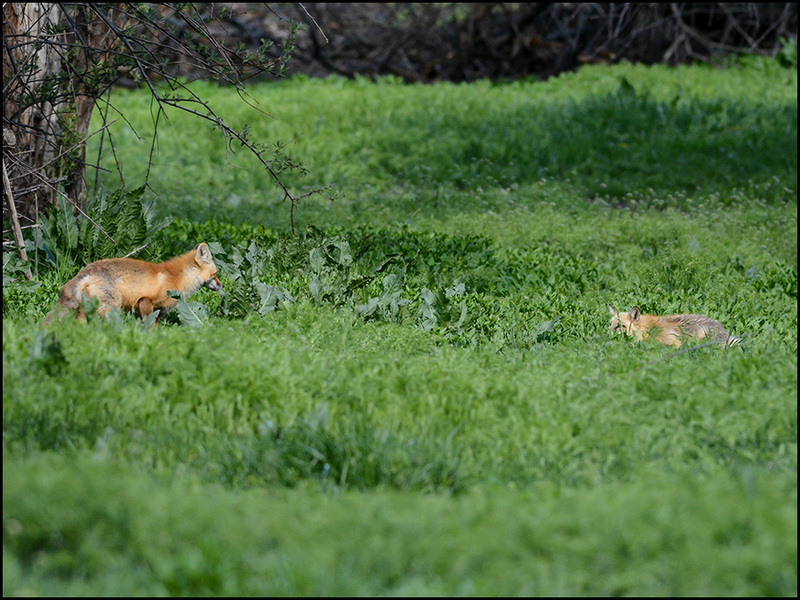 And a very young (kit) Fox... alone and camera shy. 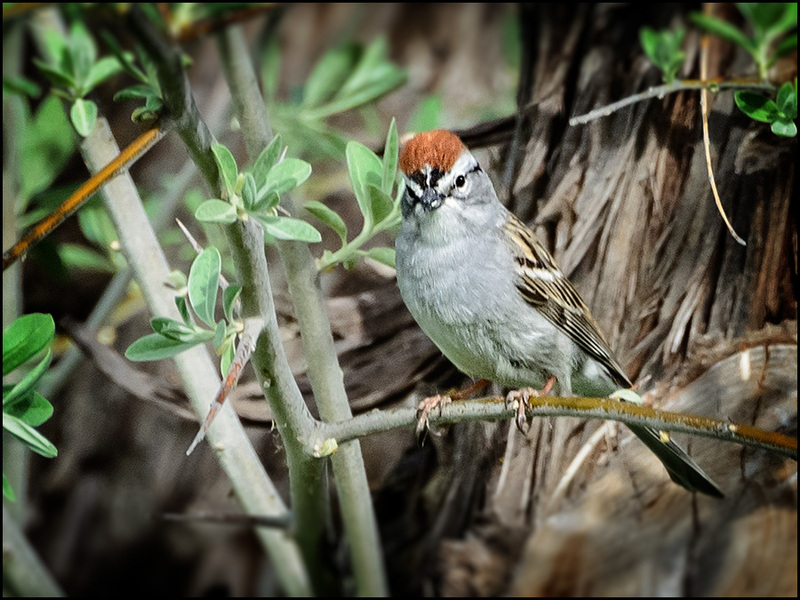 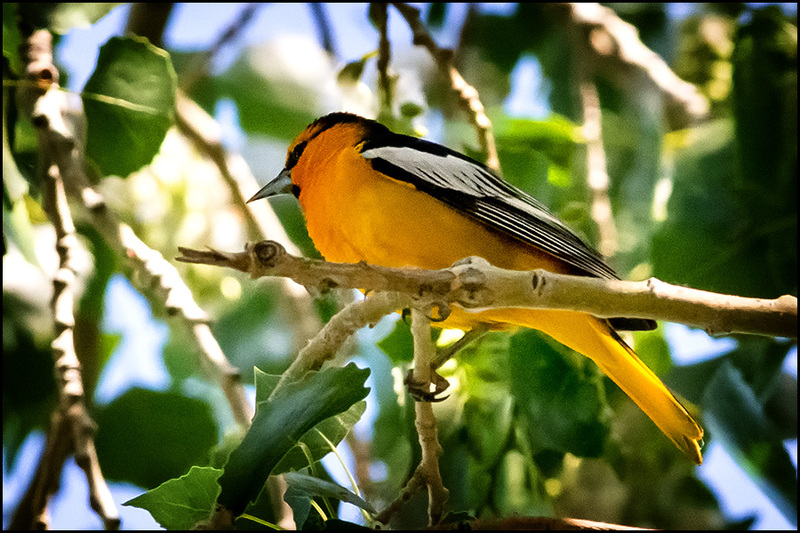 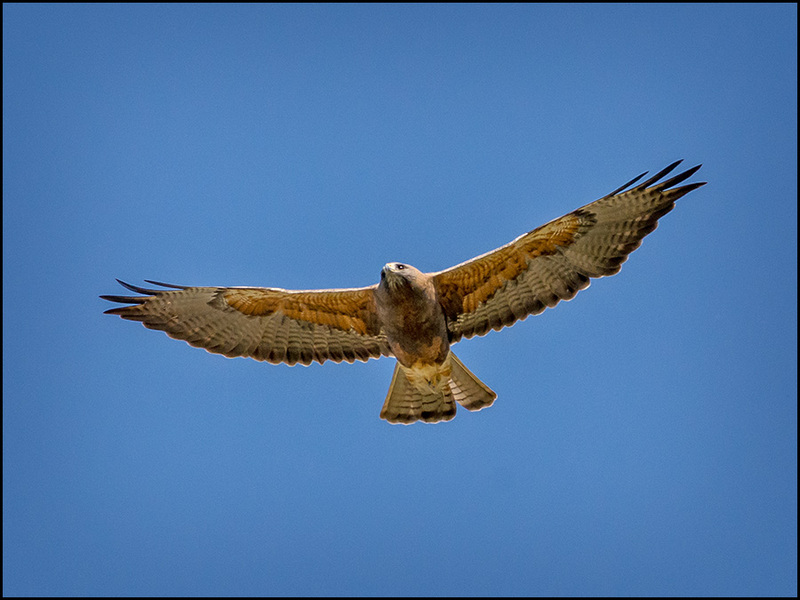 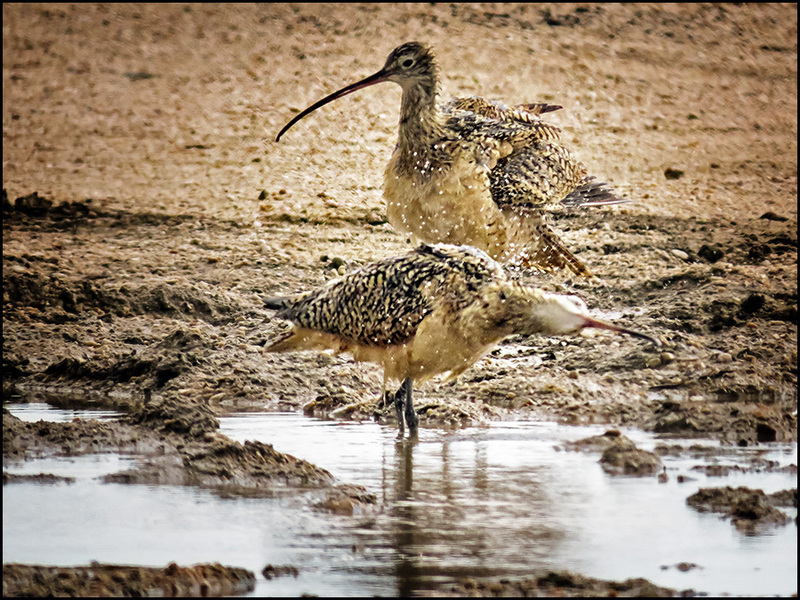 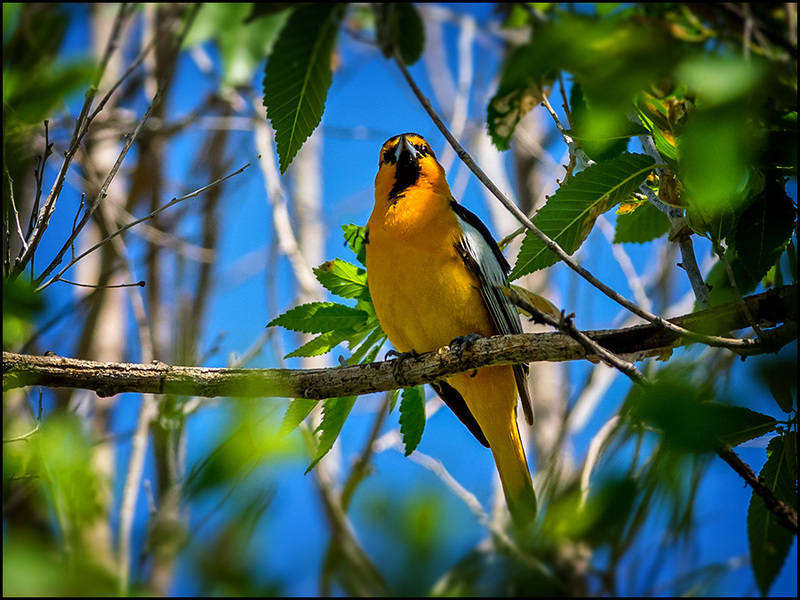 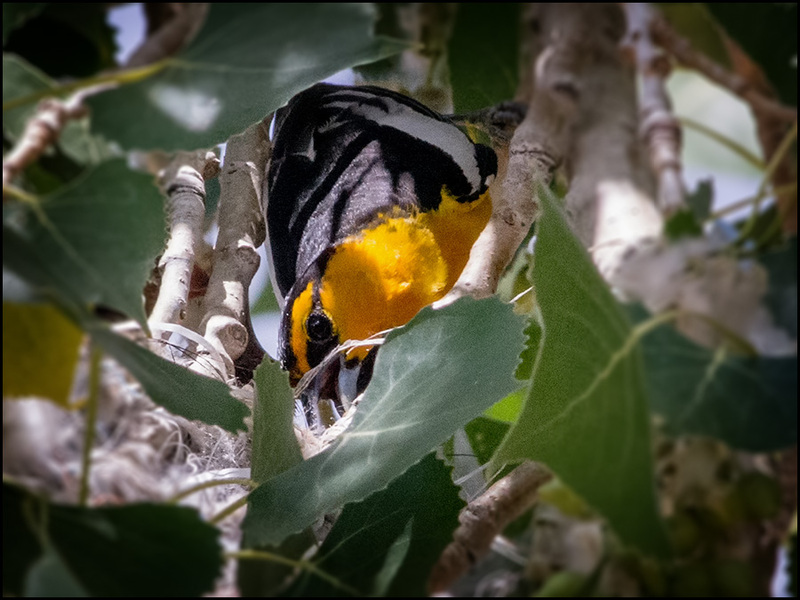 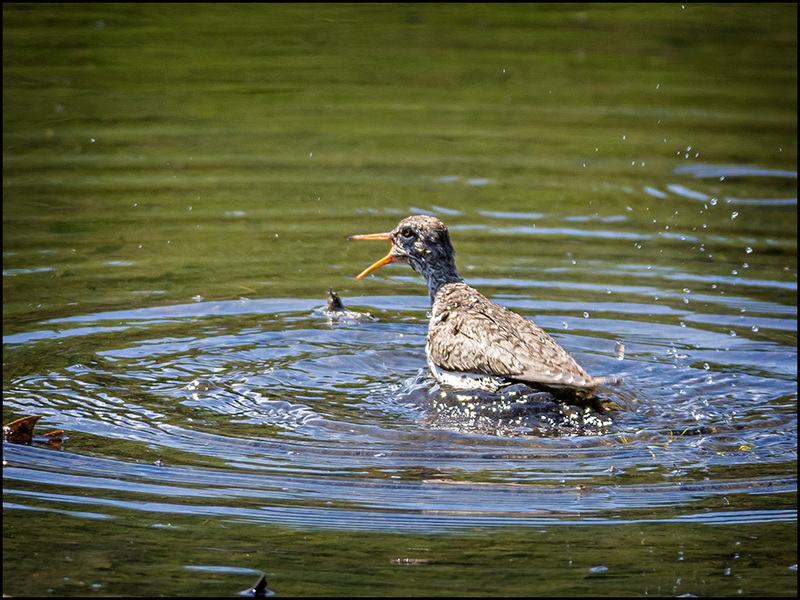 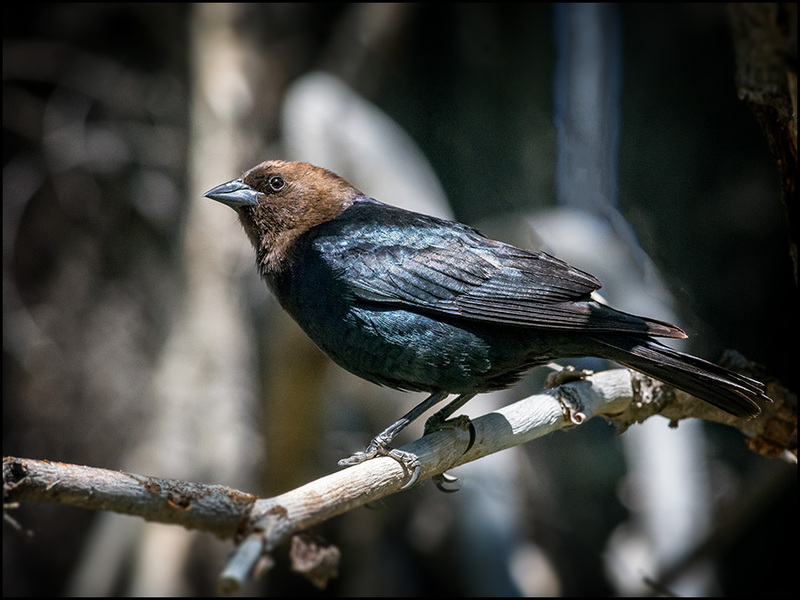 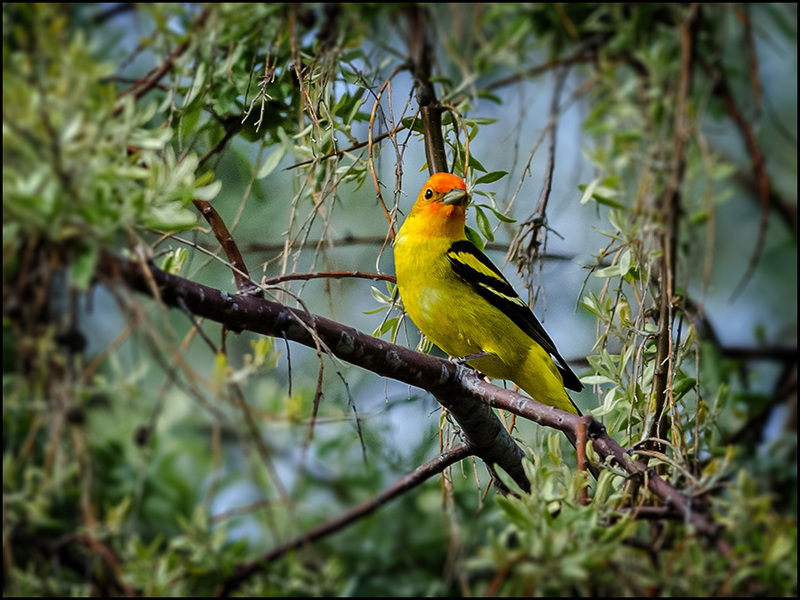 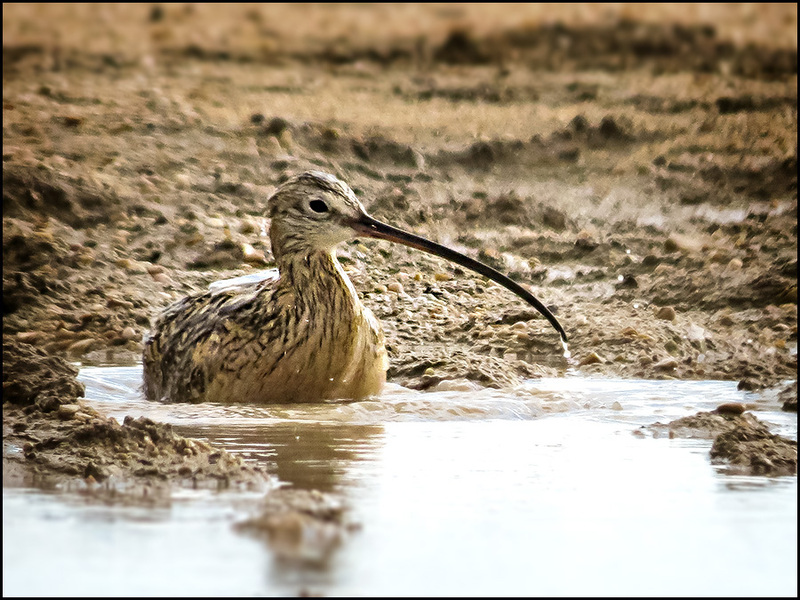 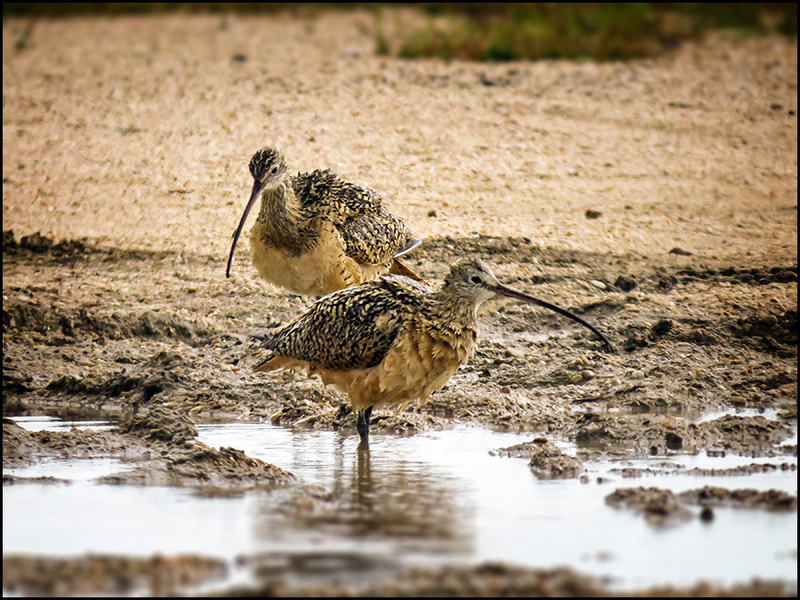 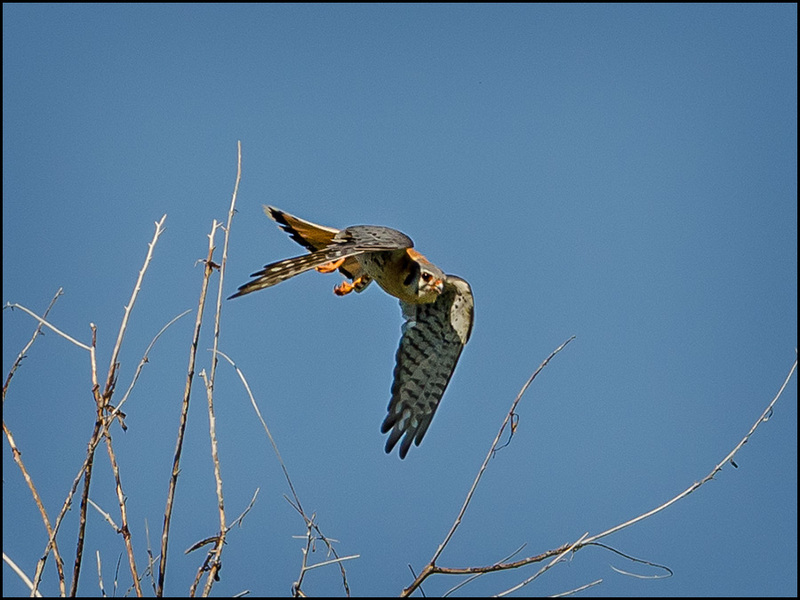 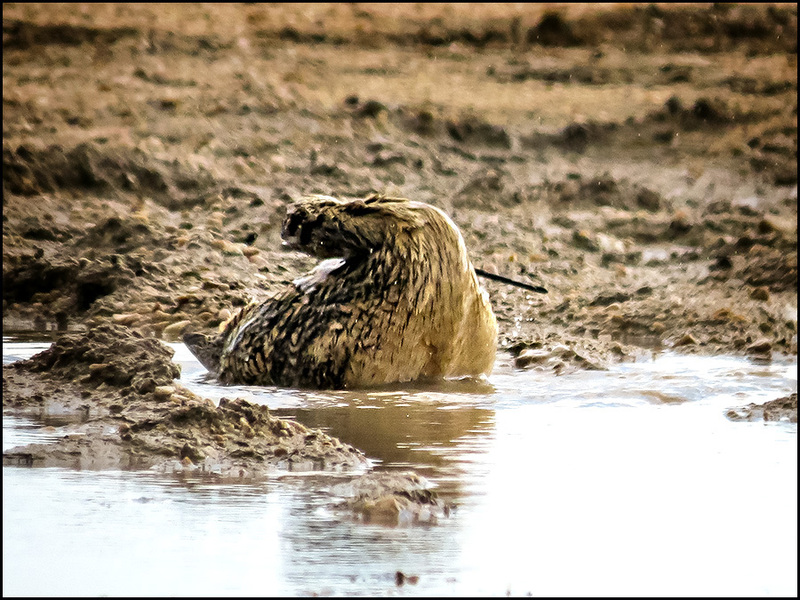 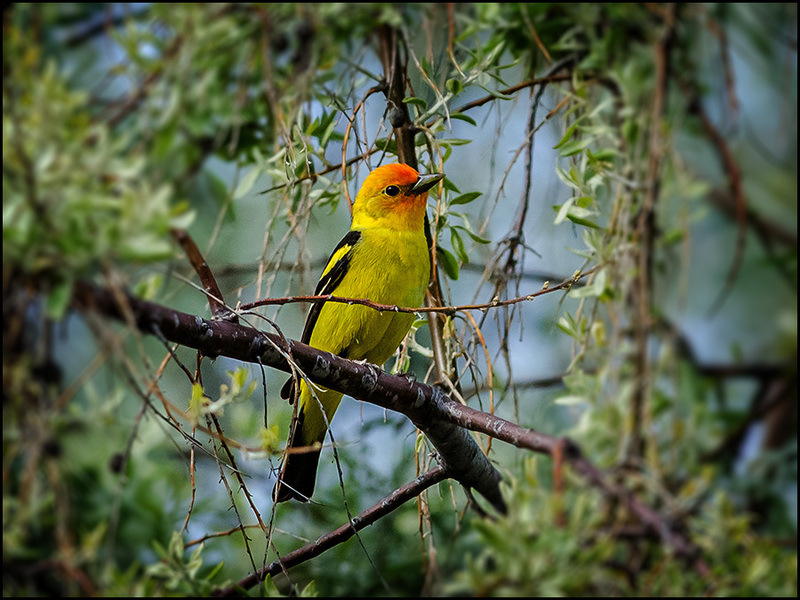 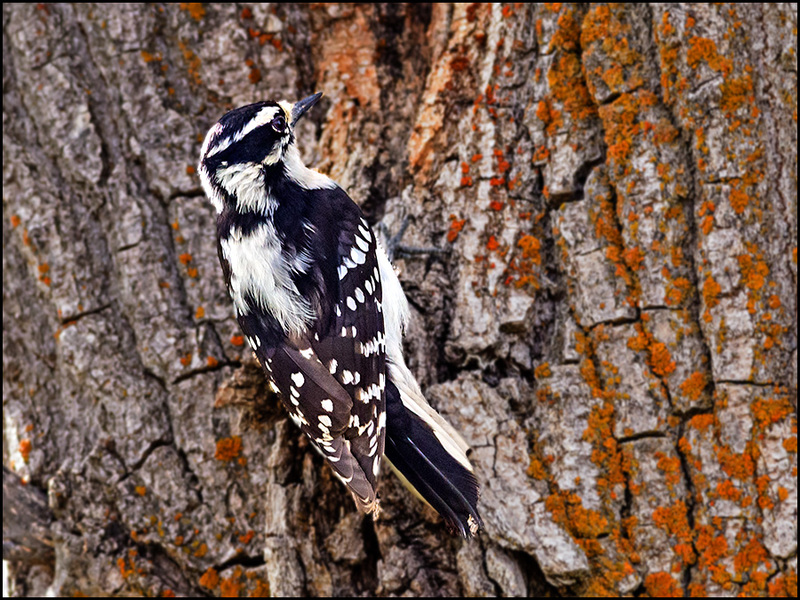 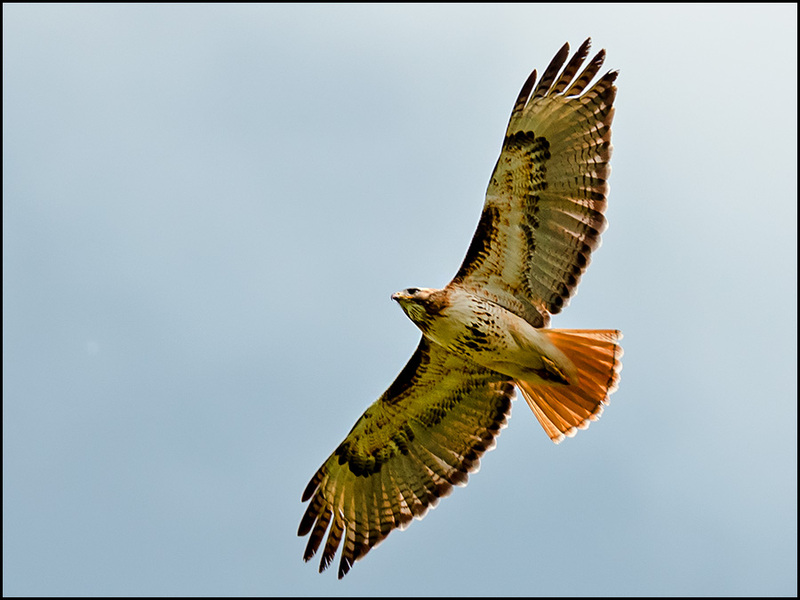 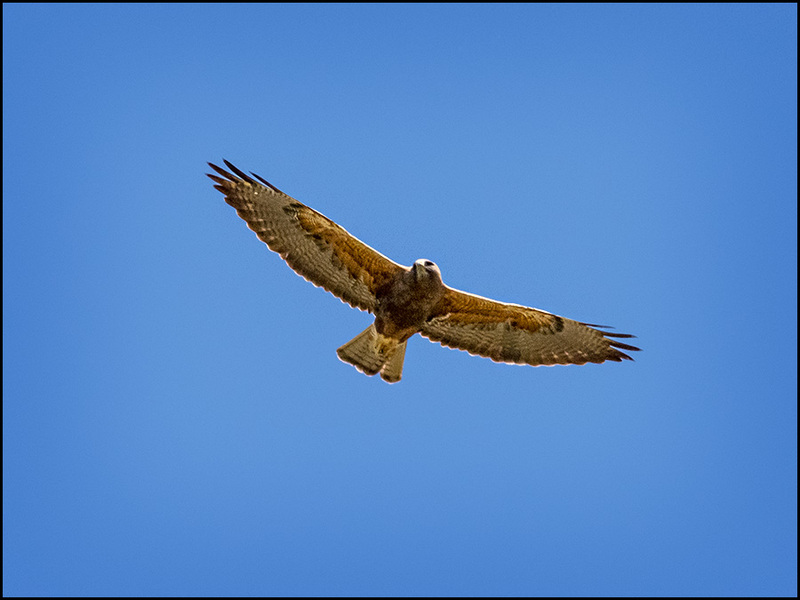 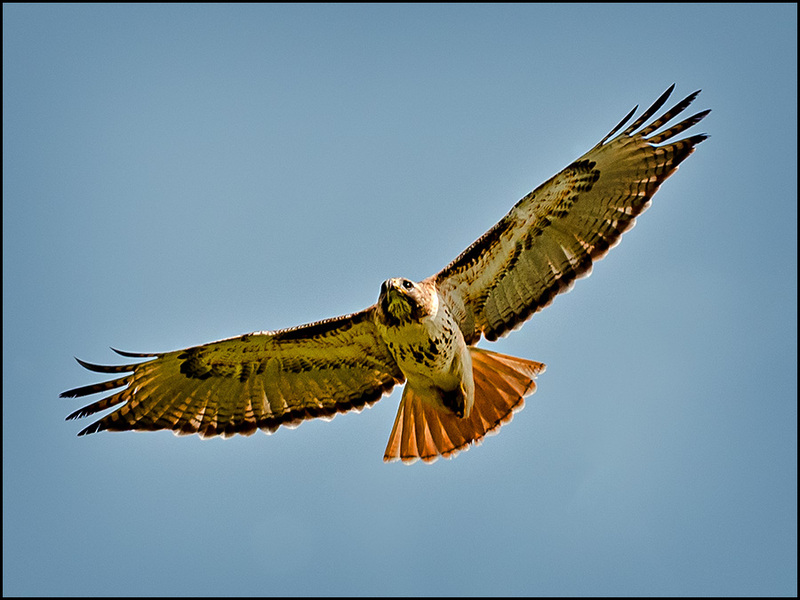 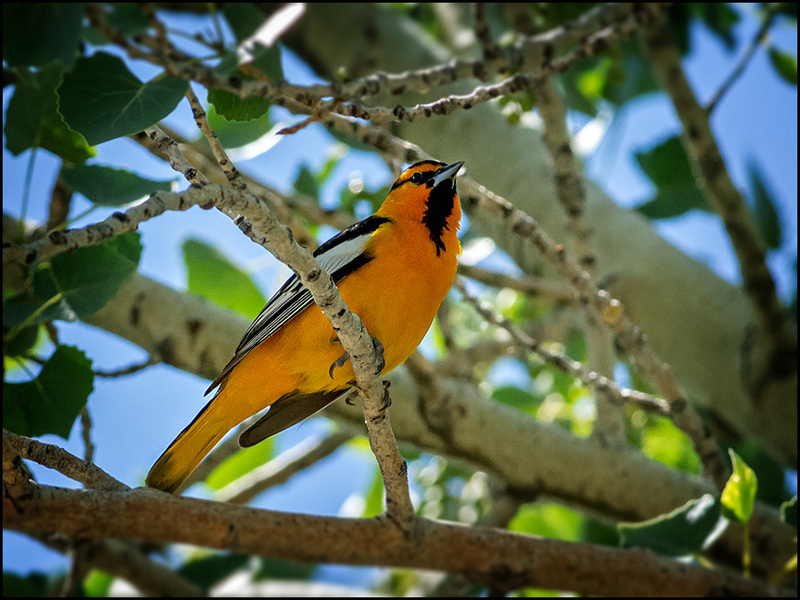 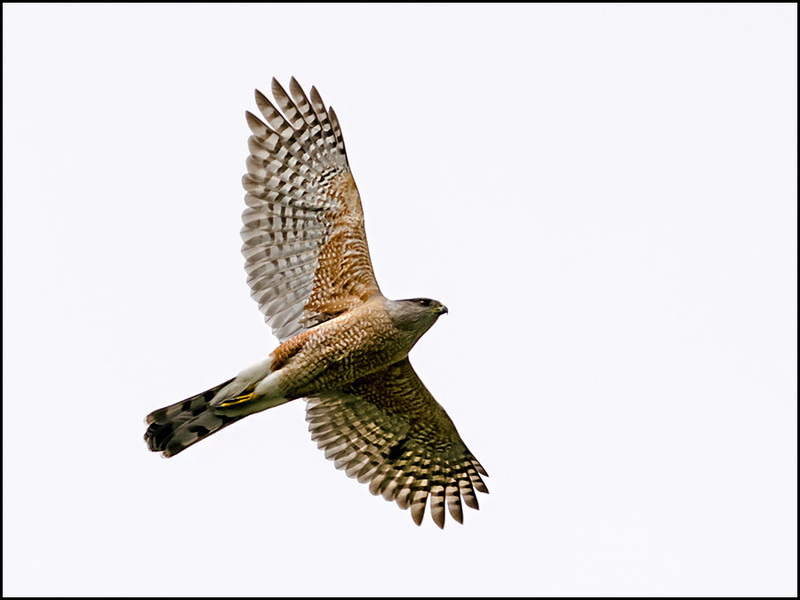 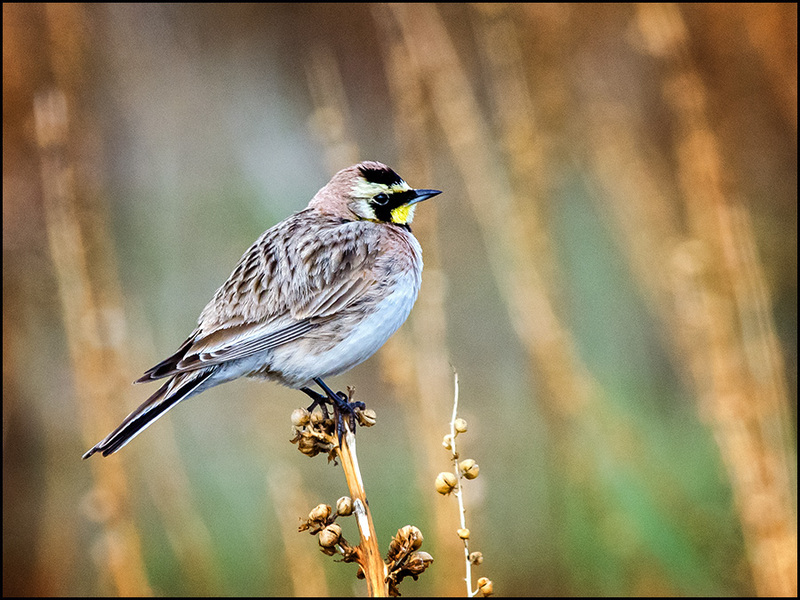 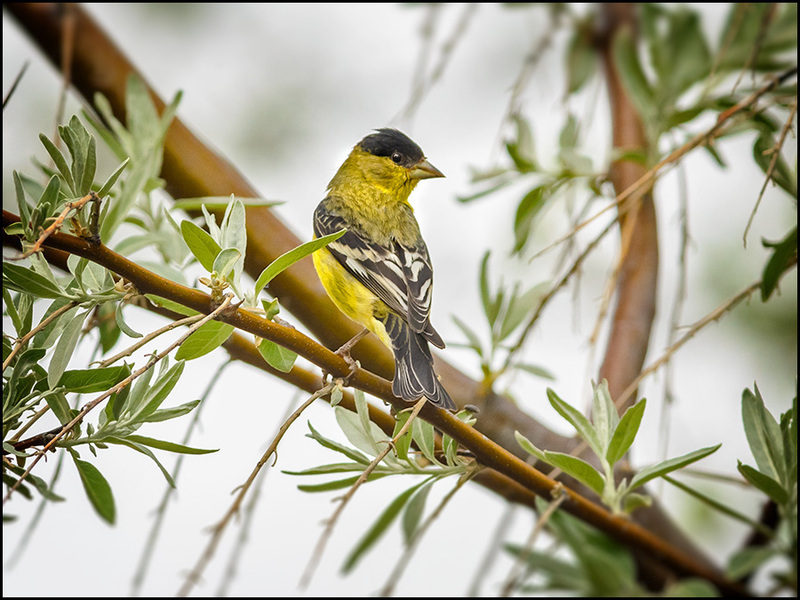 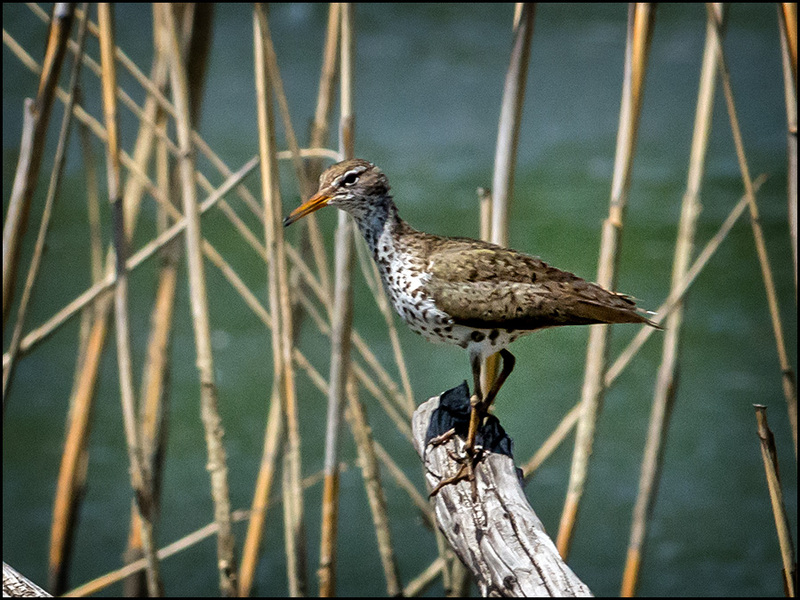 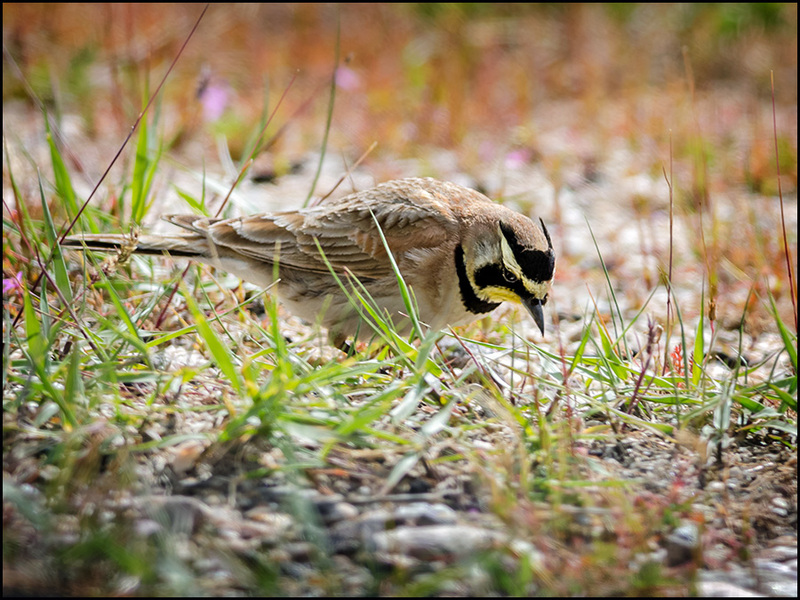 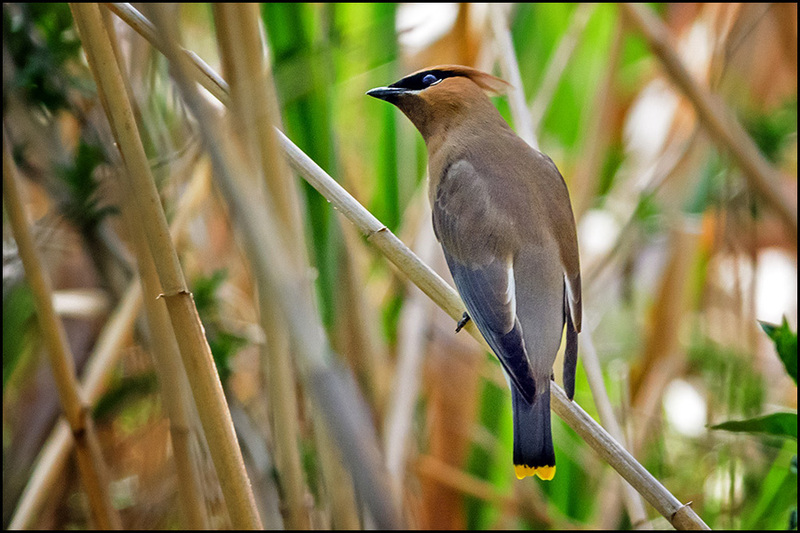 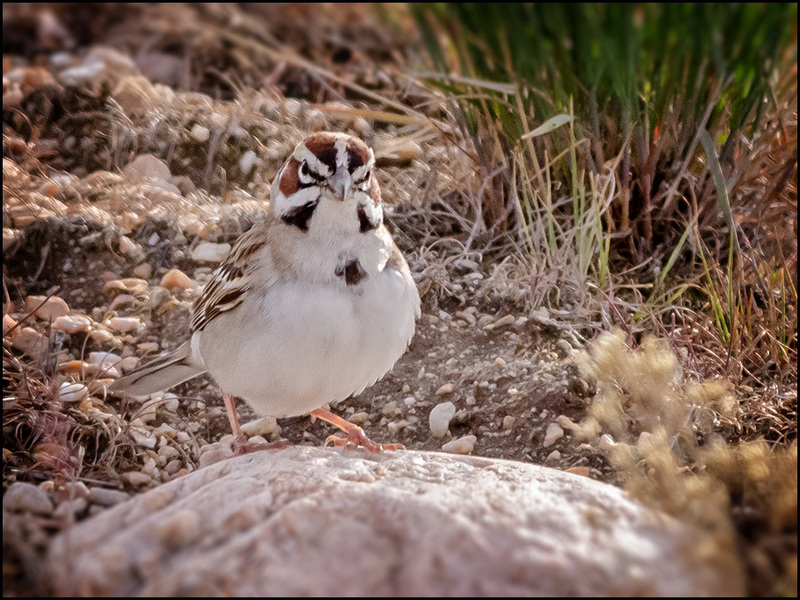 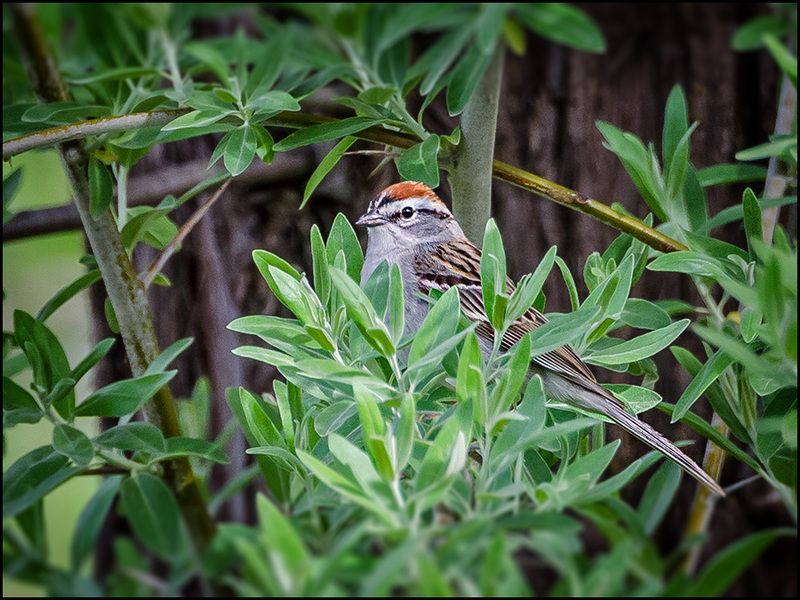 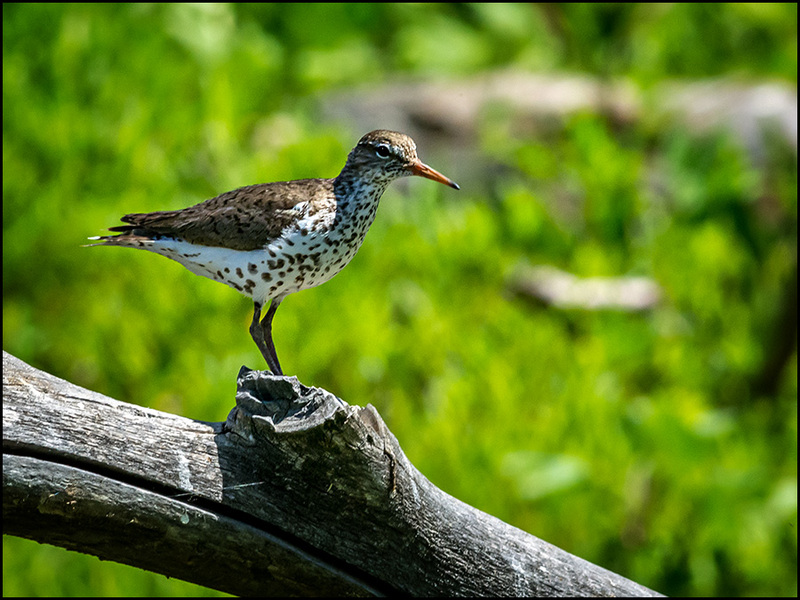 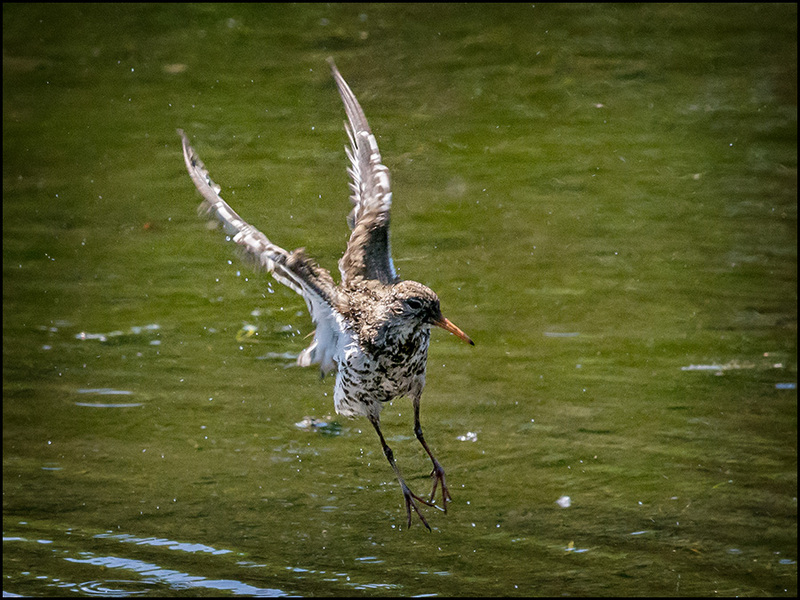 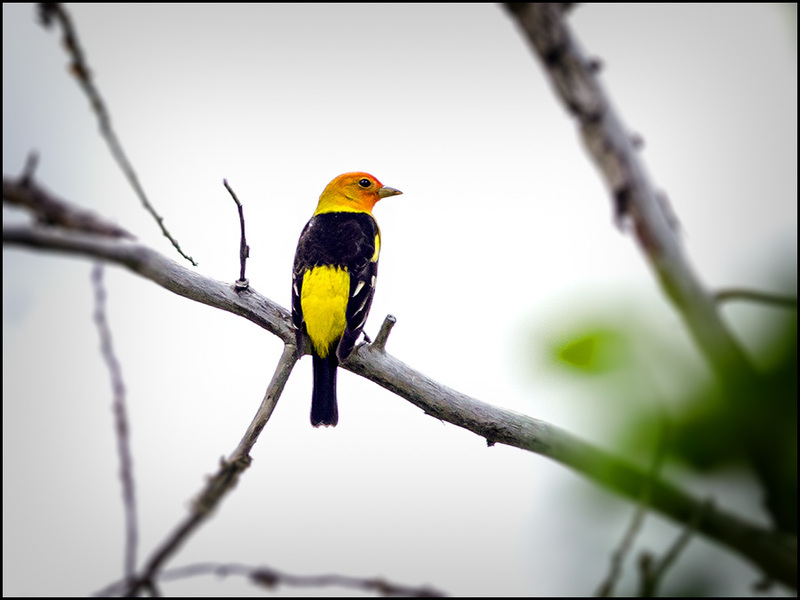 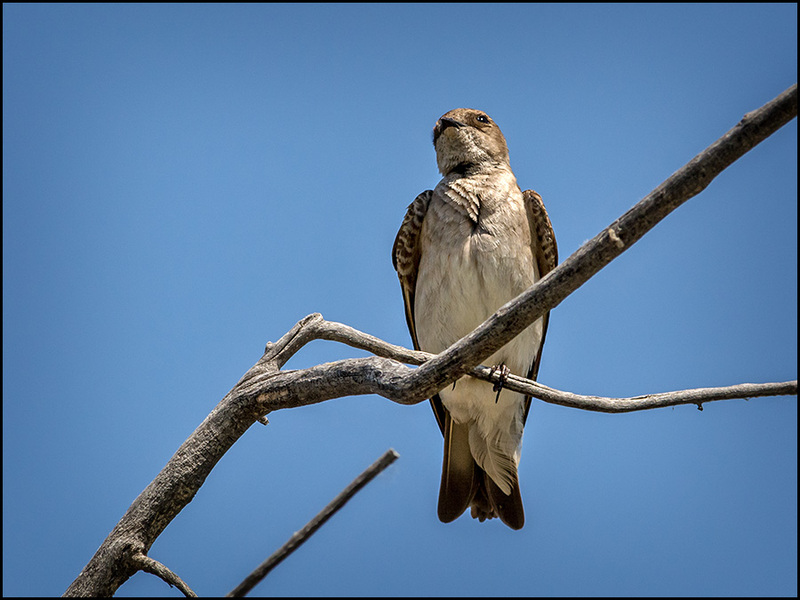 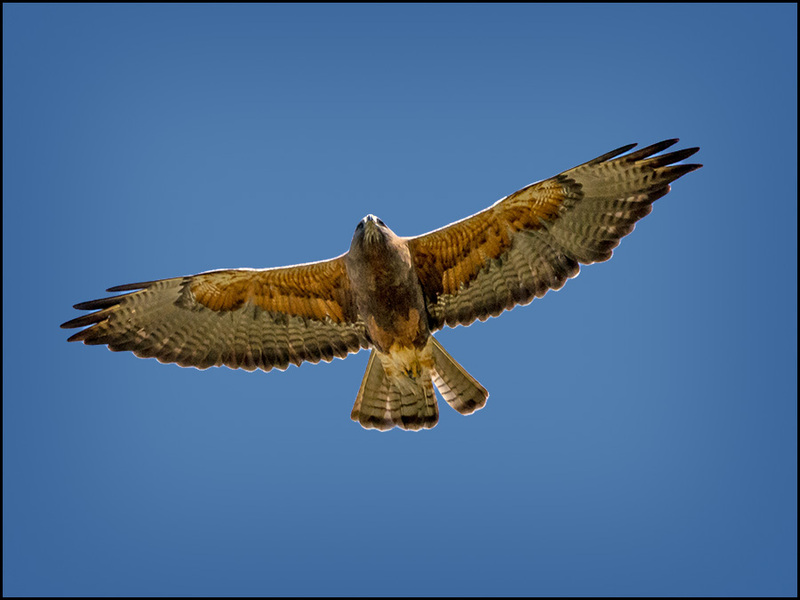 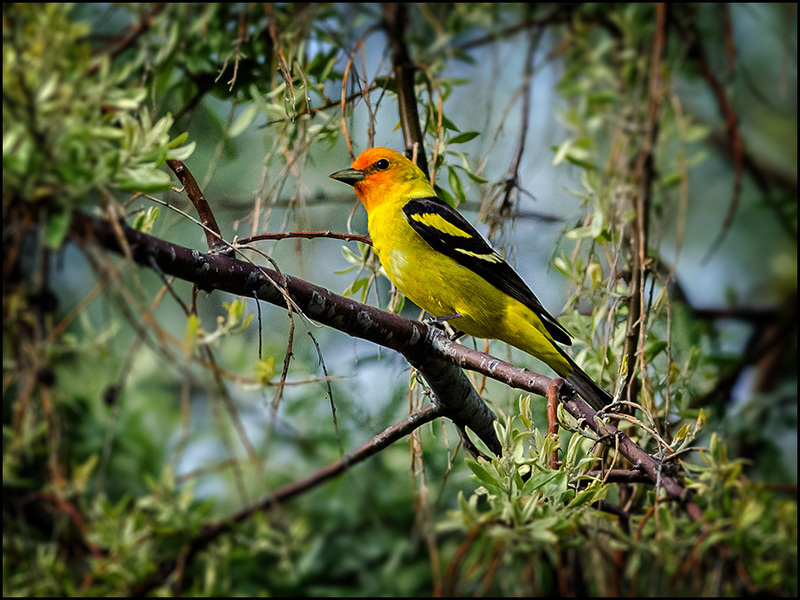 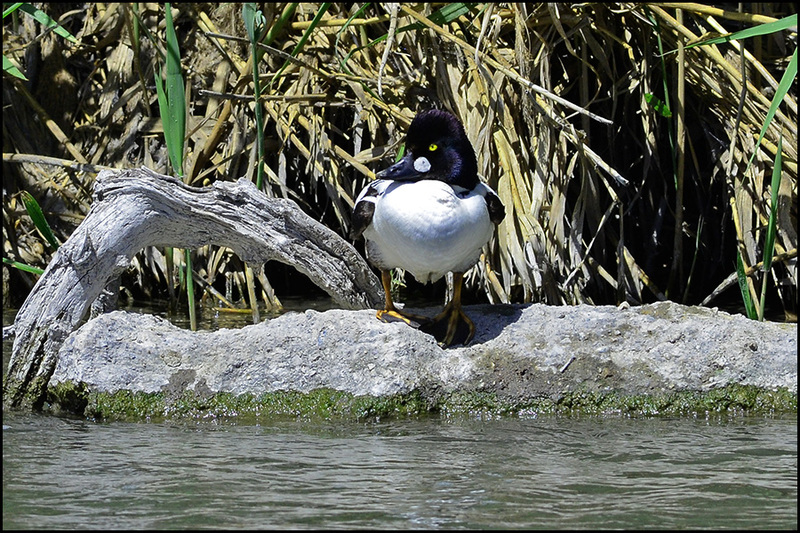 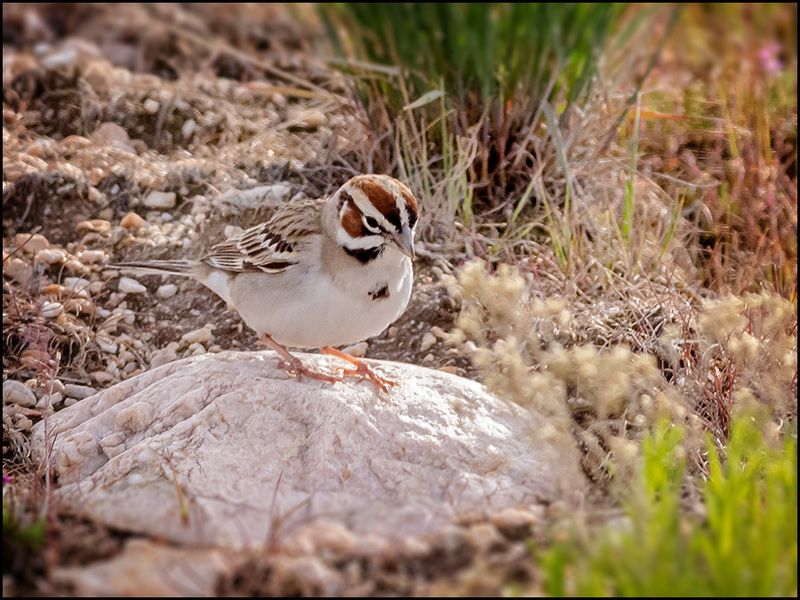 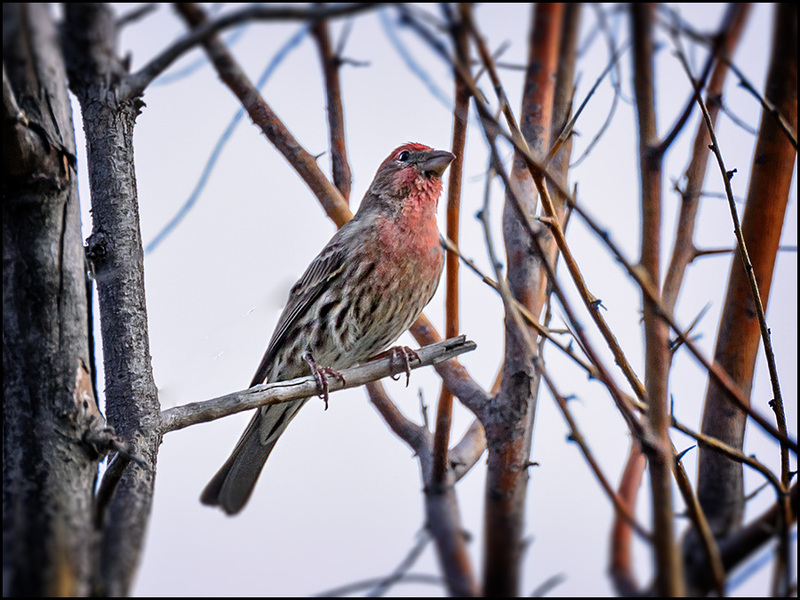 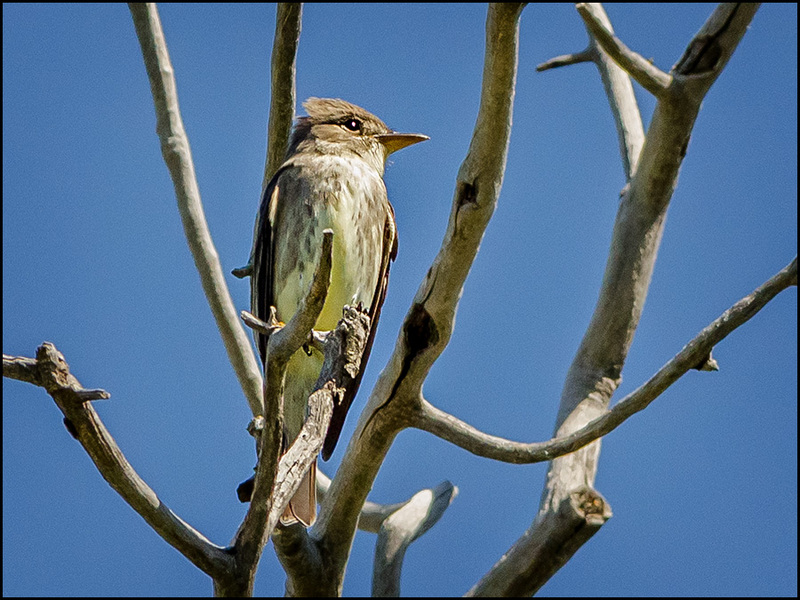 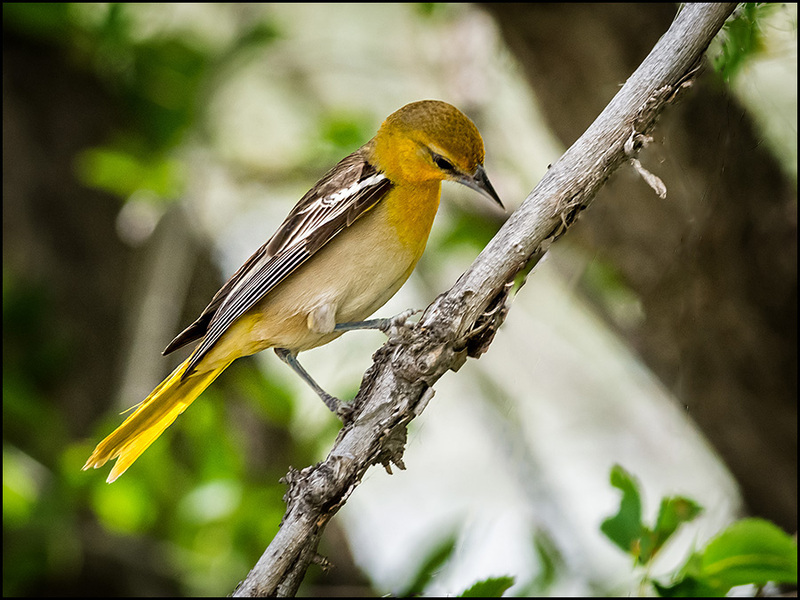 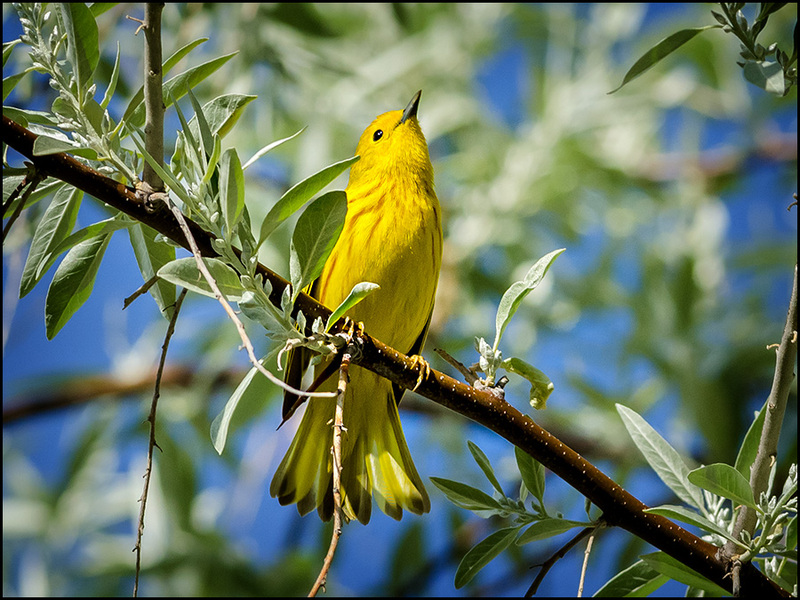 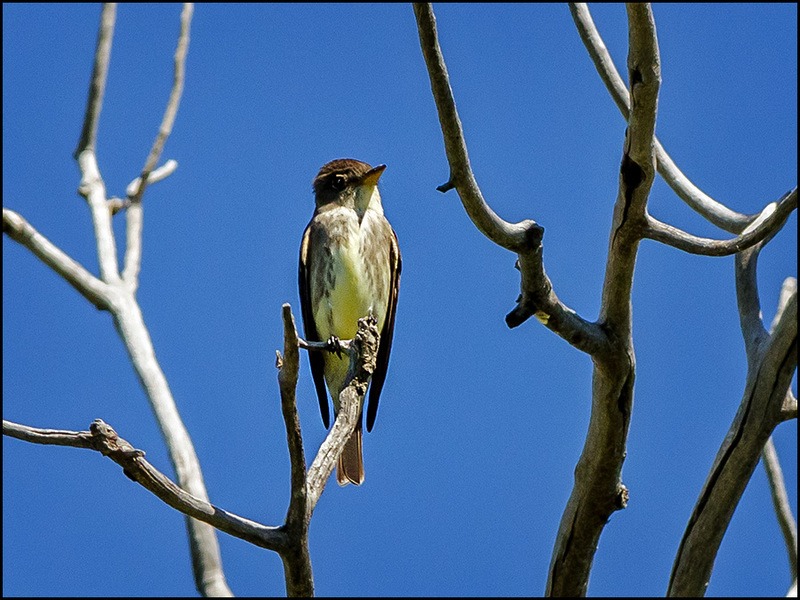 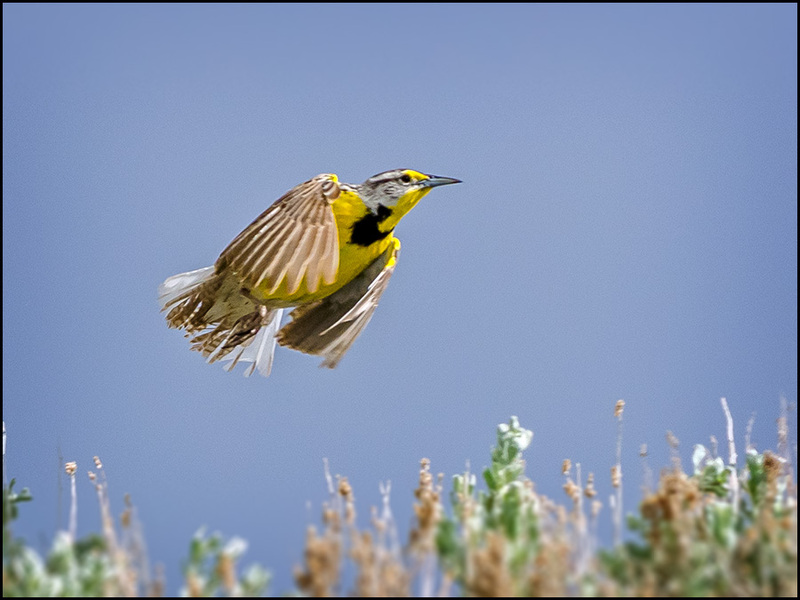 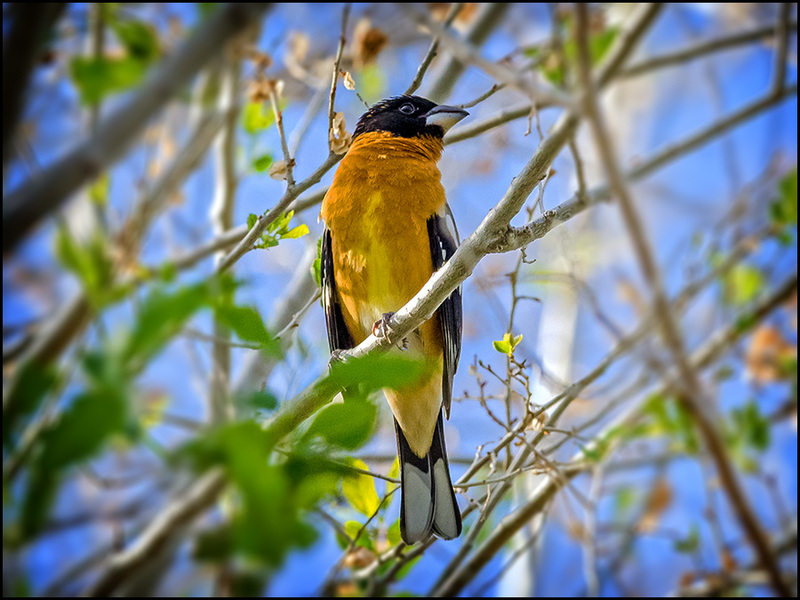 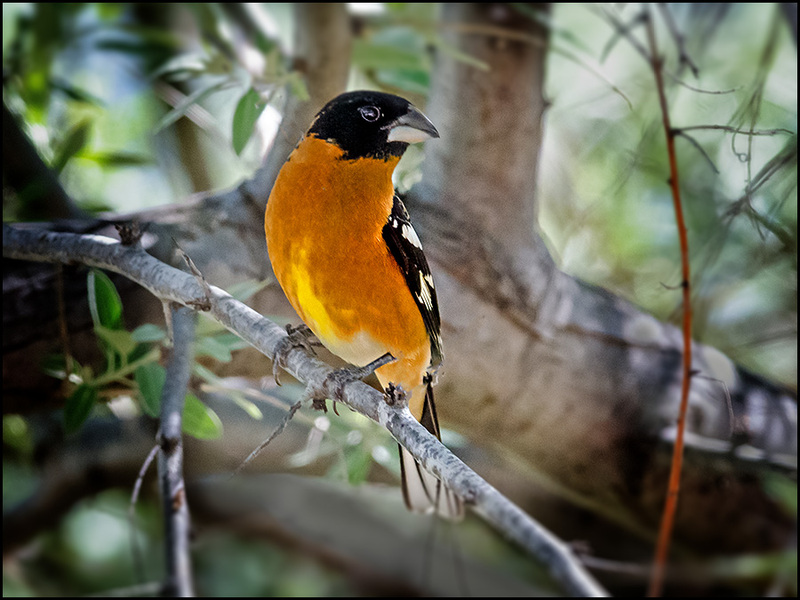 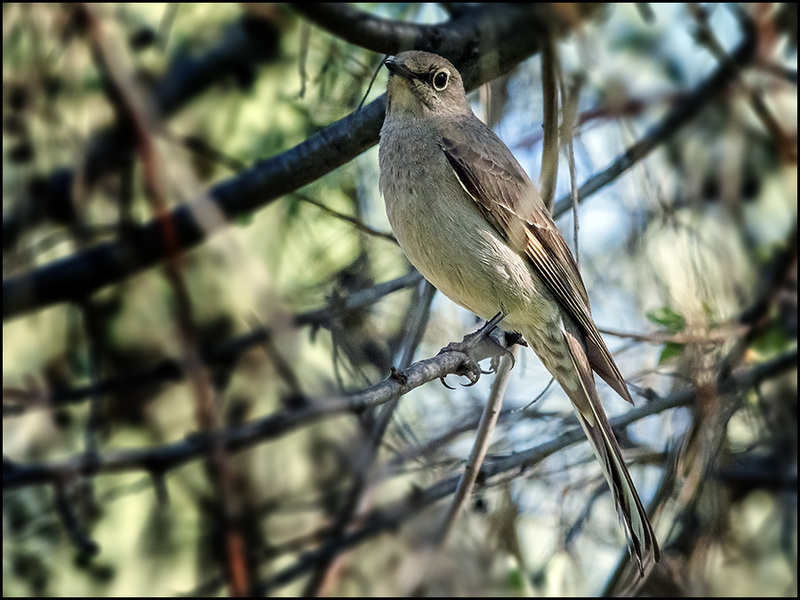 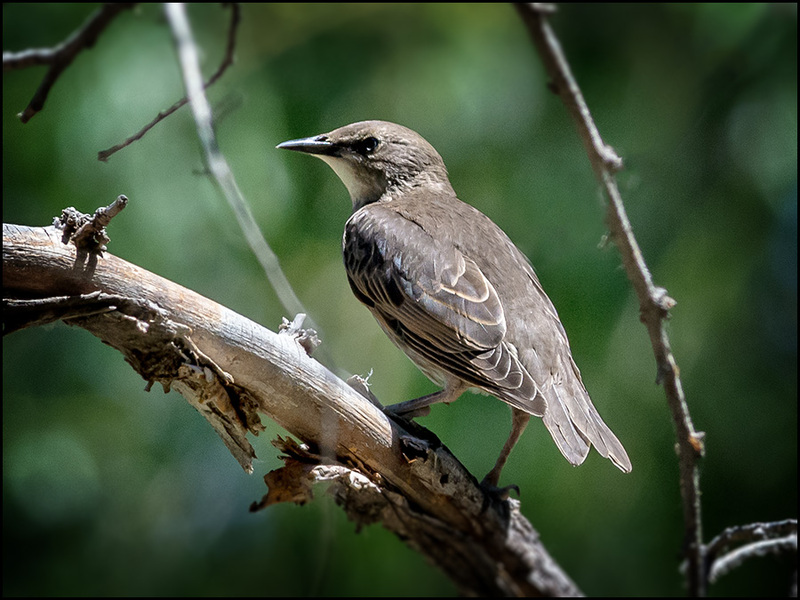 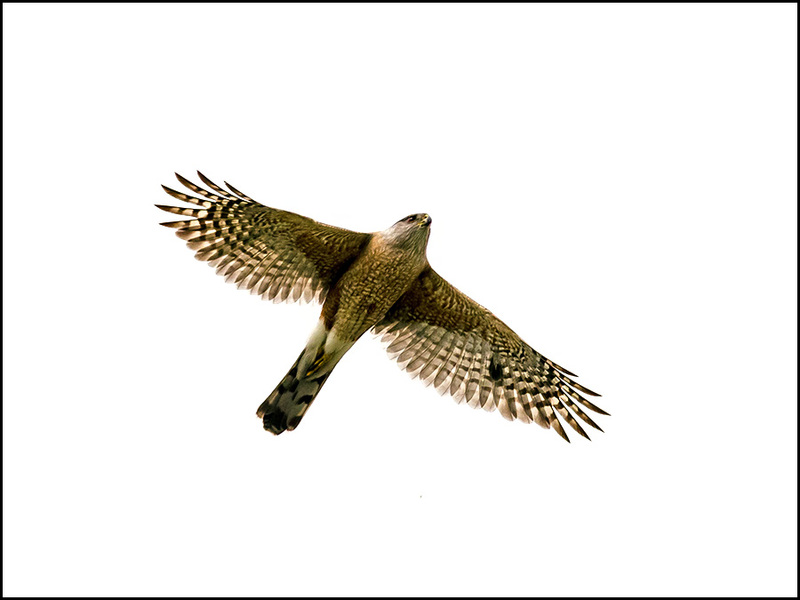 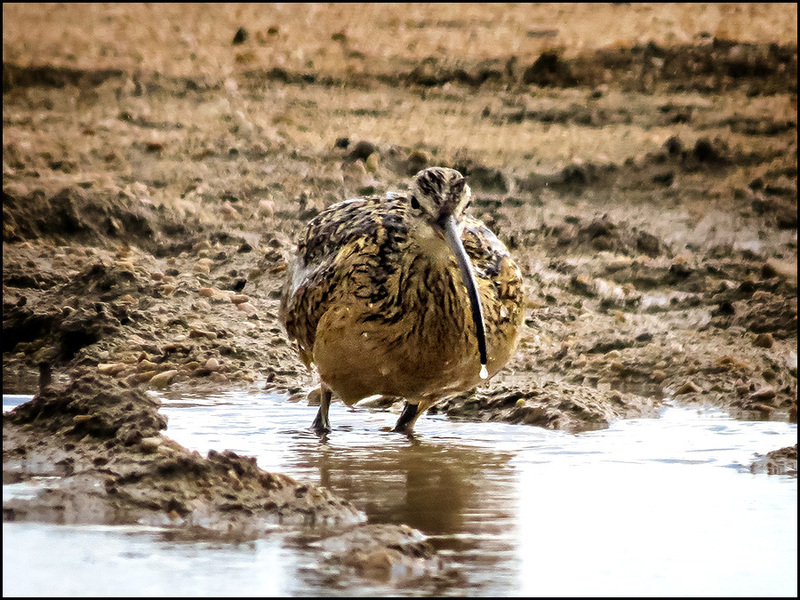 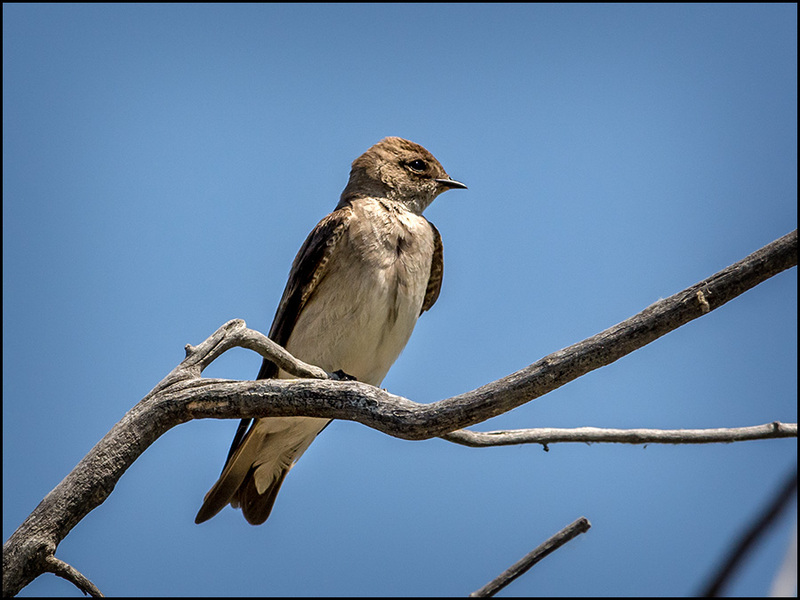 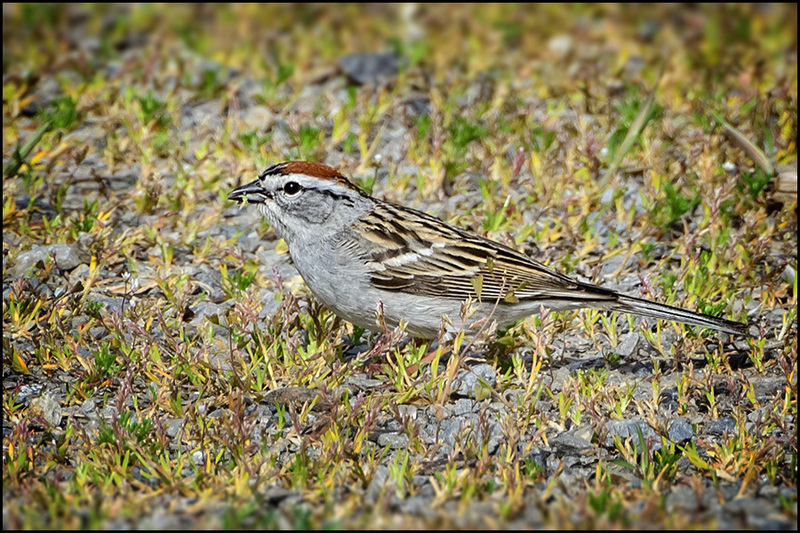 What other birds are appearing at Big Cottonwood Regional Park?! 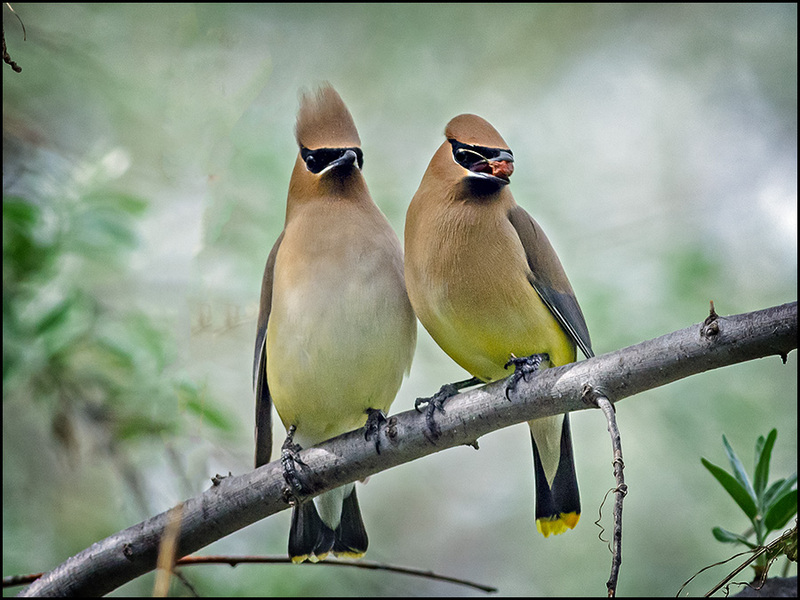 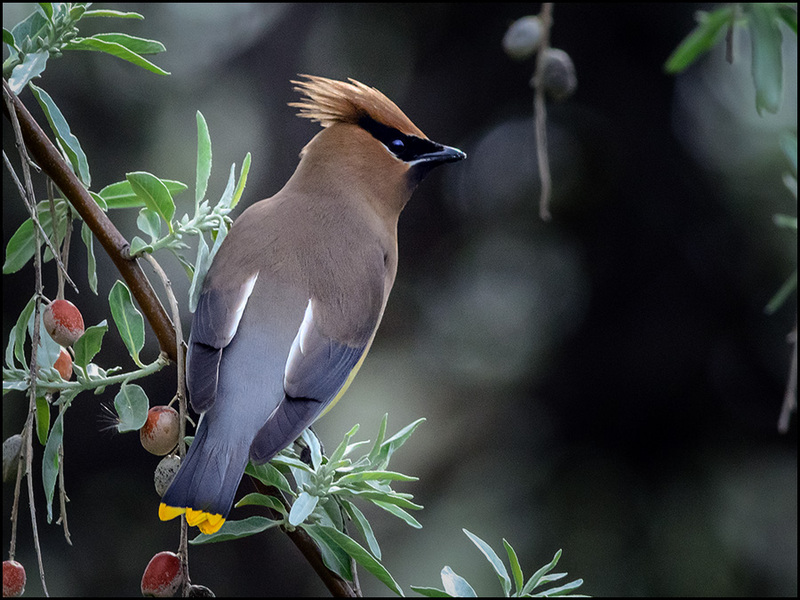 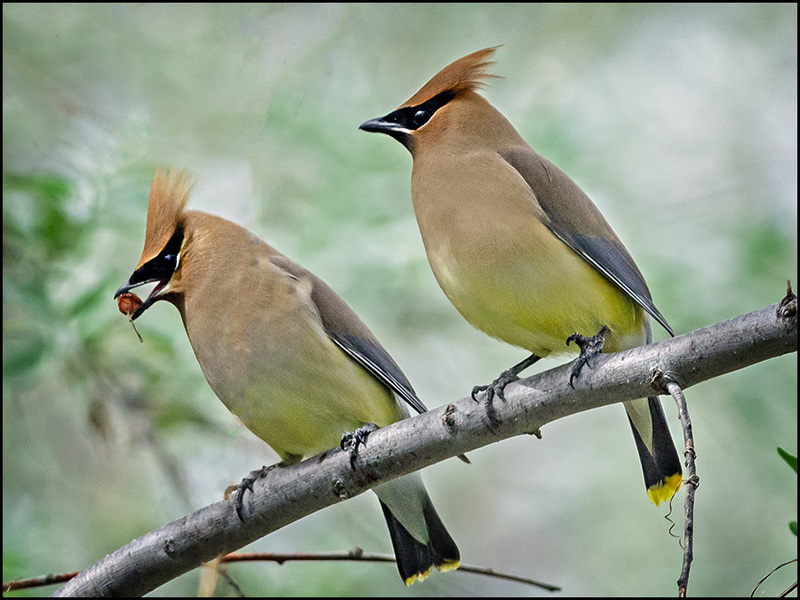 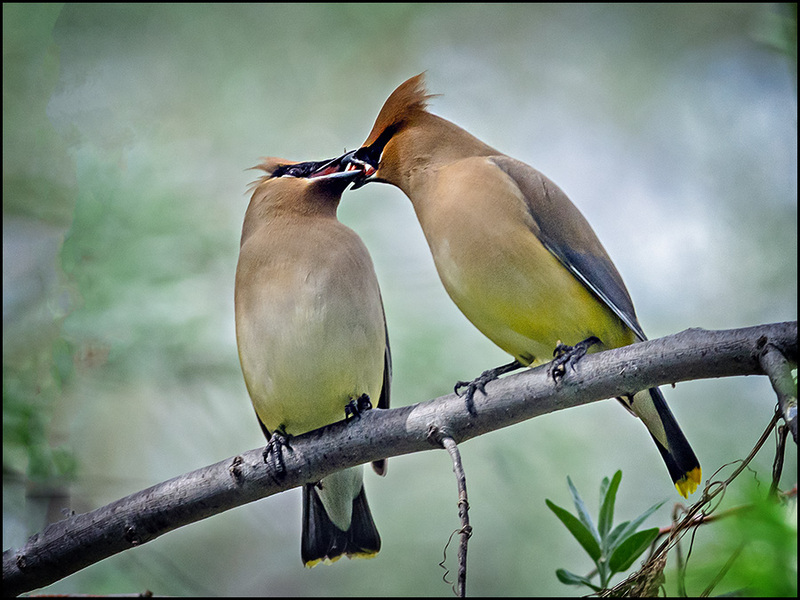 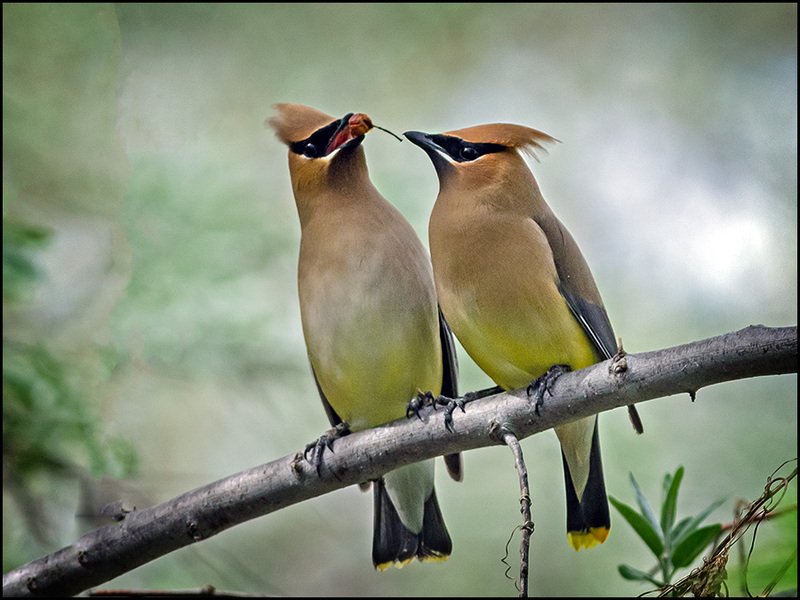 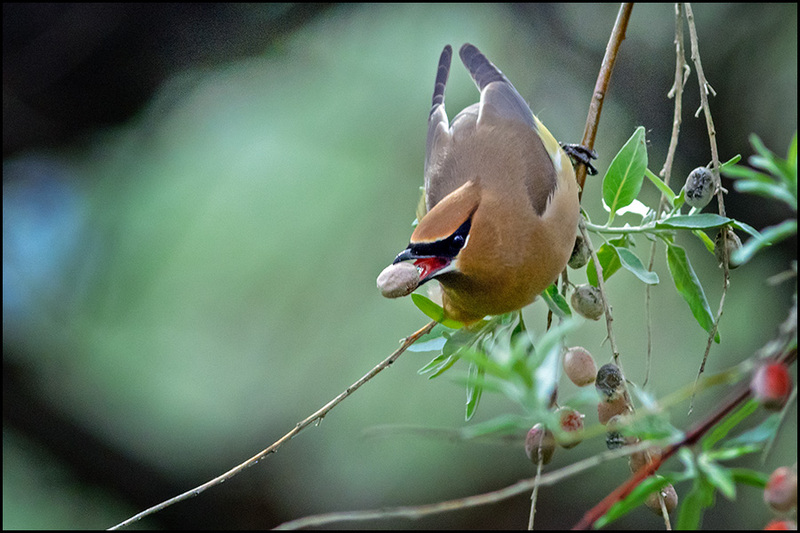 I'm still enjoying collecting more images of Cedar Waxwings! 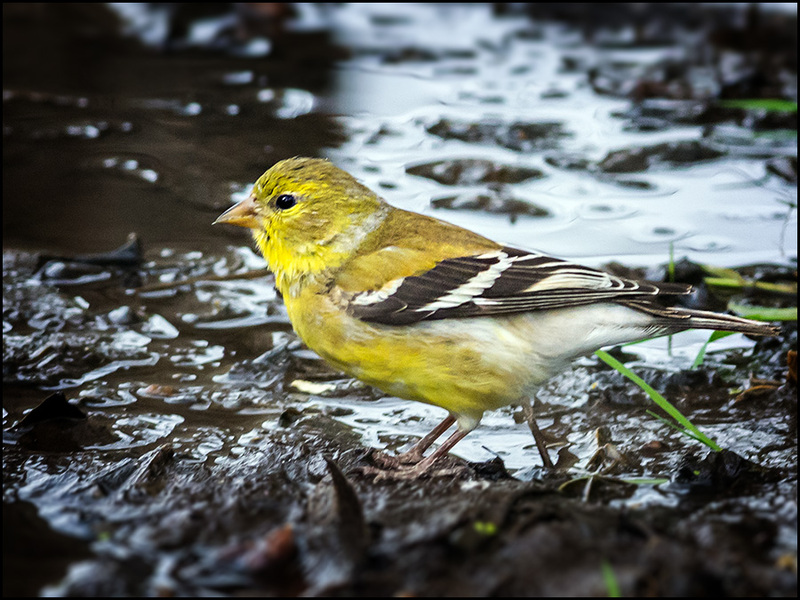 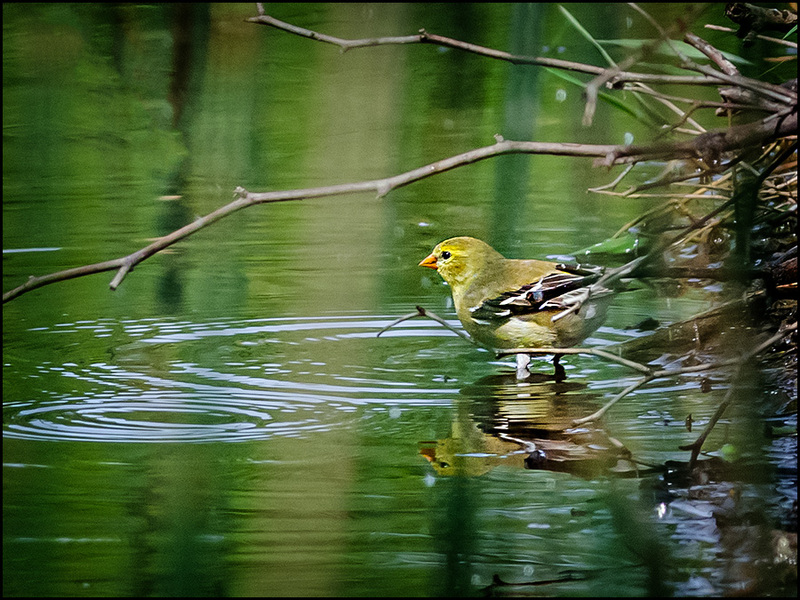 Here is an image of an American Goldfinch, apparently still molting! 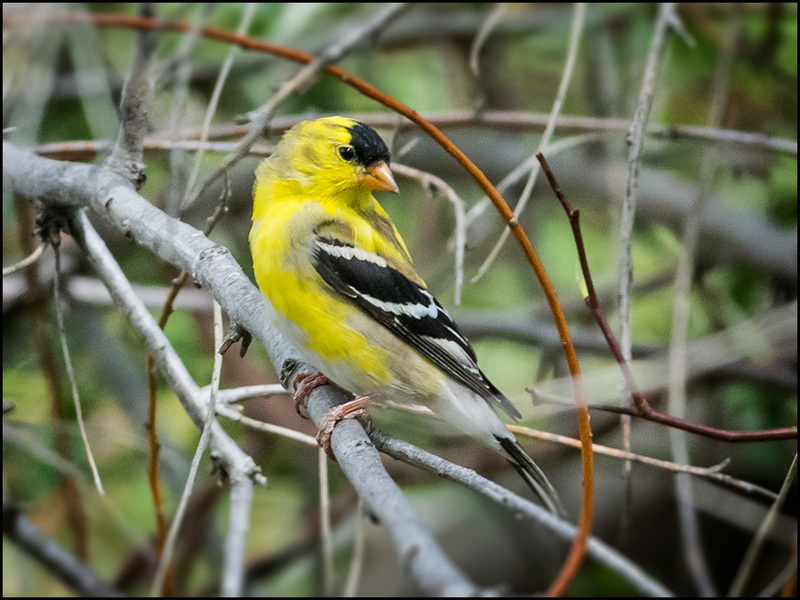 Here is another American Goldfinch, apparently still in Winter plumage! 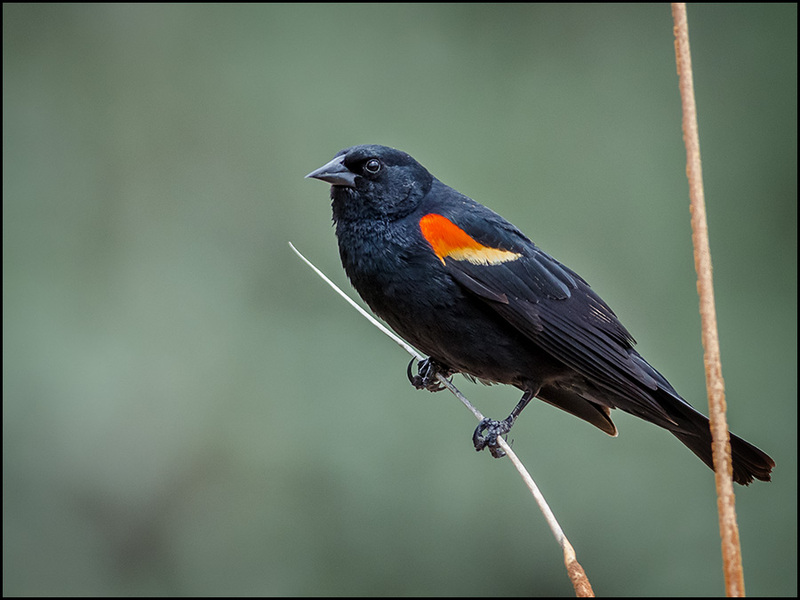 Paired Redwing Blackbirds are everywhere on the pond! 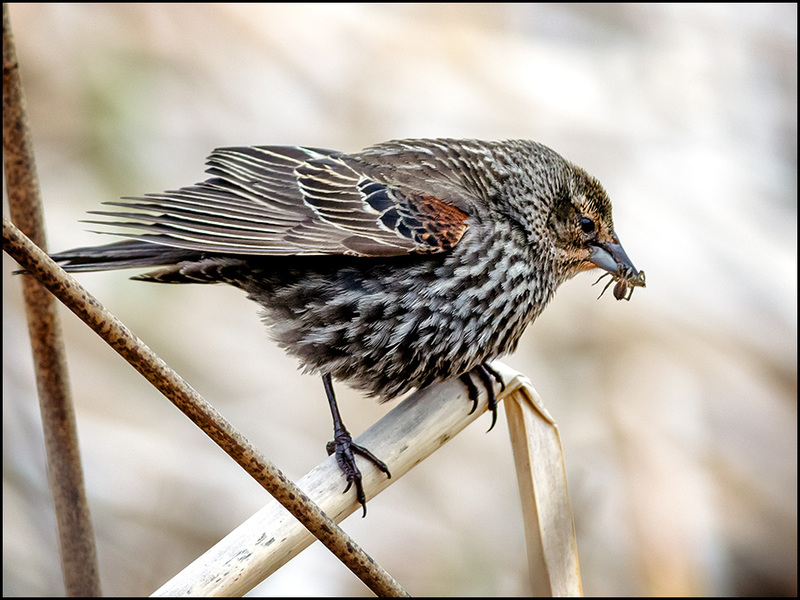 Female Redwing Blackbird with spider for her young! 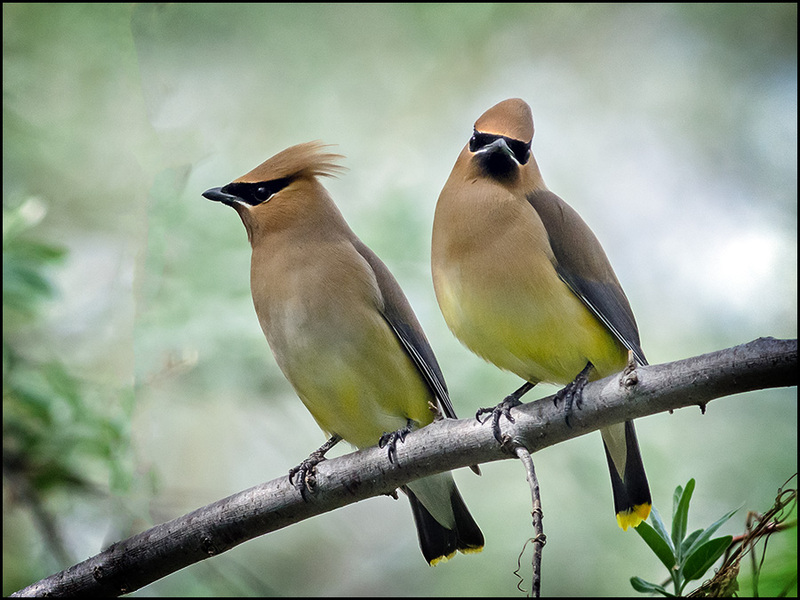 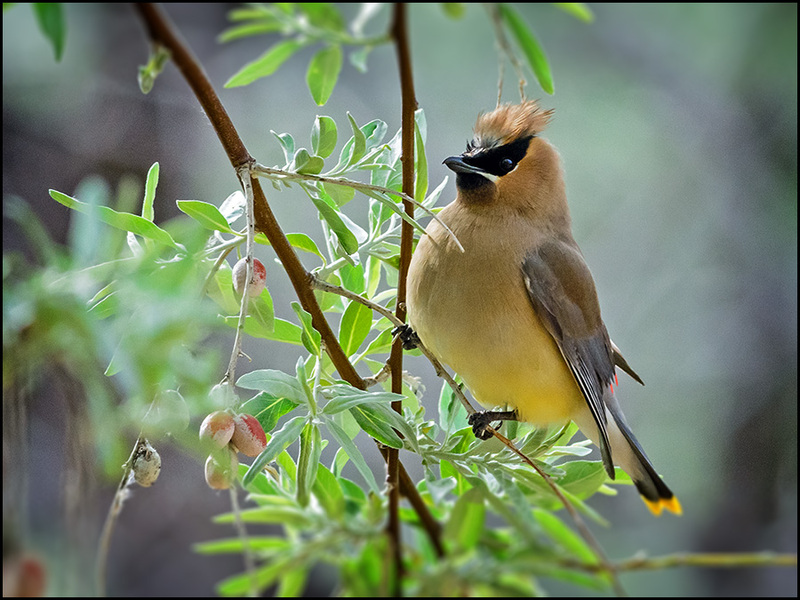 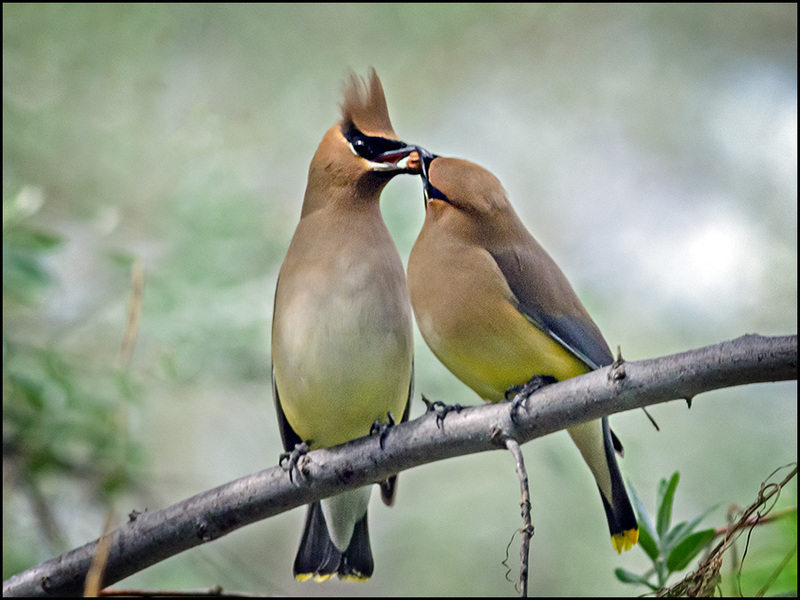 Big Cottonwood Park is inundated with Cedar Waxwings! 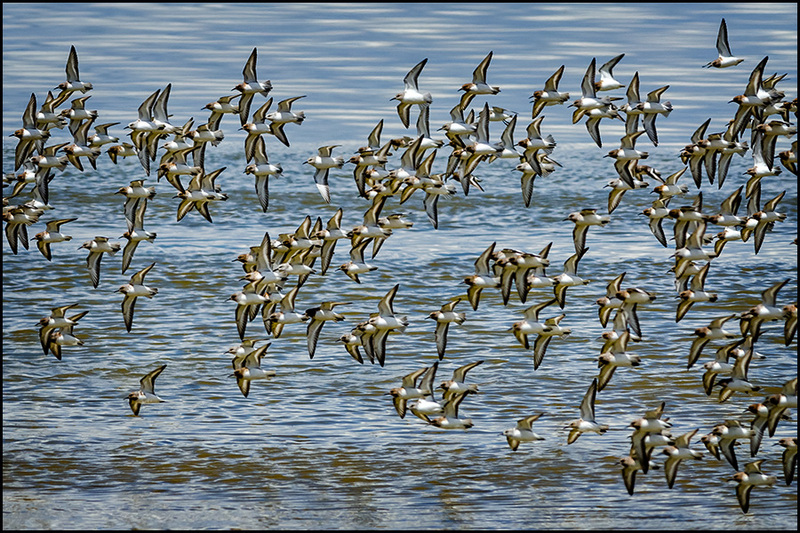 They number in the hundreds; and when one flock became airborne it was awesome! 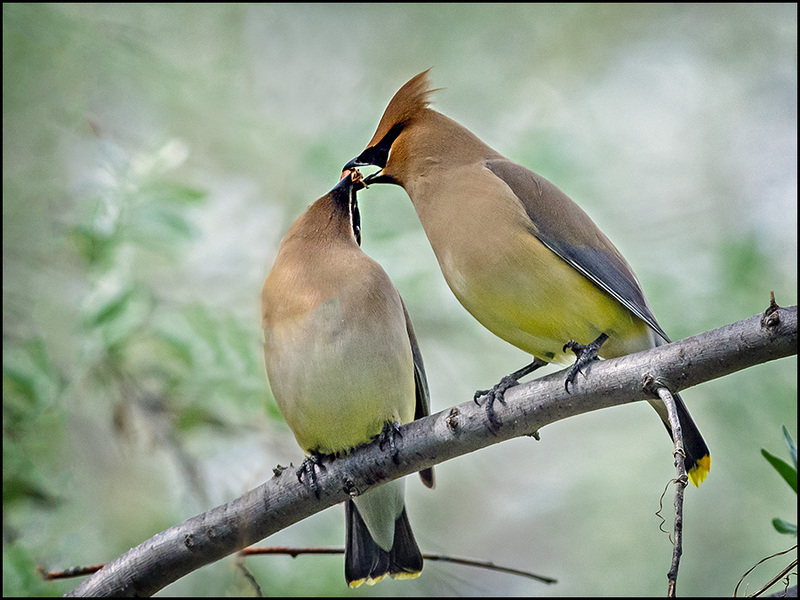 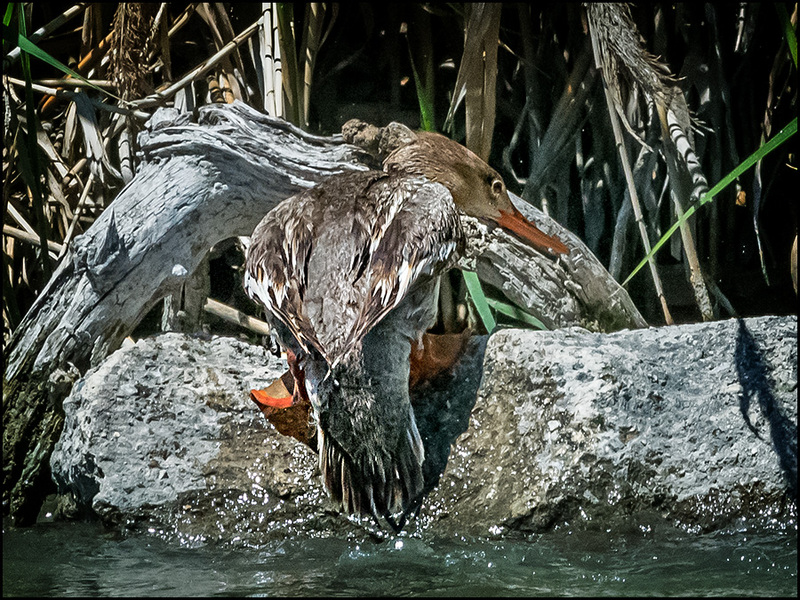 I photographed 2 of them, demonstrating their traditional courtship behavior, with the male offering food to the female! 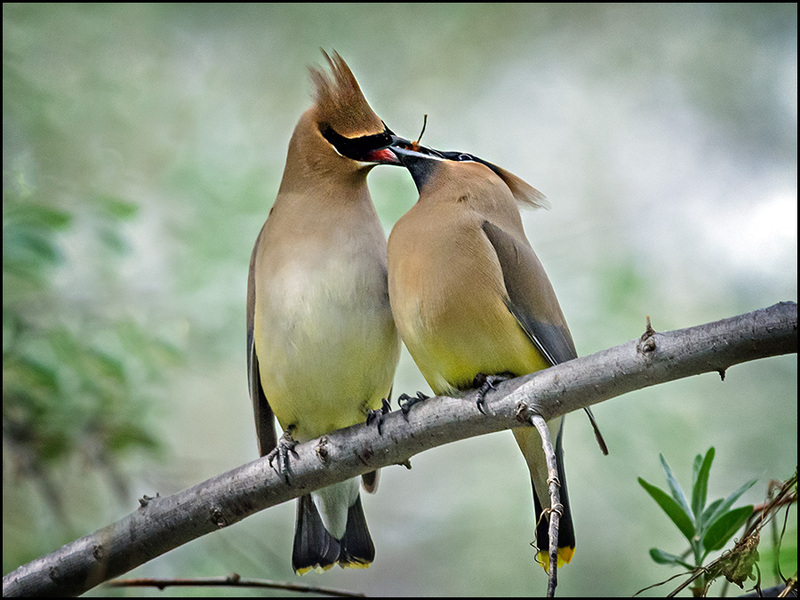 What was very noticeable was the tactile character seen in this courtship behavior... the birds would step sideways on the limb and 'bump' into each other, then hold their close, touching position! 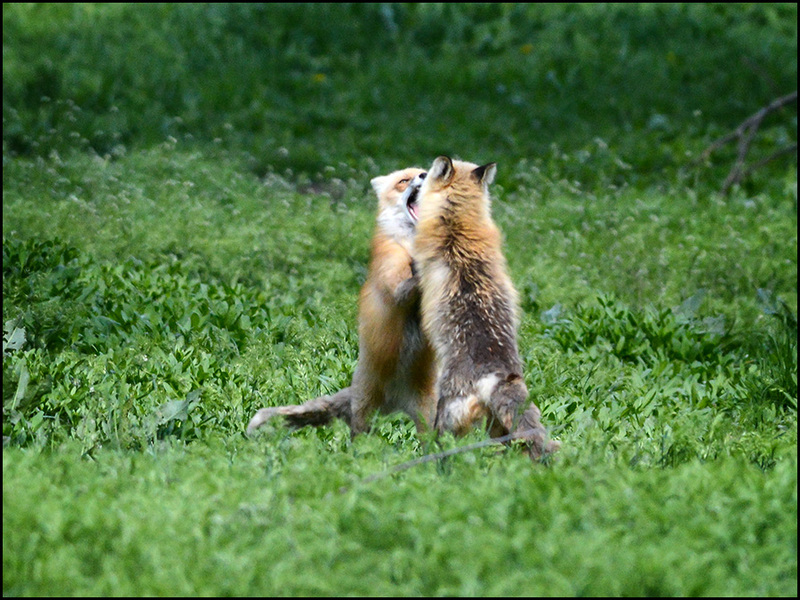 Notice the 'touching' going on here... it was part of the process. 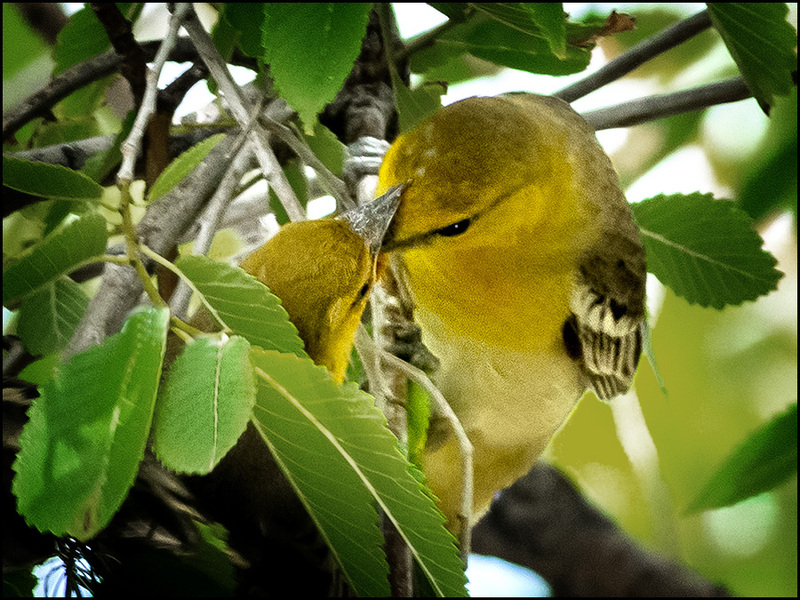 At this point, the female (L) decided to swallow the morsel! 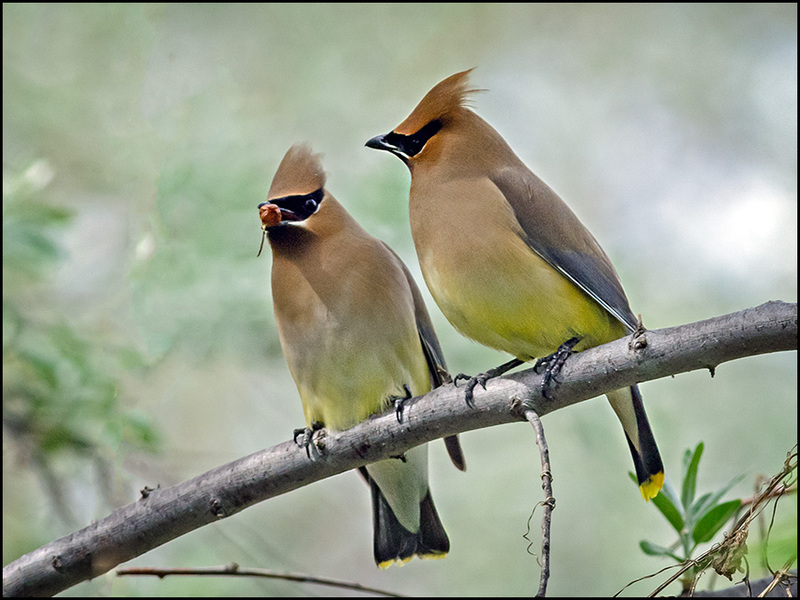 I laughed when the male (R) tilted his head in apparent despair. 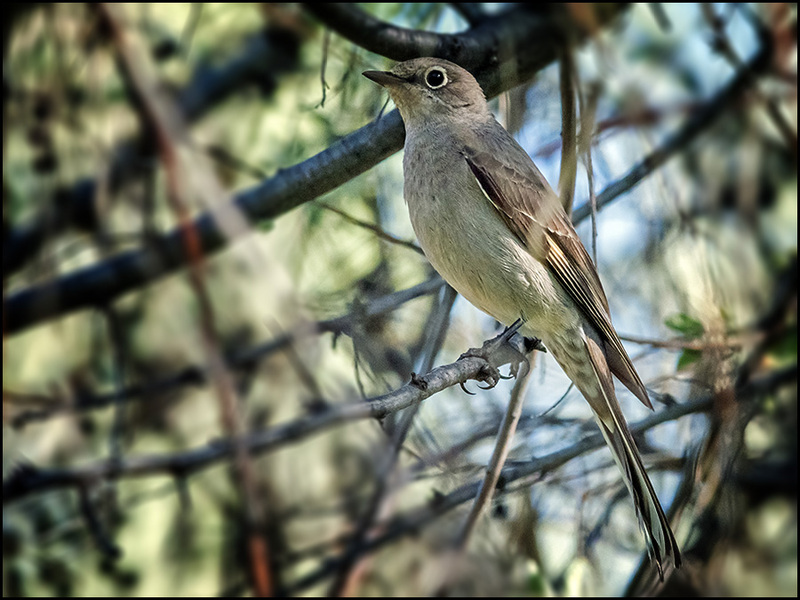 I was in Big Cottonwood Park for only a brief moment, but long enough for me to photograph my 1st Townsend's Solitaire at that location!